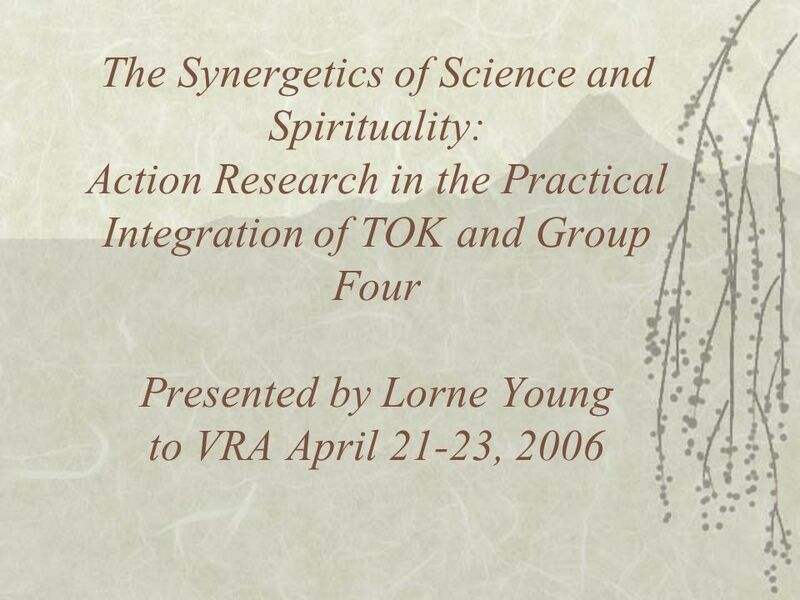 The Synergetics of Science and Spirituality: Action Research in the Practical Integration of TOK and Group Four Presented by Lorne Young to VRA April. 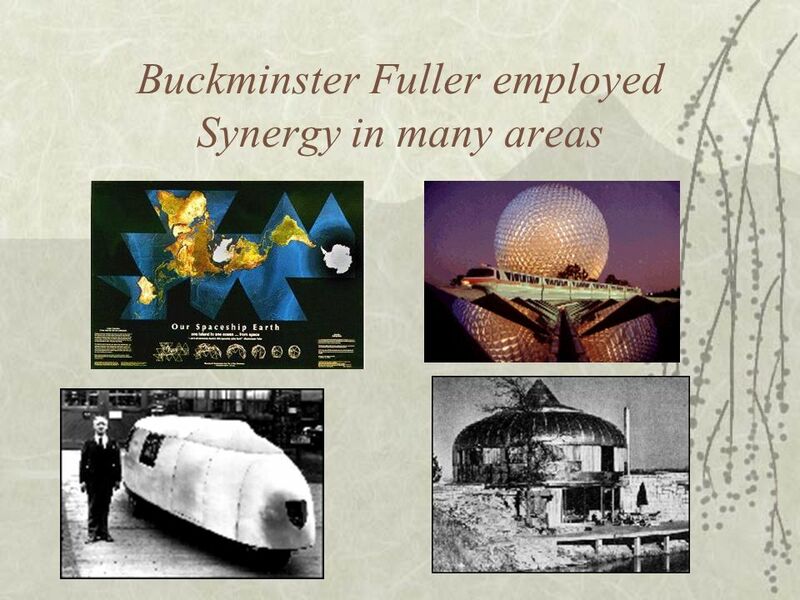 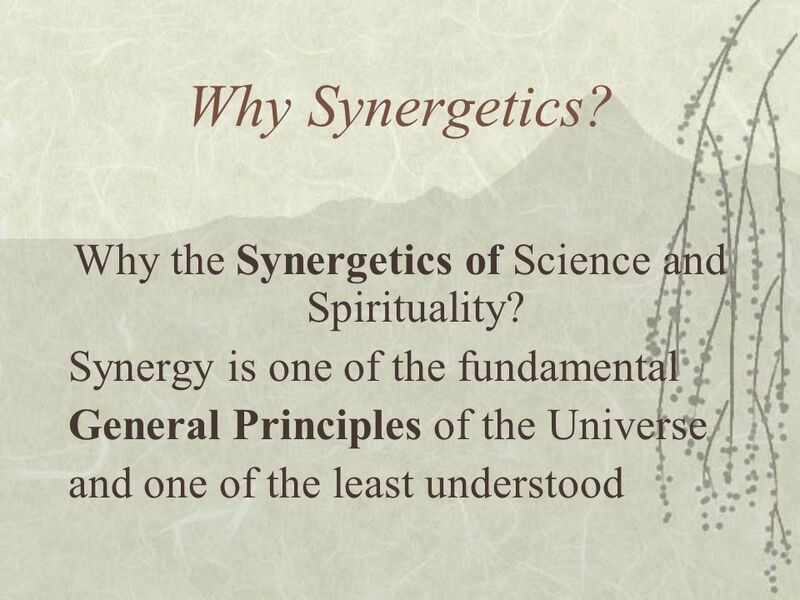 2 Why the Synergetics of Science and Spirituality? 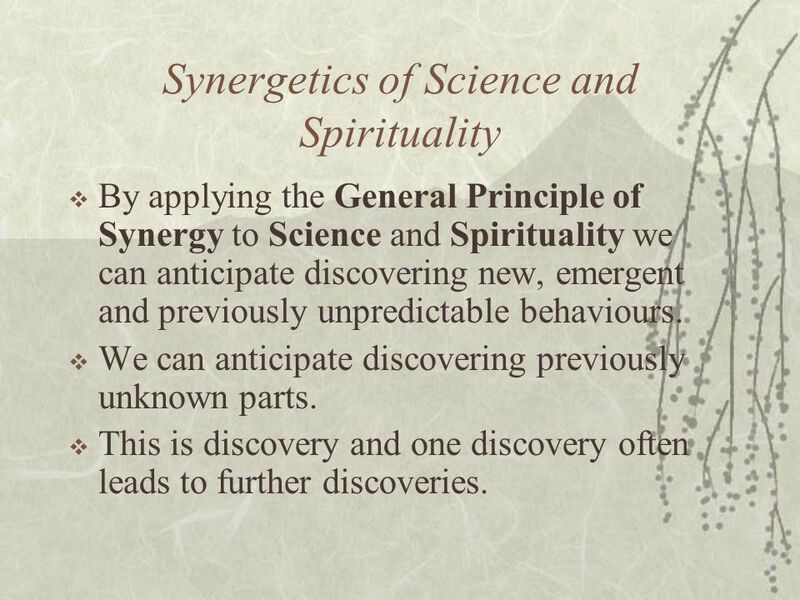 By applying the General Principle of Synergy to Science and Spirituality we can anticipate discovering new, emergent and previously unpredictable behaviours. 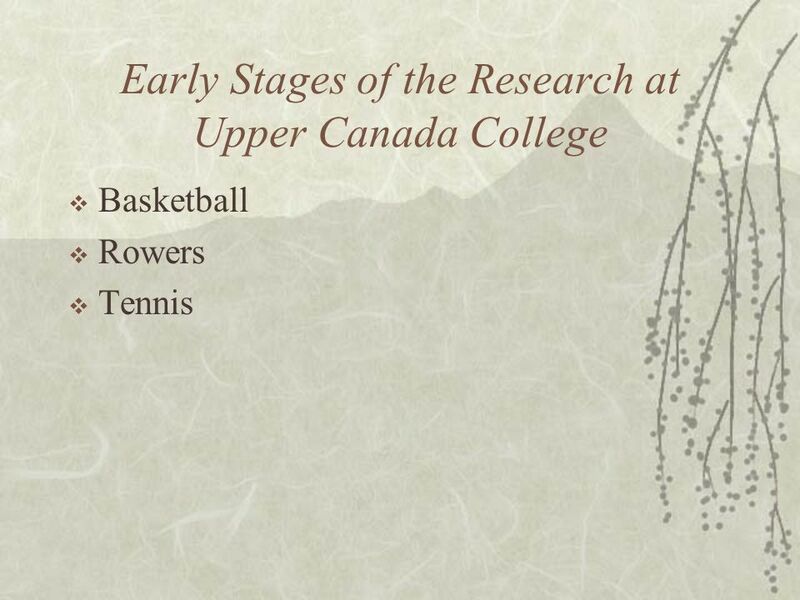 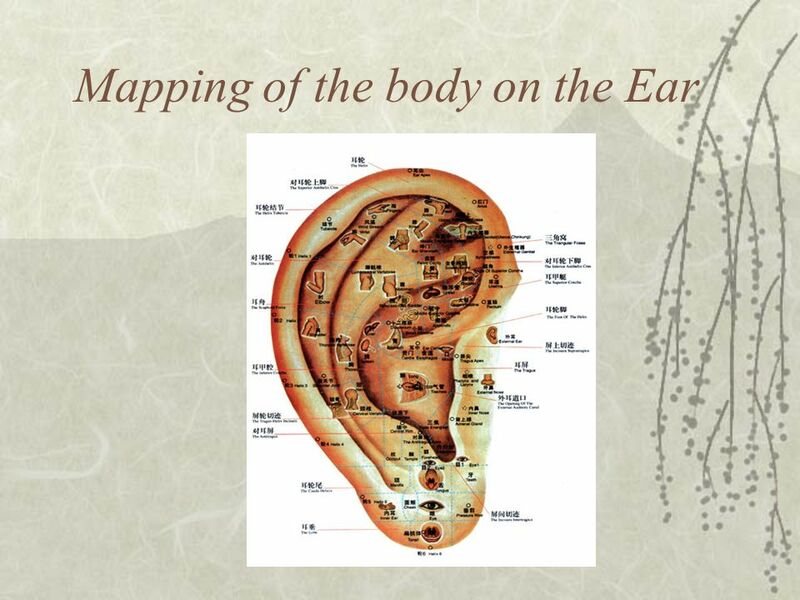 We can anticipate discovering previously unknown parts. 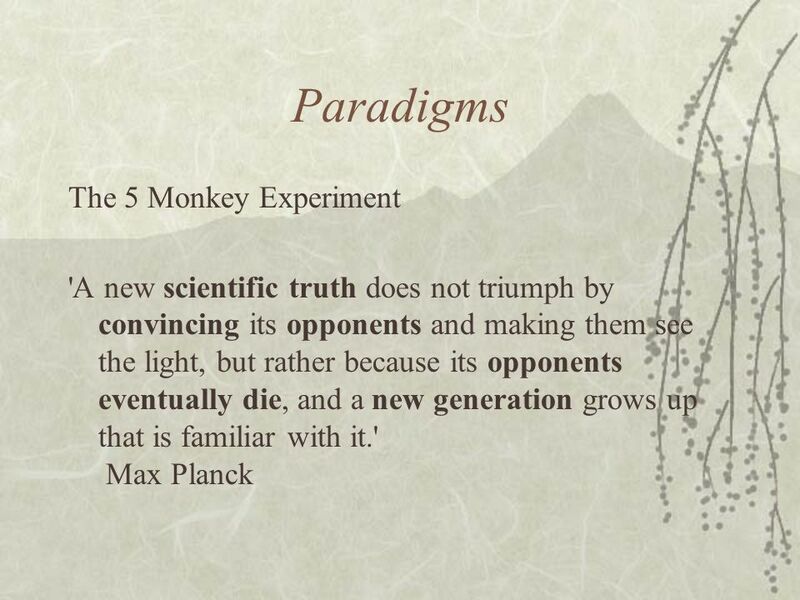 This is discovery and one discovery often leads to further discoveries. 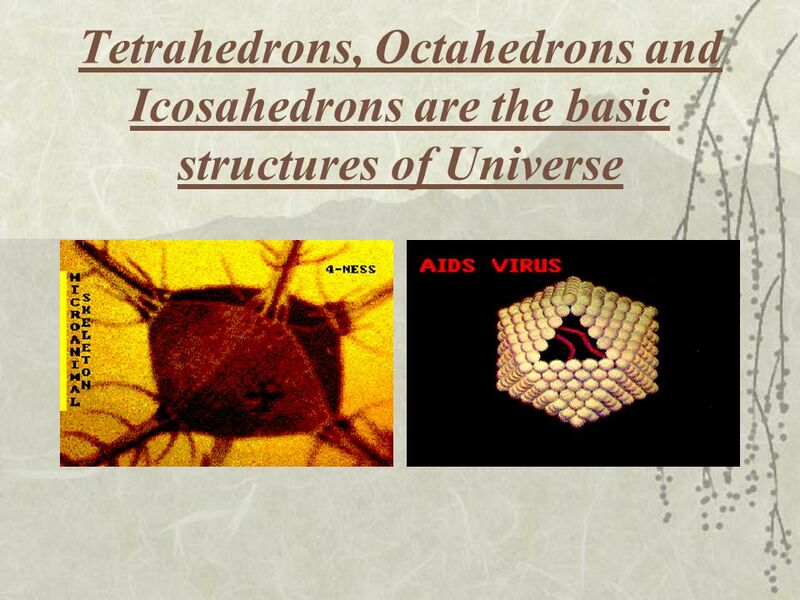 7 TOK Science What do we know? 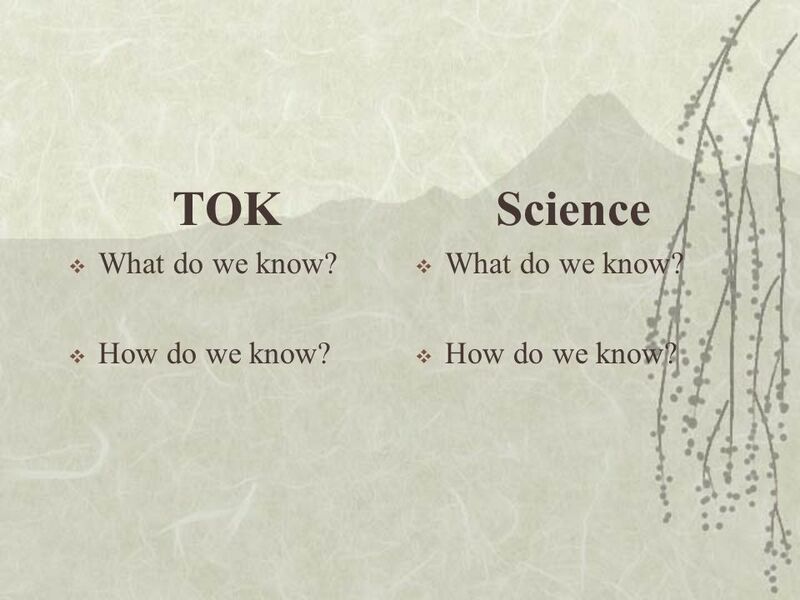 How do we know? 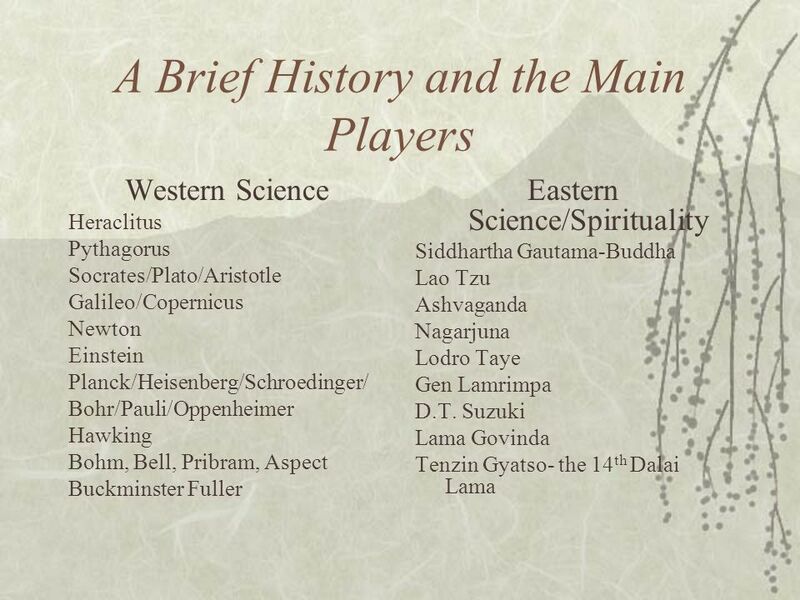 What do we know? 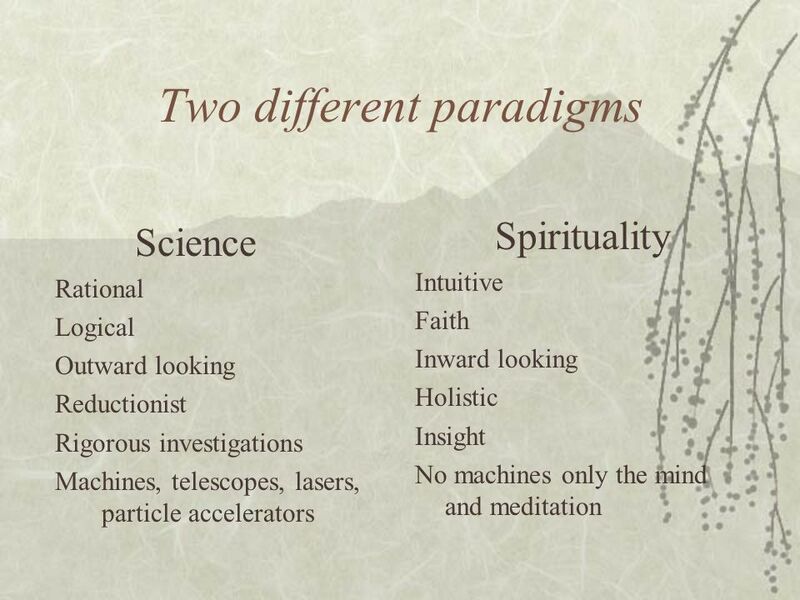 9 Two different paradigms, two different ways of knowing. 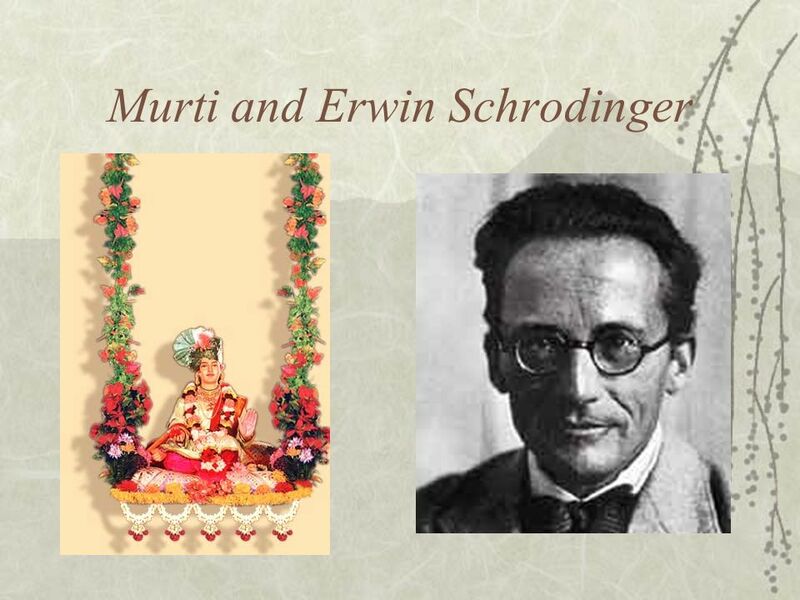 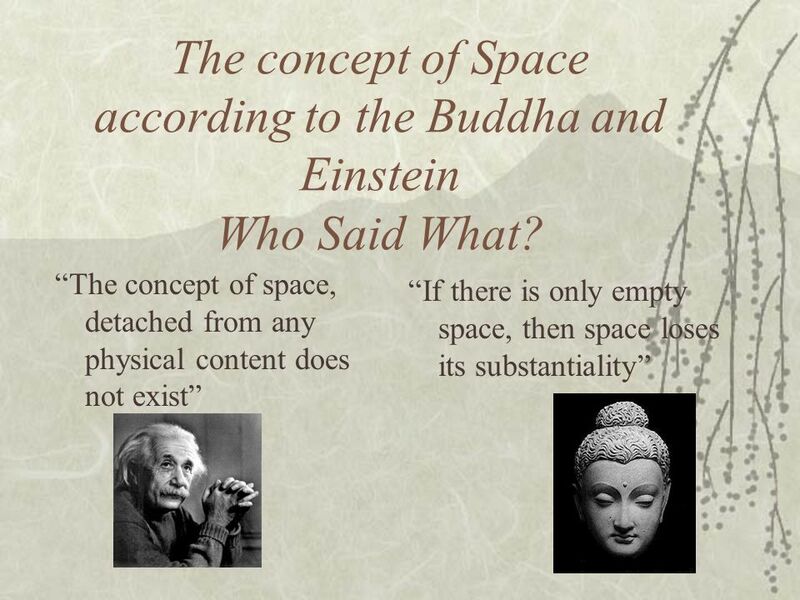 22 The concept of Space according to the Buddha and Einstein Who Said What? 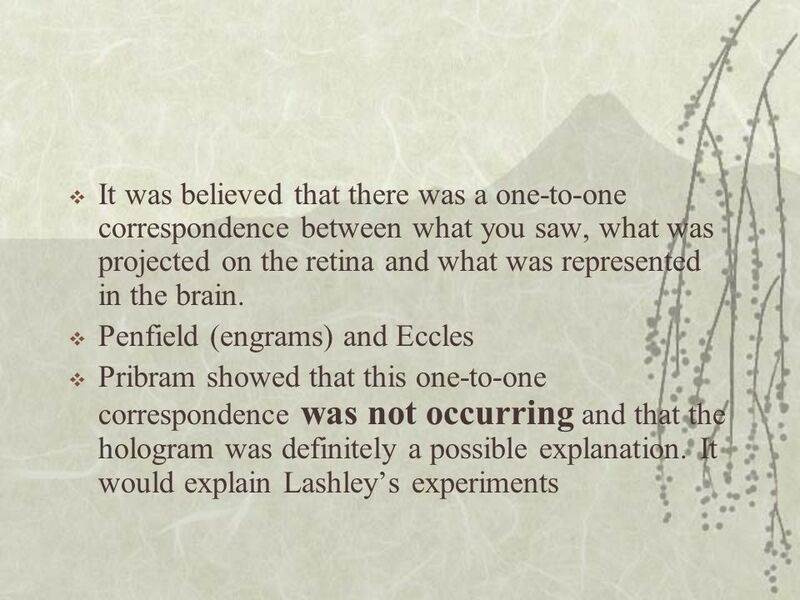 23 Who said what? 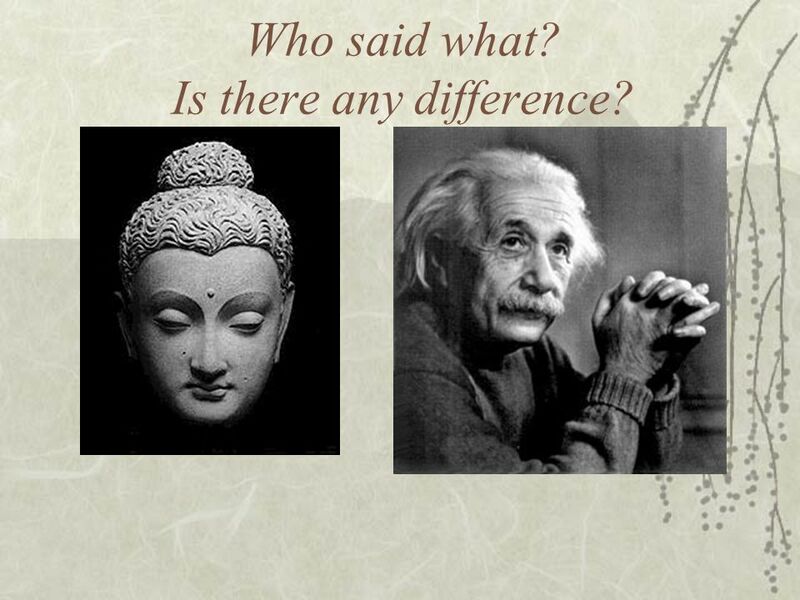 Is there any difference? 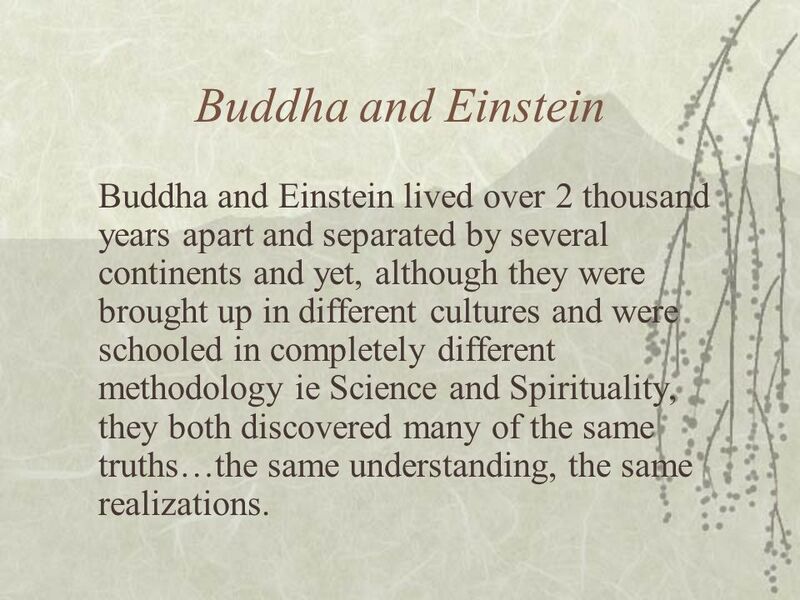 24 Buddha and Einstein Buddha and Einstein lived over 2 thousand years apart and separated by several continents and yet, although they were brought up in different cultures and were schooled in completely different methodology ie Science and Spirituality, they both discovered many of the same truths…the same understanding, the same realizations. 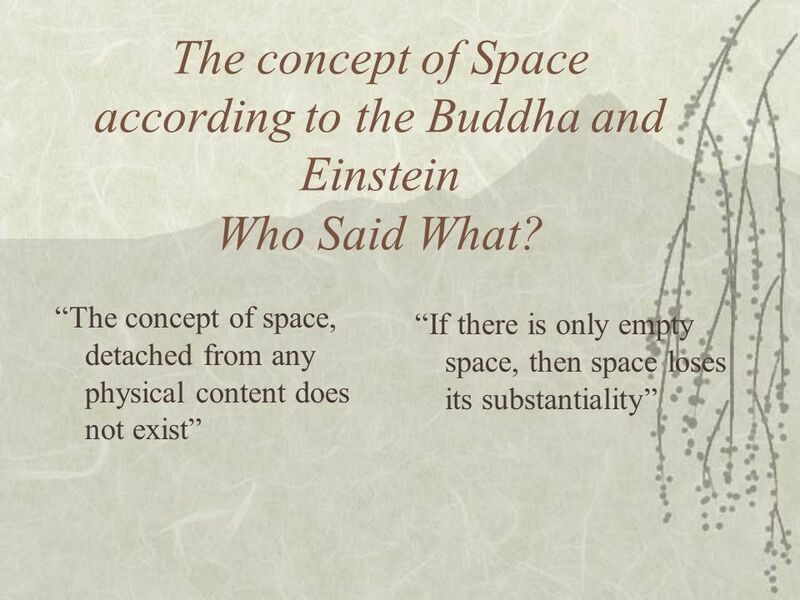 25 The concept of Space according to the Buddha and Einstein Who Said What? 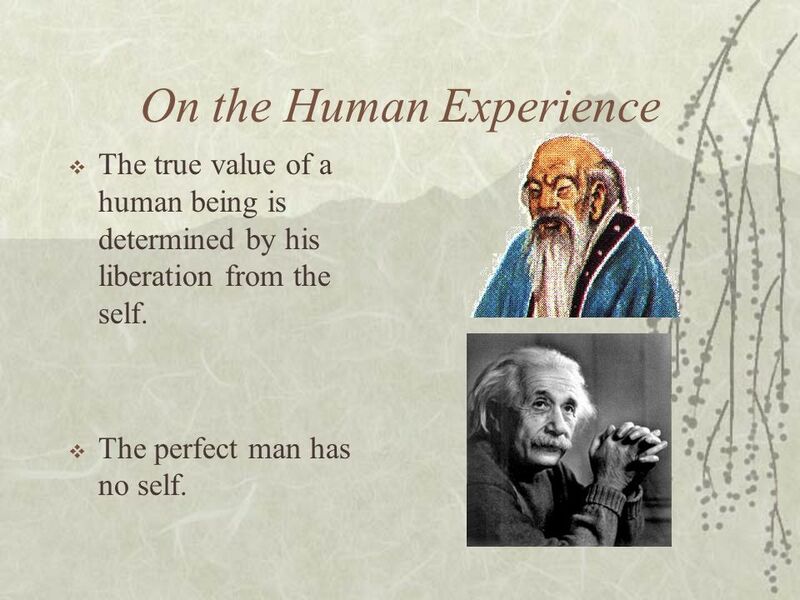 The true value of a human being is determined by his liberation from the self. 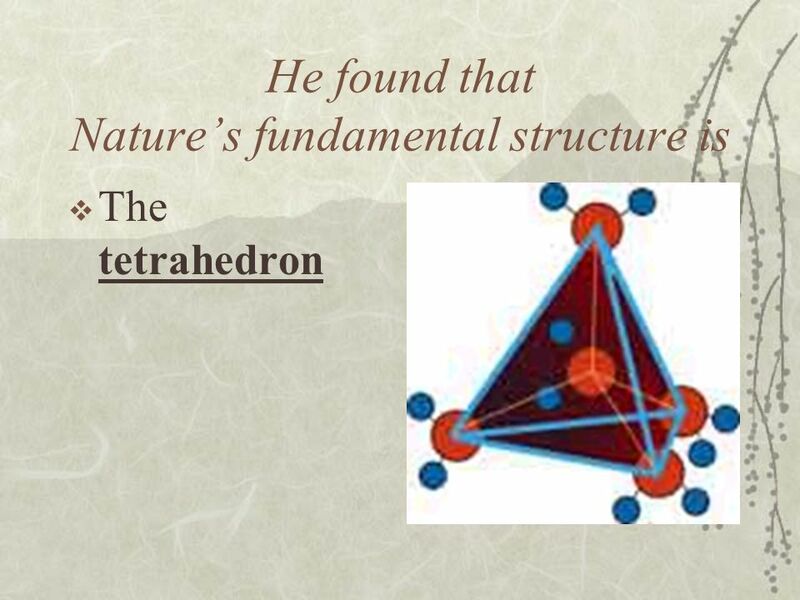 The perfect man has no self. 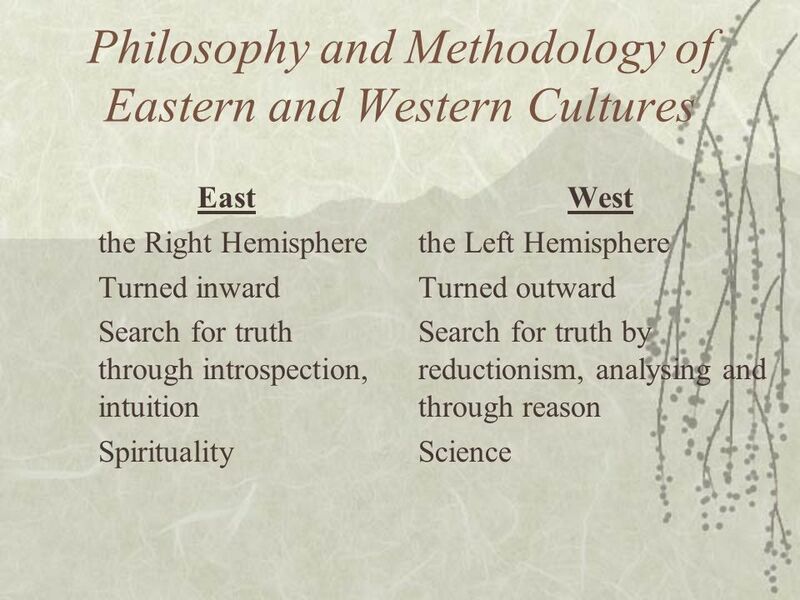 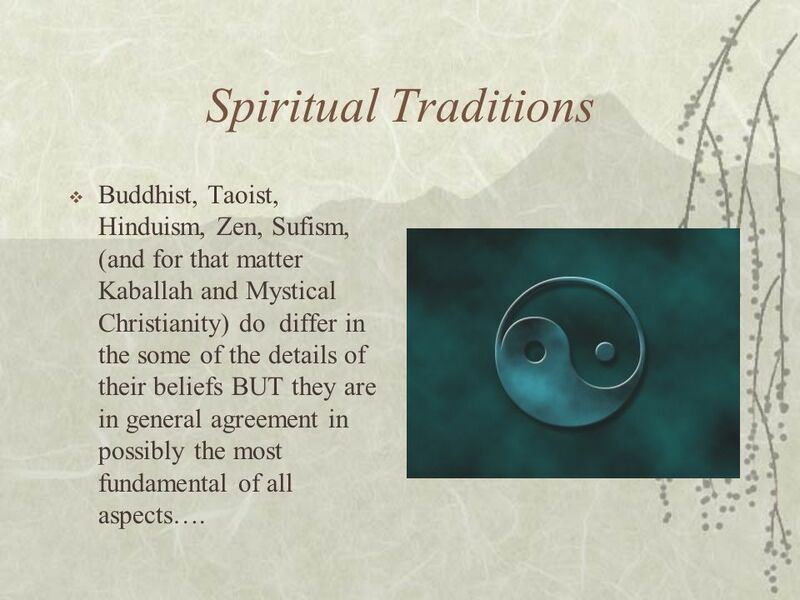 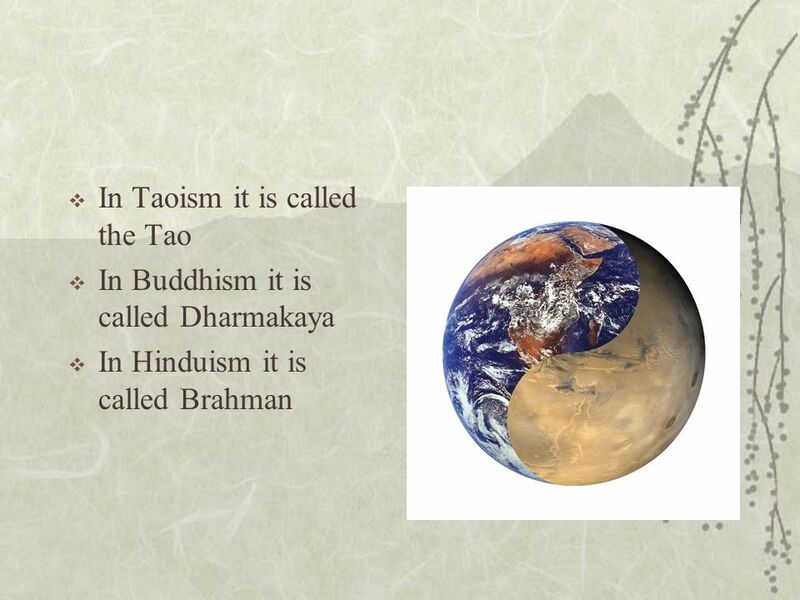 31 Spiritual Traditions Buddhist, Taoist, Hinduism, Zen, Sufism, (and for that matter Kaballah and Mystical Christianity) do differ in the some of the details of their beliefs BUT they are in general agreement in possibly the most fundamental of all aspects…. 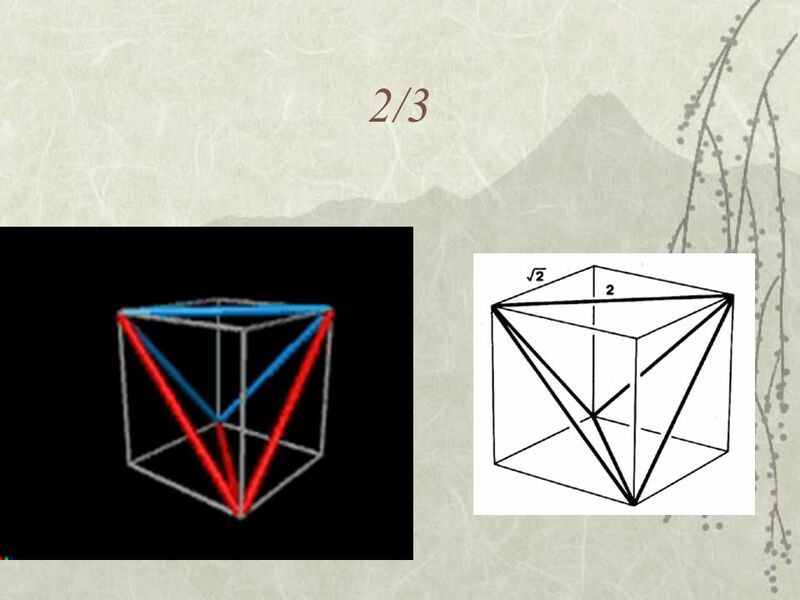 32 …the awareness of the unity and the interrelatedness of all things and events. 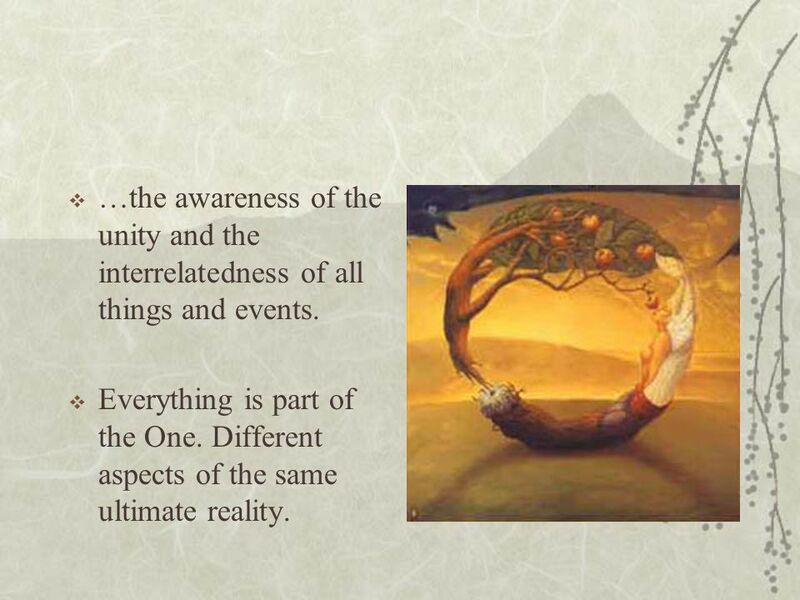 Everything is part of the One. 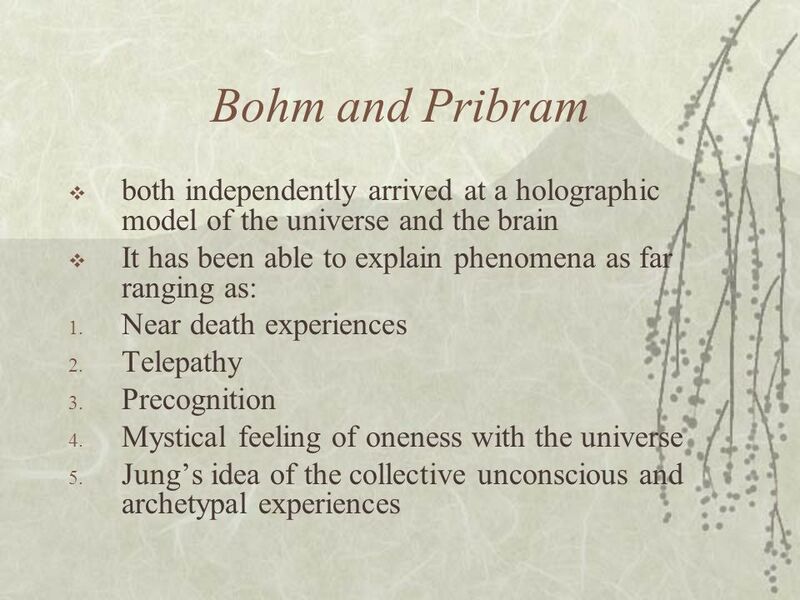 Different aspects of the same ultimate reality. 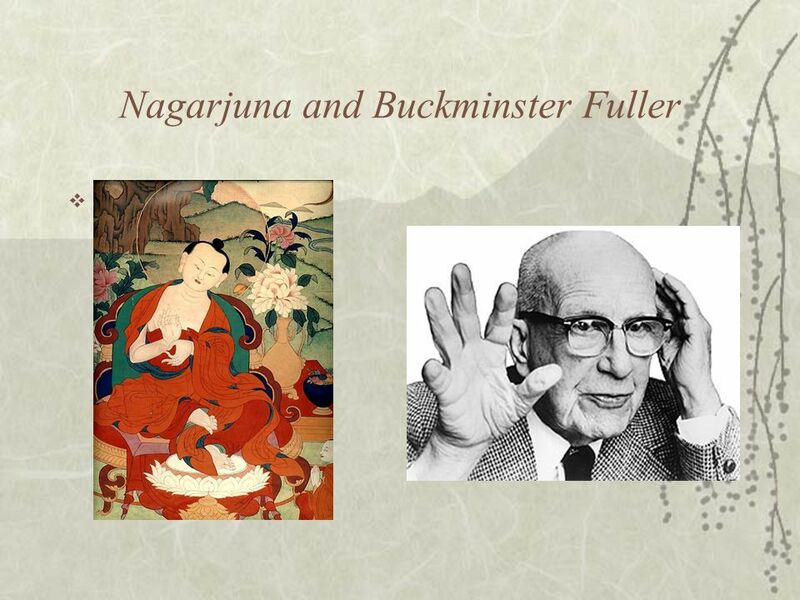 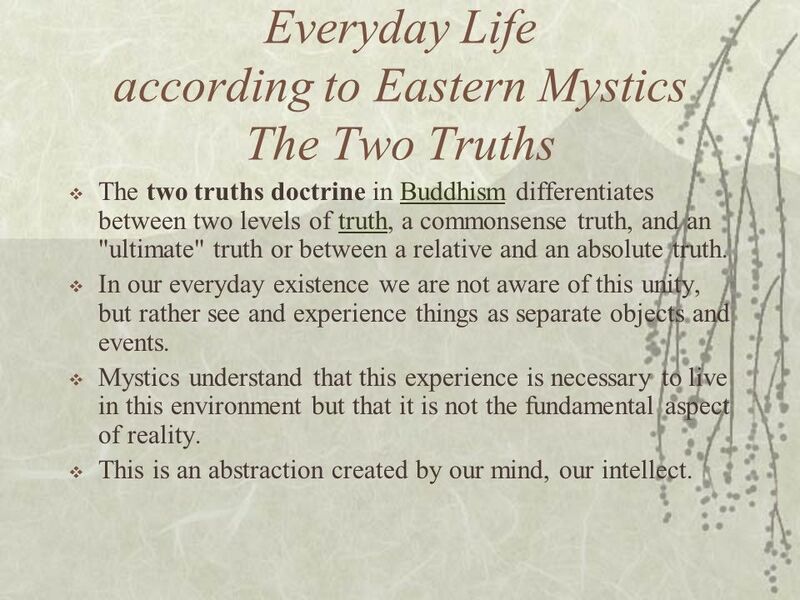 The two truths doctrine in Buddhism differentiates between two levels of truth, a commonsense truth, and an "ultimate" truth or between a relative and an absolute truth. 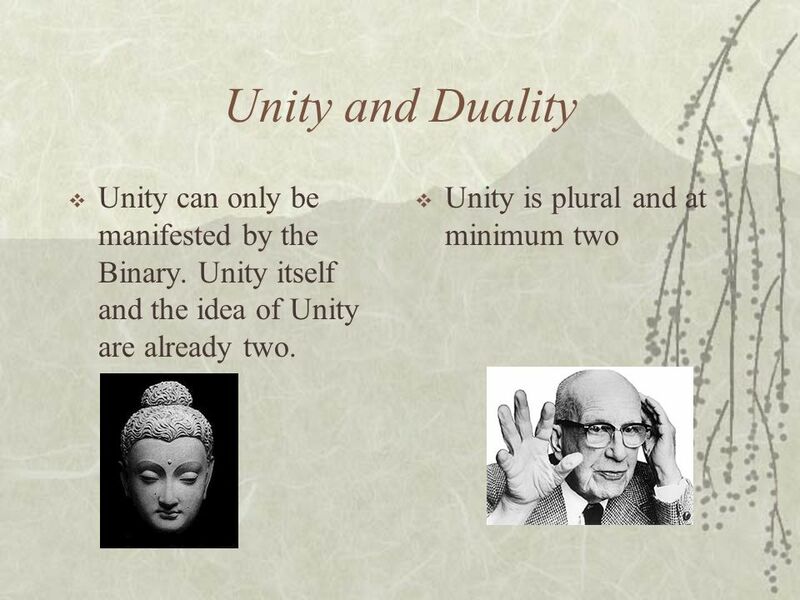 In our everyday existence we are not aware of this unity, but rather see and experience things as separate objects and events. 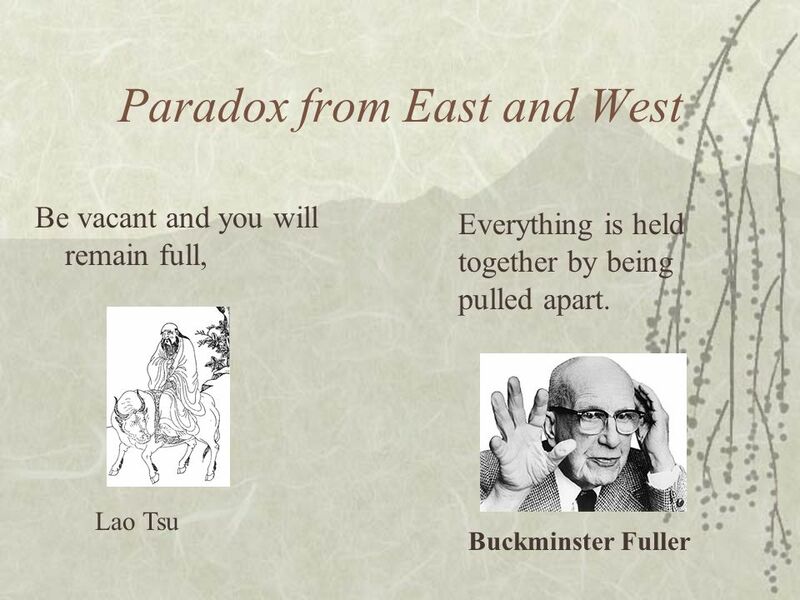 Mystics understand that this experience is necessary to live in this environment but that it is not the fundamental aspect of reality. 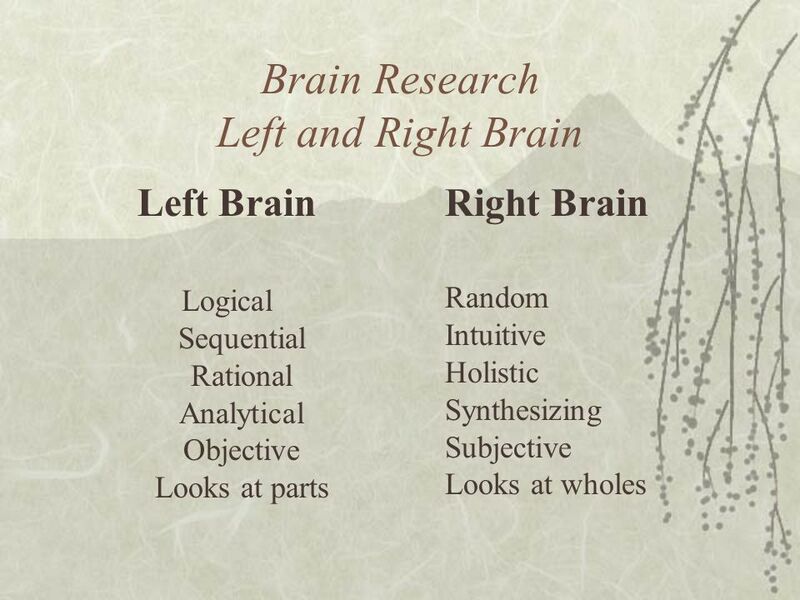 This is an abstraction created by our mind, our intellect. 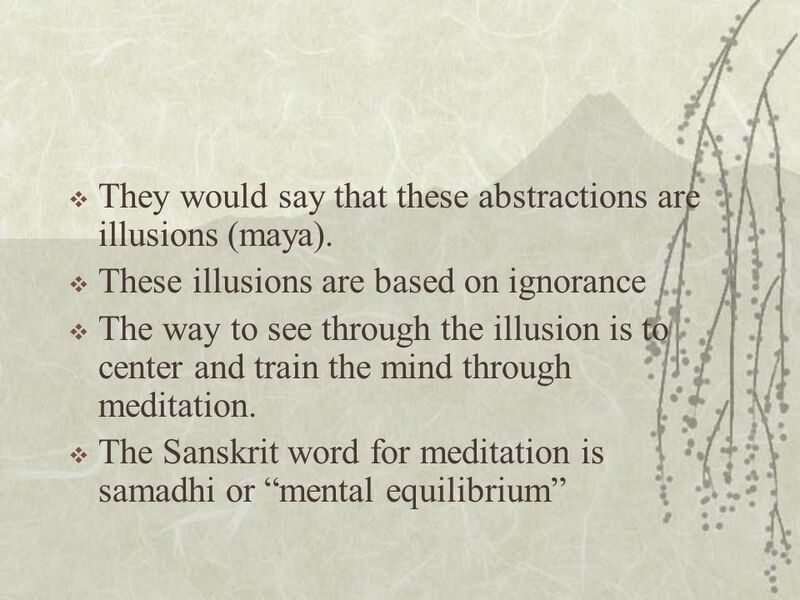 36 They would say that these abstractions are illusions (maya). 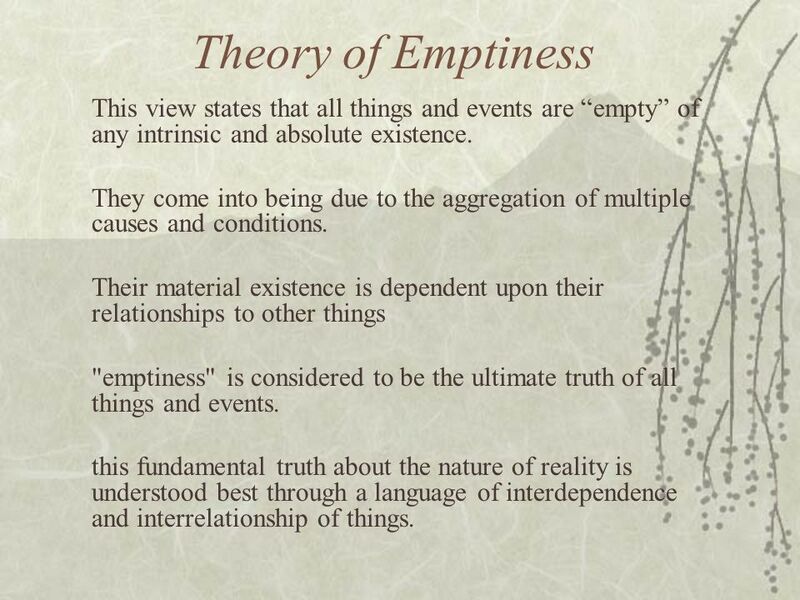 38 Theory of Emptiness This view states that all things and events are “empty” of any intrinsic and absolute existence. 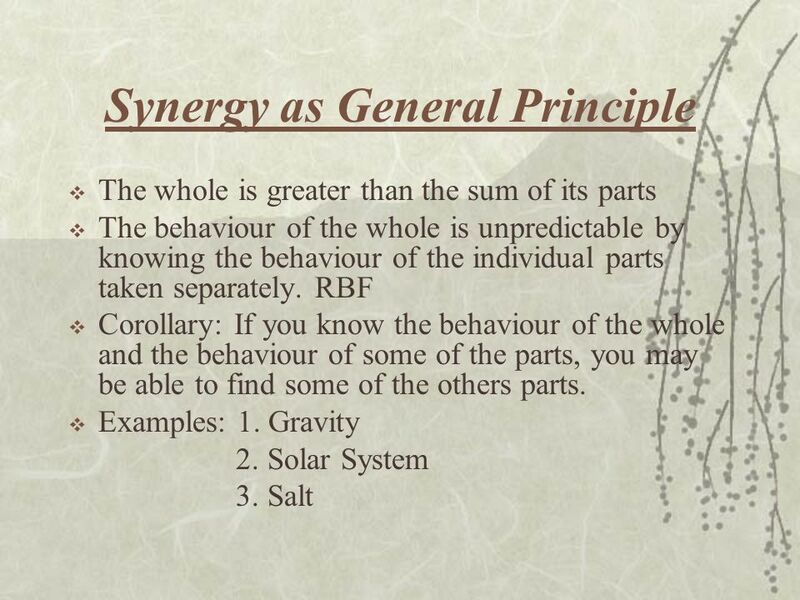 They come into being due to the aggregation of multiple causes and conditions. 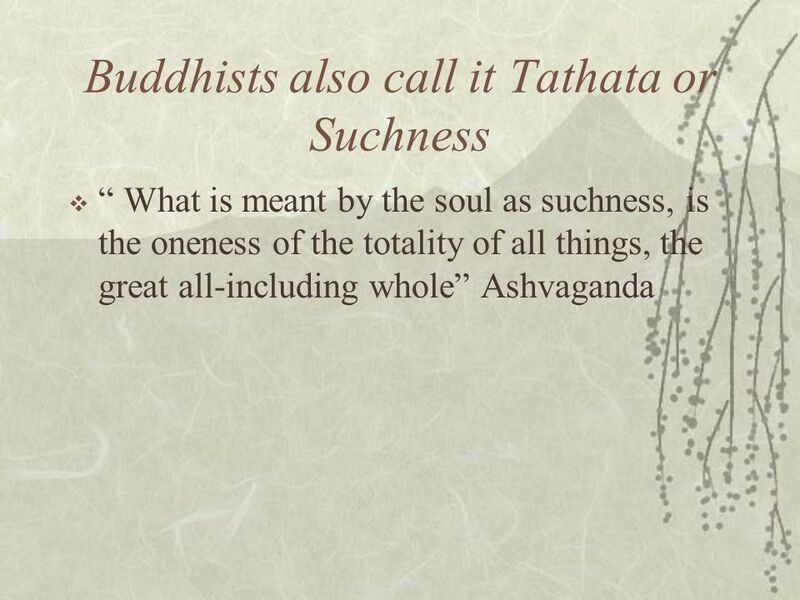 Their material existence is dependent upon their relationships to other things "emptiness" is considered to be the ultimate truth of all things and events. 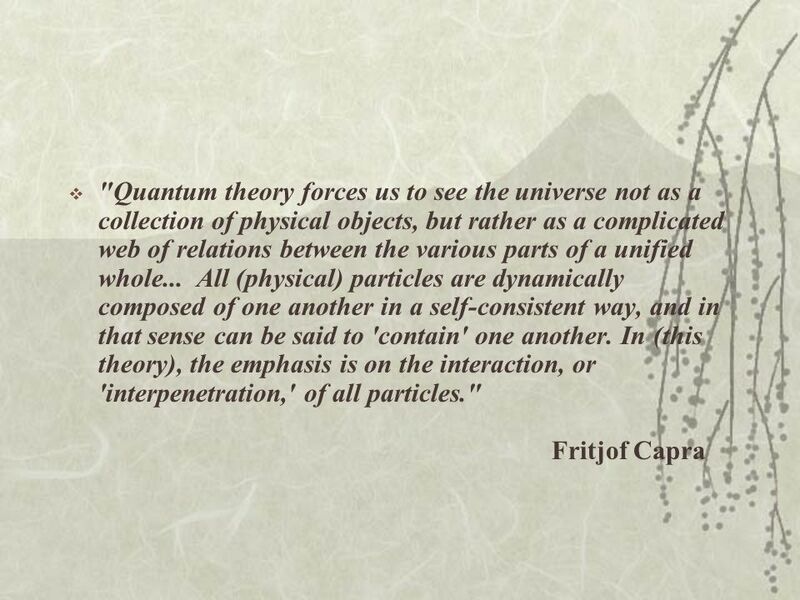 this fundamental truth about the nature of reality is understood best through a language of interdependence and interrelationship of things. 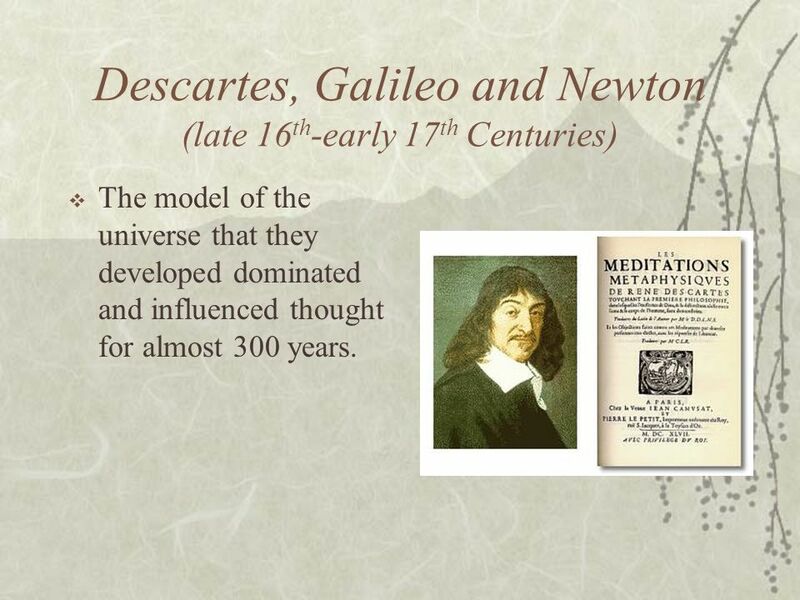 The model of the universe that they developed dominated and influenced thought for almost 300 years. 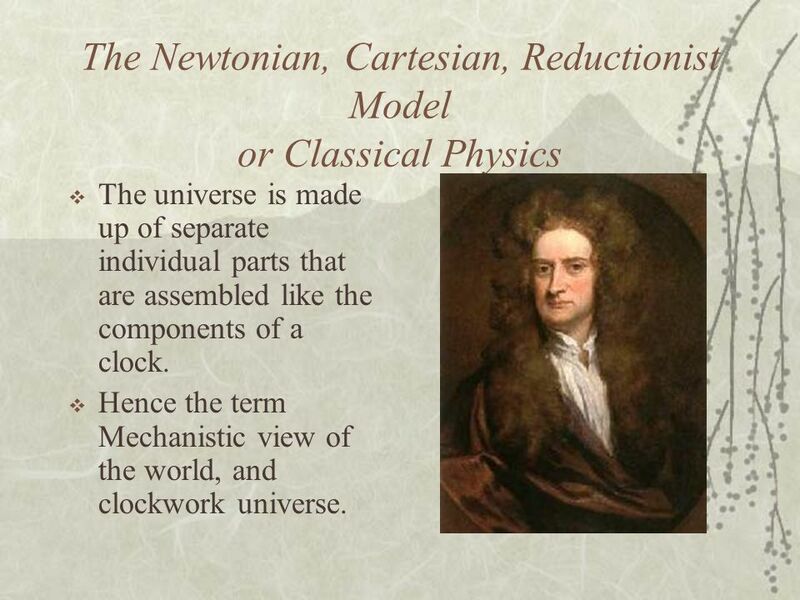 The universe is made up of separate individual parts that are assembled like the components of a clock. 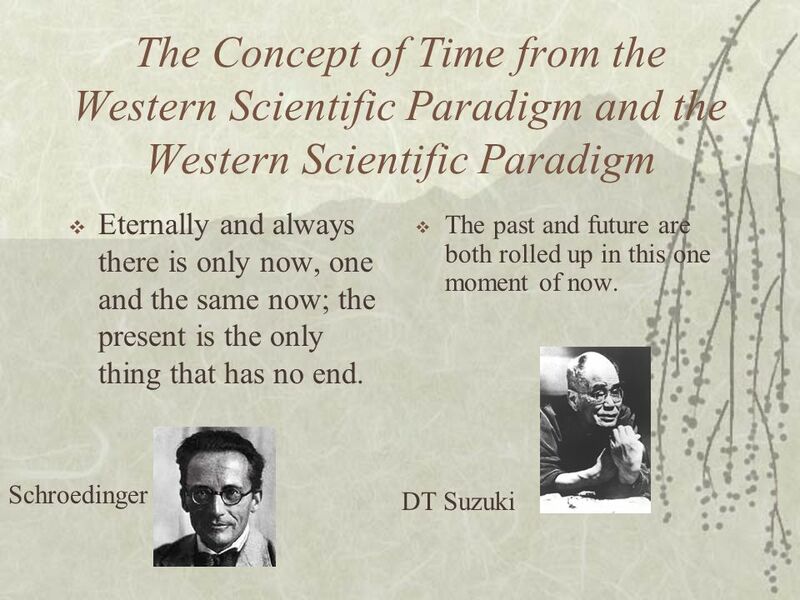 Hence the term Mechanistic view of the world, and clockwork universe. 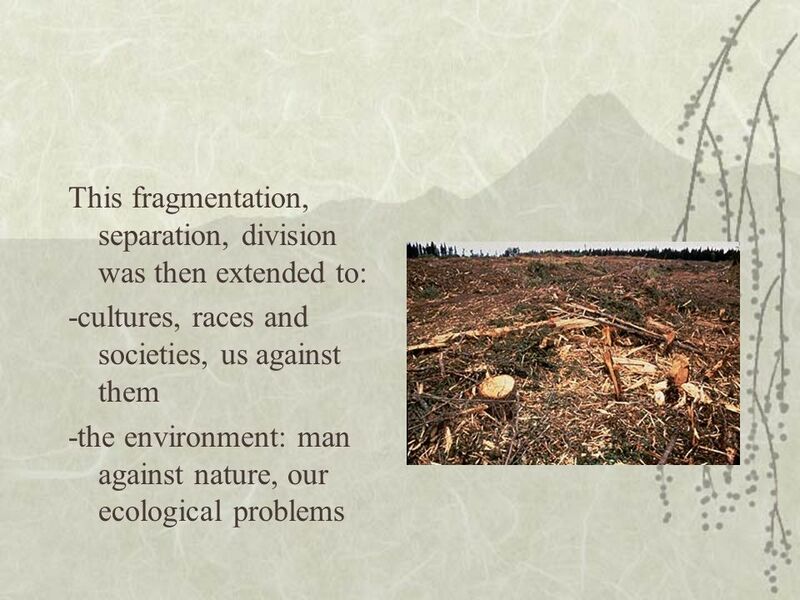 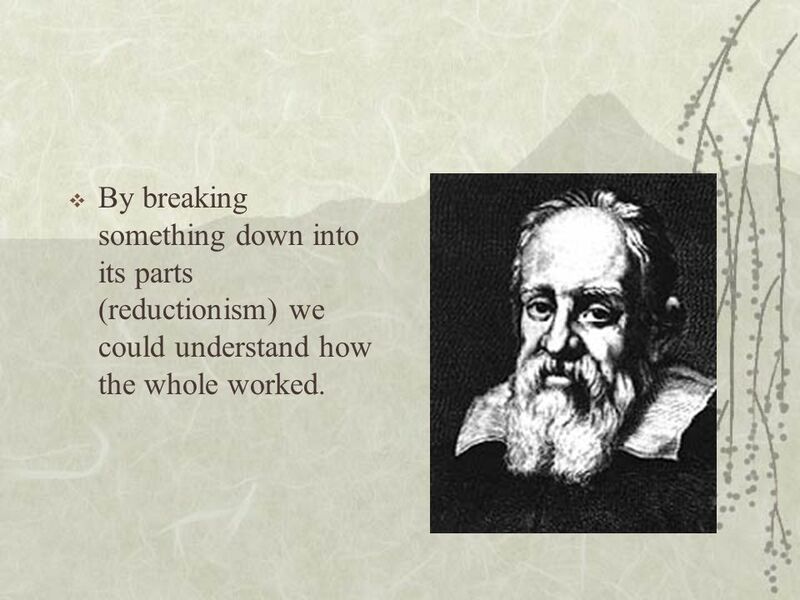 42 By breaking something down into its parts (reductionism) we could understand how the whole worked. 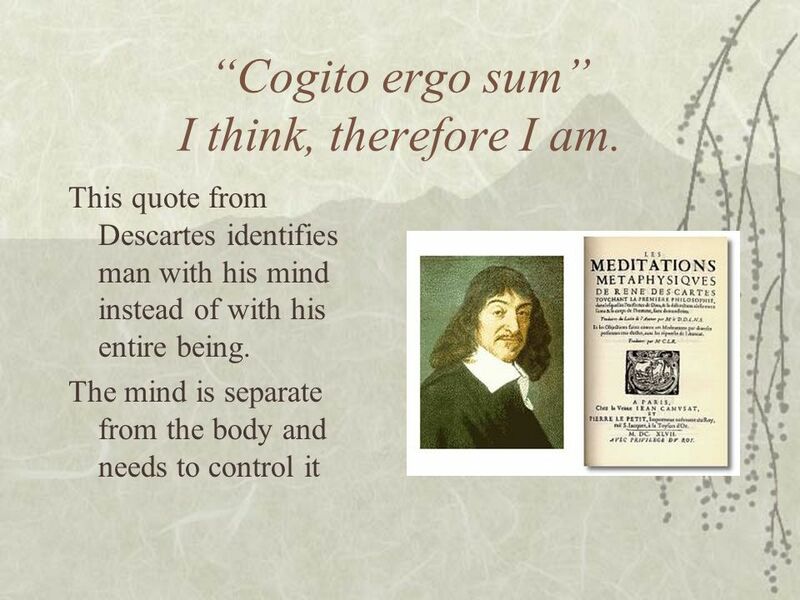 43 “Cogito ergo sum” I think, therefore I am. 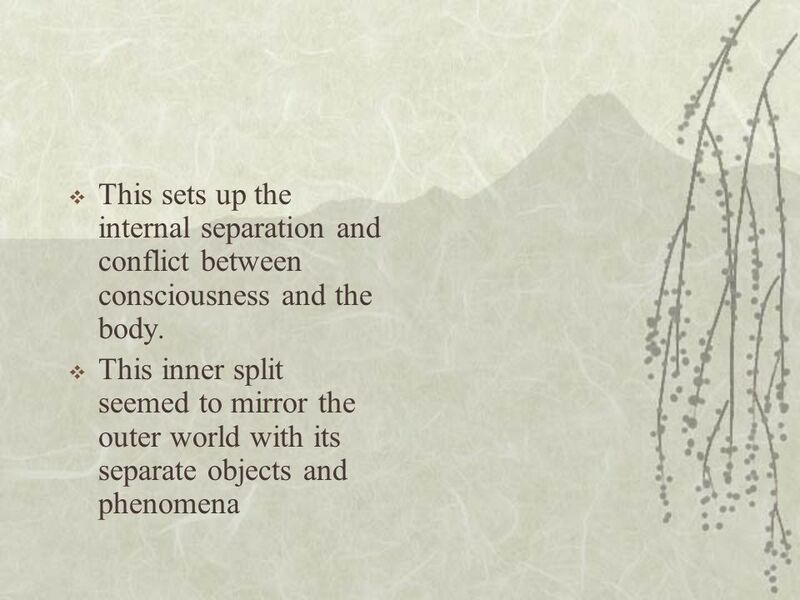 44 This sets up the internal separation and conflict between consciousness and the body. 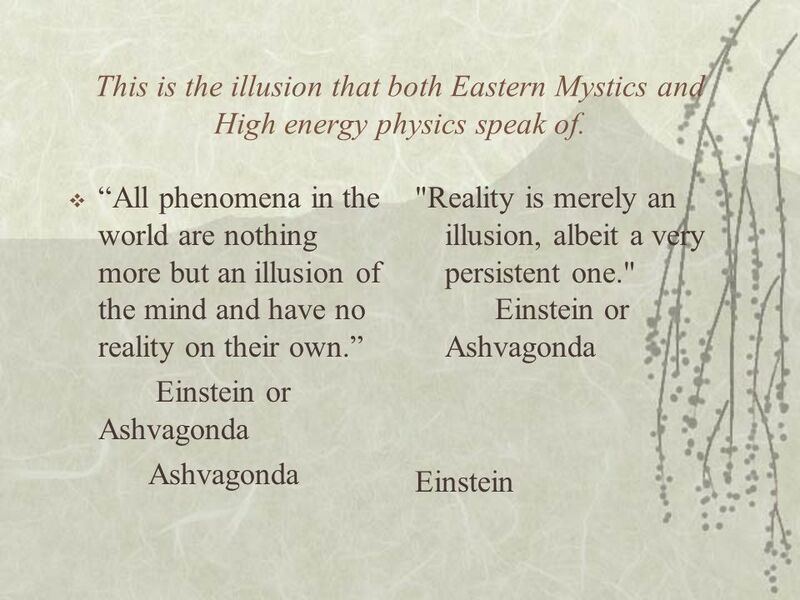 53 This is the illusion that both Eastern Mystics and High energy physics speak of. 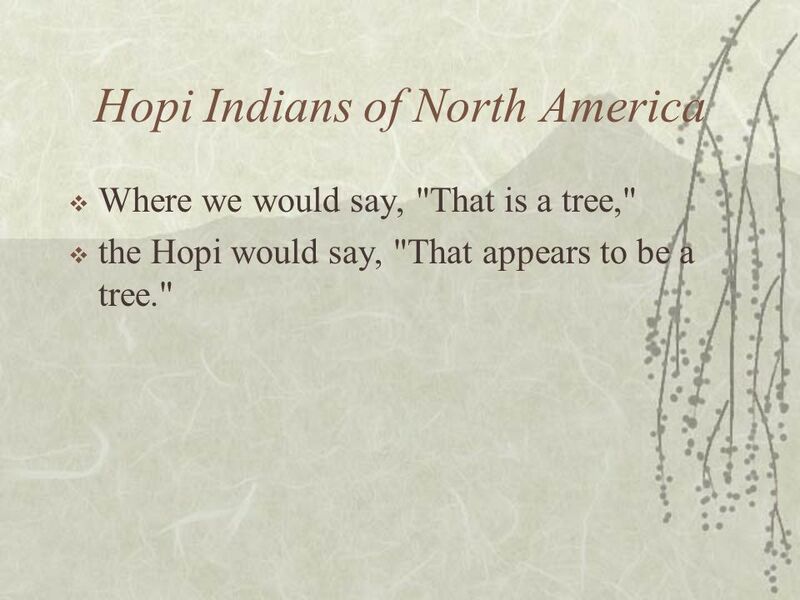 Where we would say, "That is a tree," the Hopi would say, "That appears to be a tree." 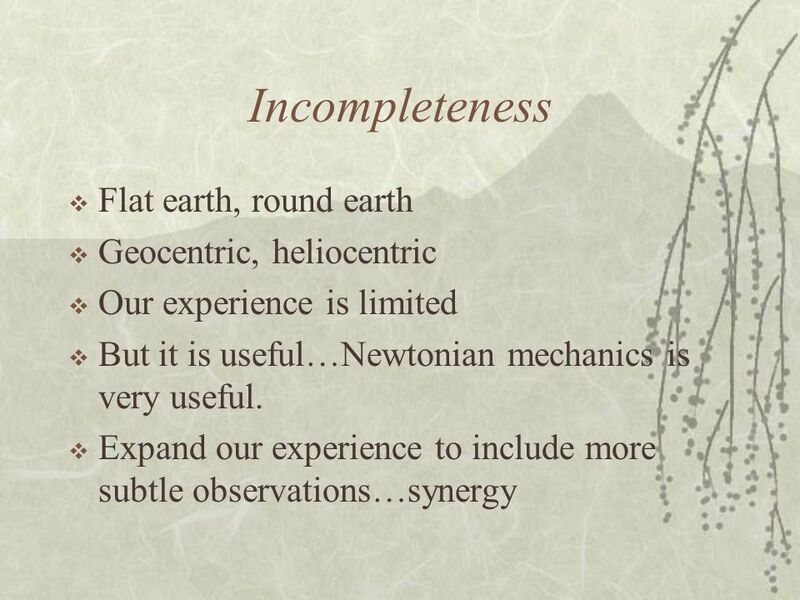 55 Common Sense If the idea of an objective, independent, solid, real world is wrong, then why does it seem so right? 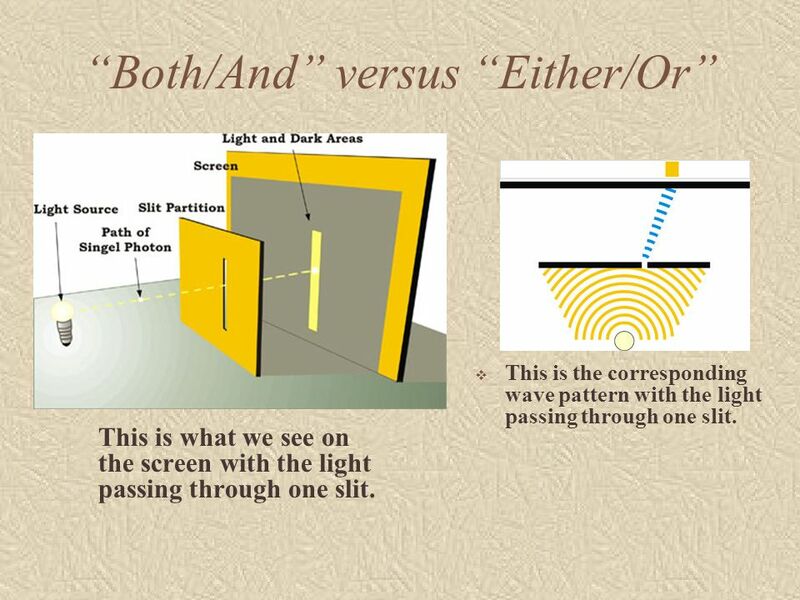 This is the corresponding wave pattern with the light passing through one slit. 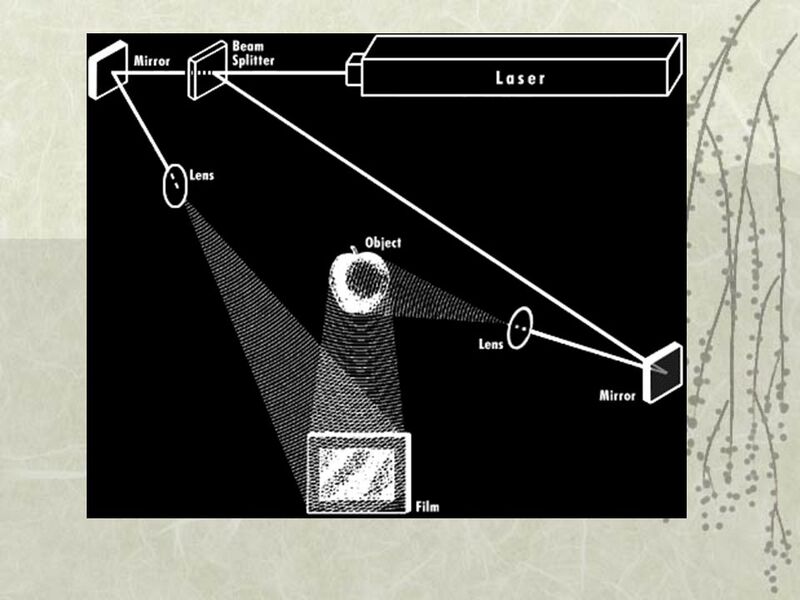 This is what we see on the screen with the light passing through one slit. 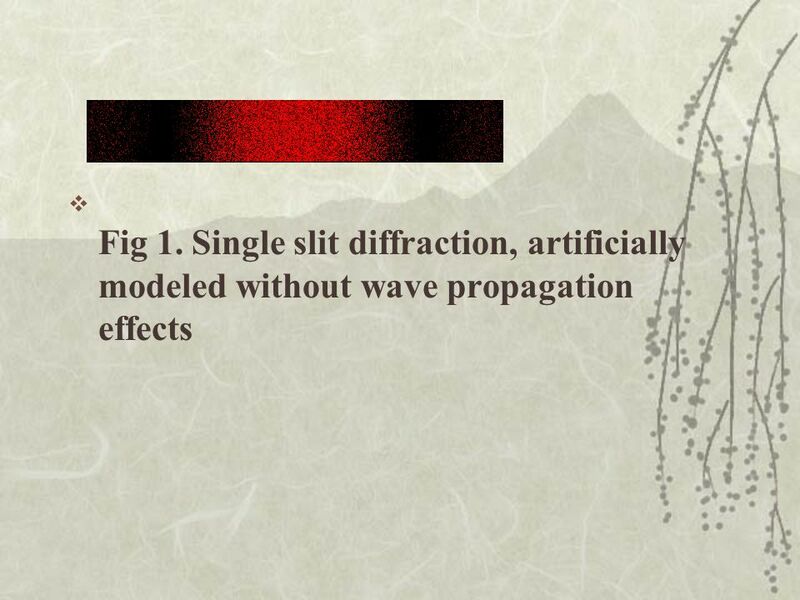 59 This is the actual wave pattern with light passing through two slits. 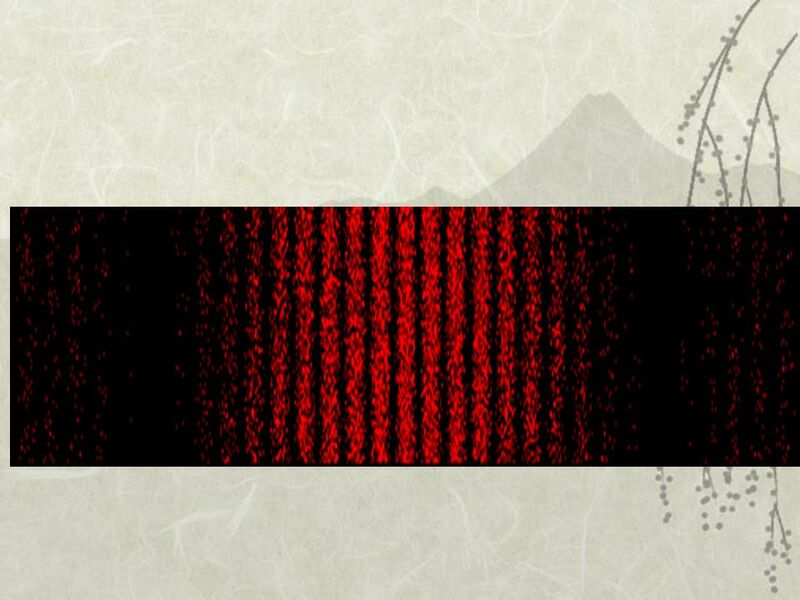 61 This golfer graphic reminds us of the reality we are all experiencing, but golf ball interference patterns are unthinkable. 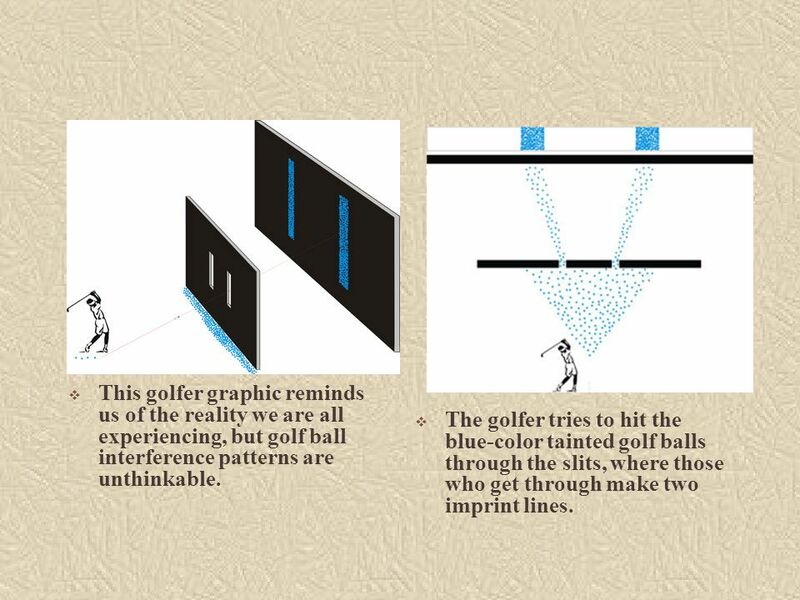 The golfer tries to hit the blue-color tainted golf balls through the slits, where those who get through make two imprint lines. 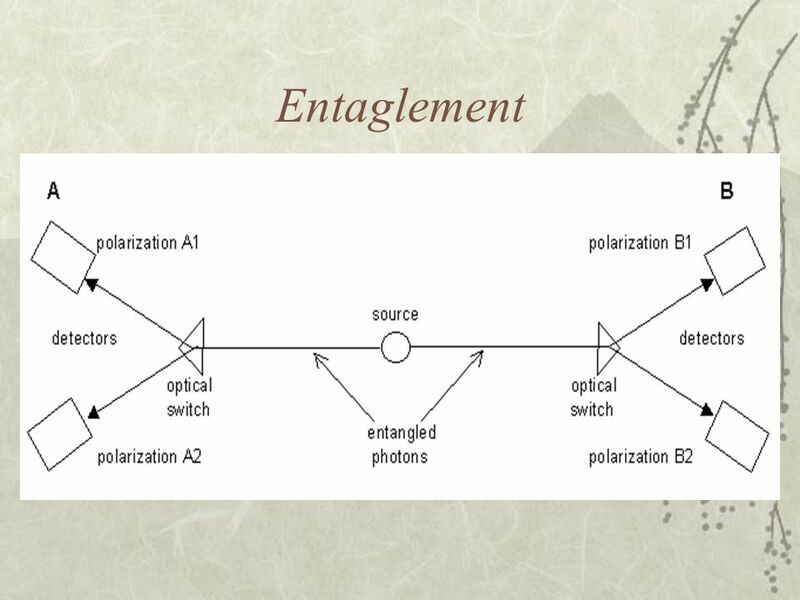 Electrons demonstrate Interference. 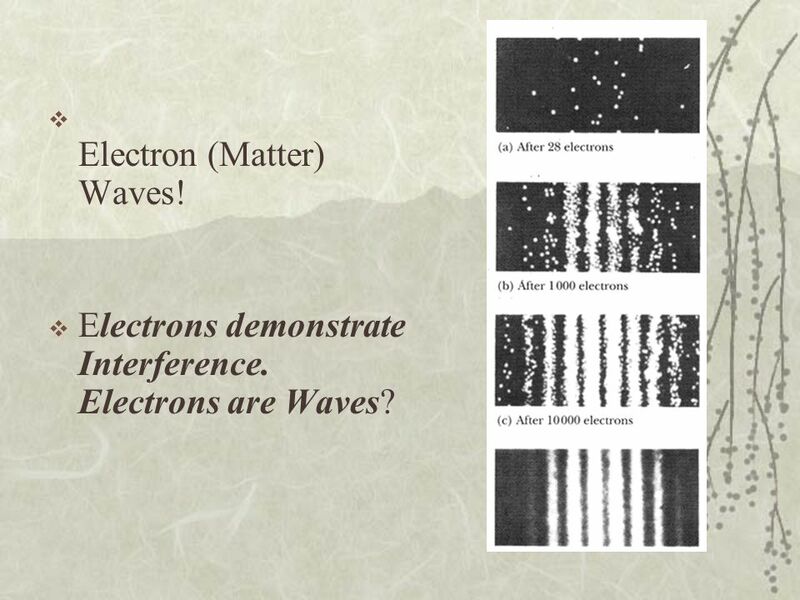 Electrons are Waves? 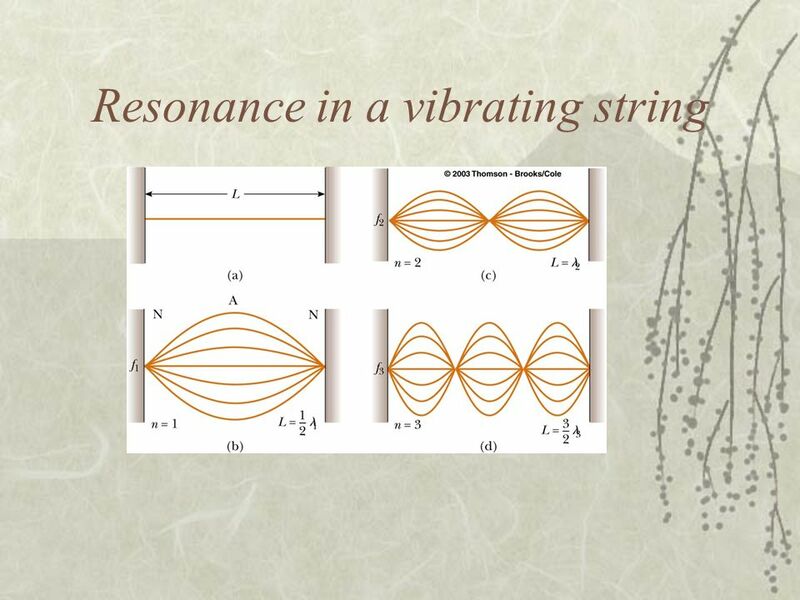 64 This is the actual wave pattern with light, or individual particles, being detected with photoelectric cells, passing the slits. 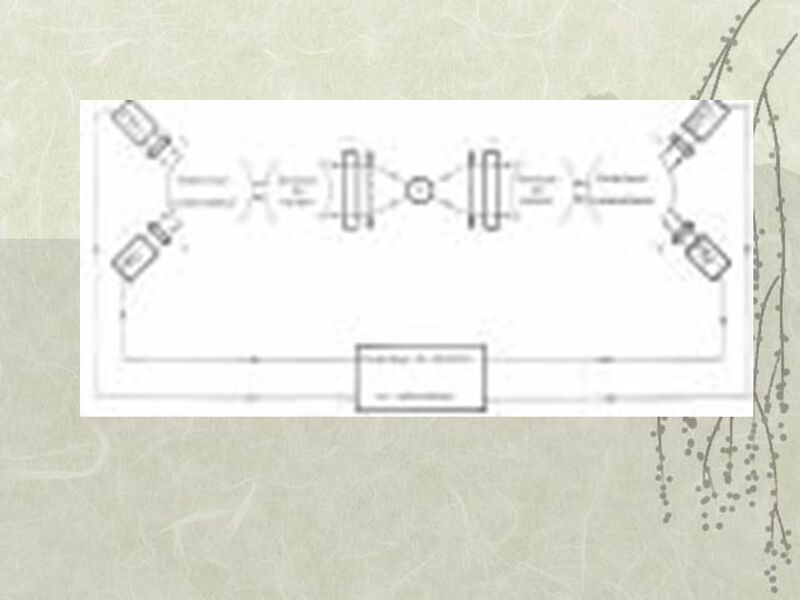 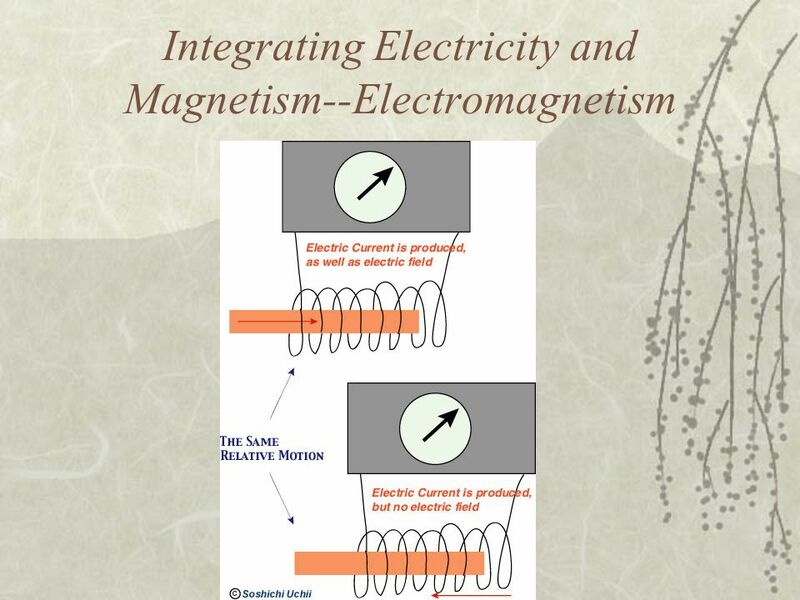 This is what we actually see at the moment that the photoelectric cell detector is switched on at either of the two slits. 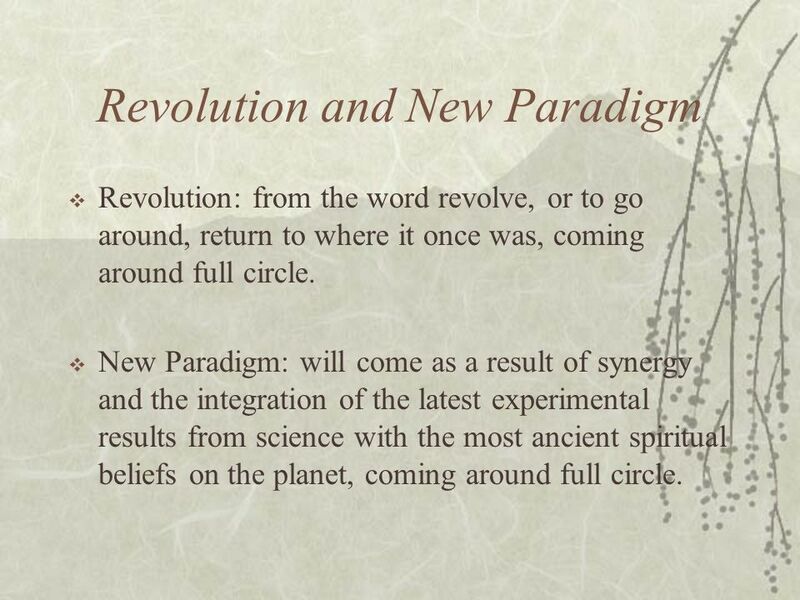 Revolution: from the word revolve, or to go around, return to where it once was, coming around full circle. 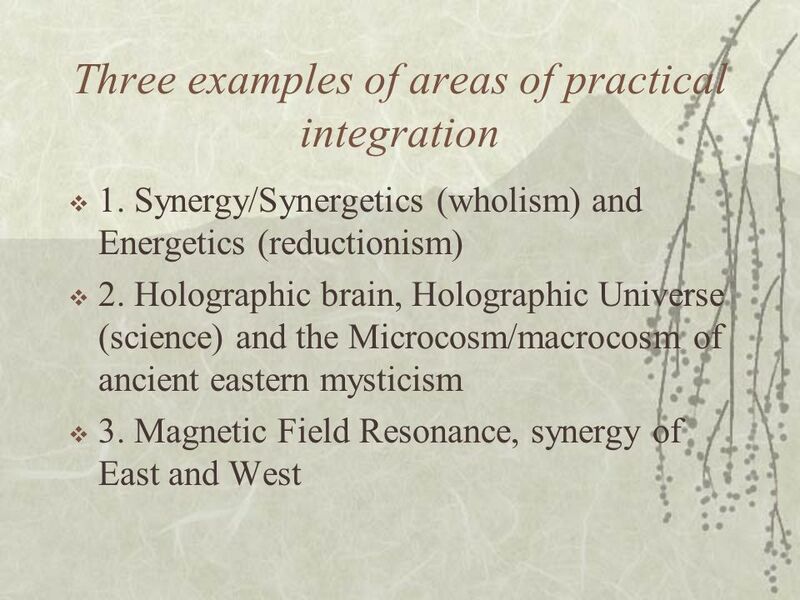 New Paradigm: will come as a result of synergy and the integration of the latest experimental results from science with the most ancient spiritual beliefs on the planet, coming around full circle. 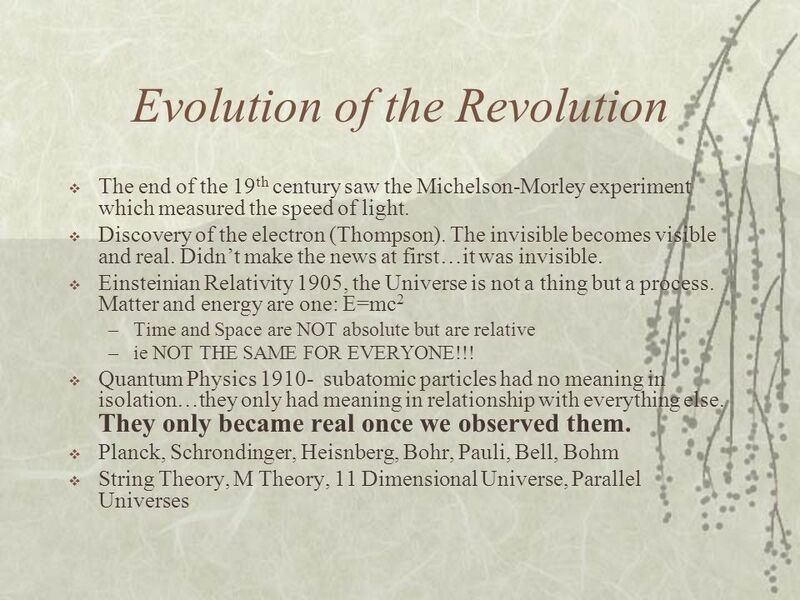 67 Are we on the Verge of a Revolution? 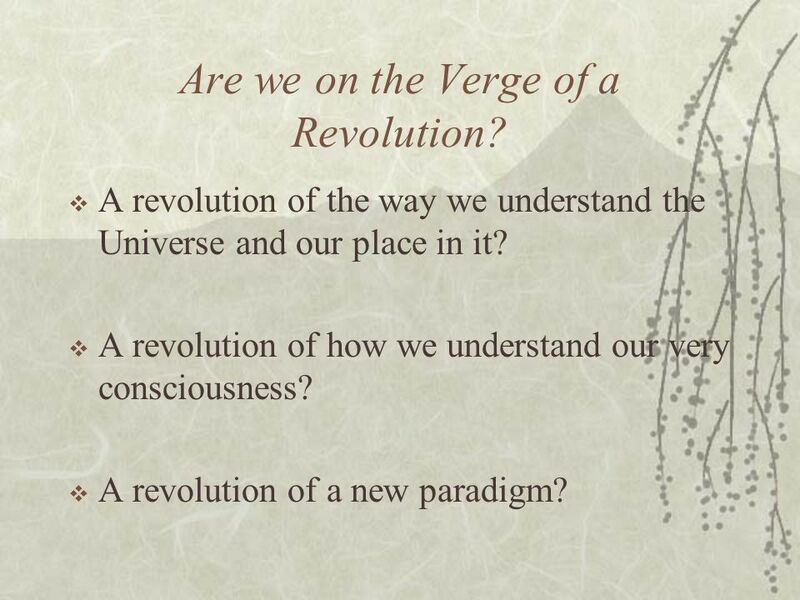 A revolution of the way we understand the Universe and our place in it? 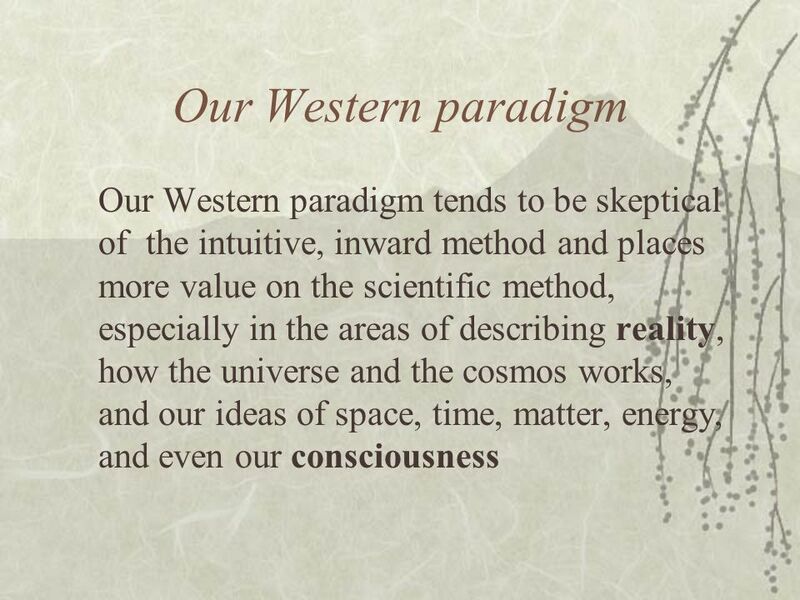 A revolution of how we understand our very consciousness? 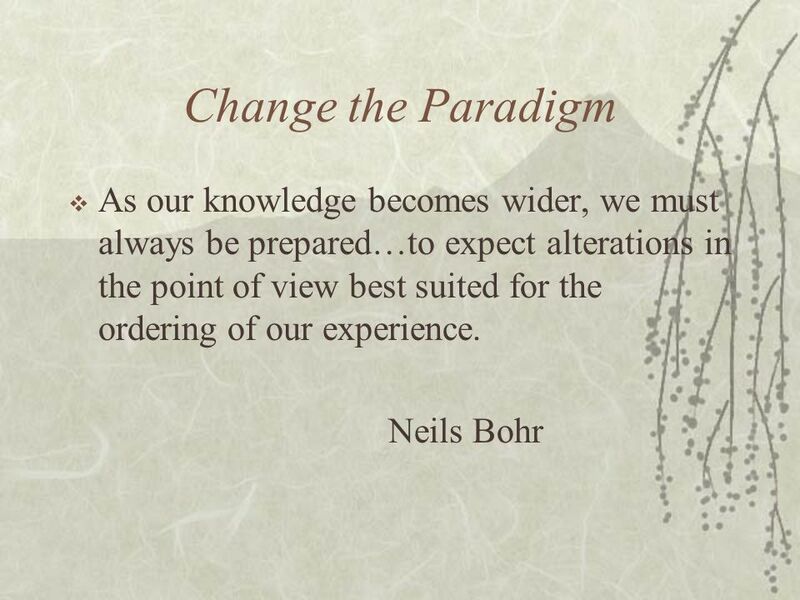 A revolution of a new paradigm? 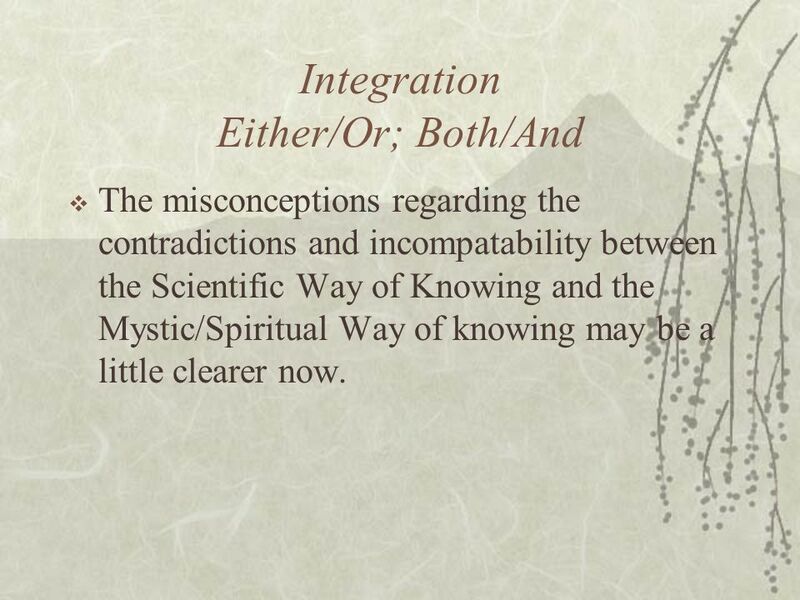 The misconceptions regarding the contradictions and incompatability between the Scientific Way of Knowing and the Mystic/Spiritual Way of knowing may be a little clearer now. 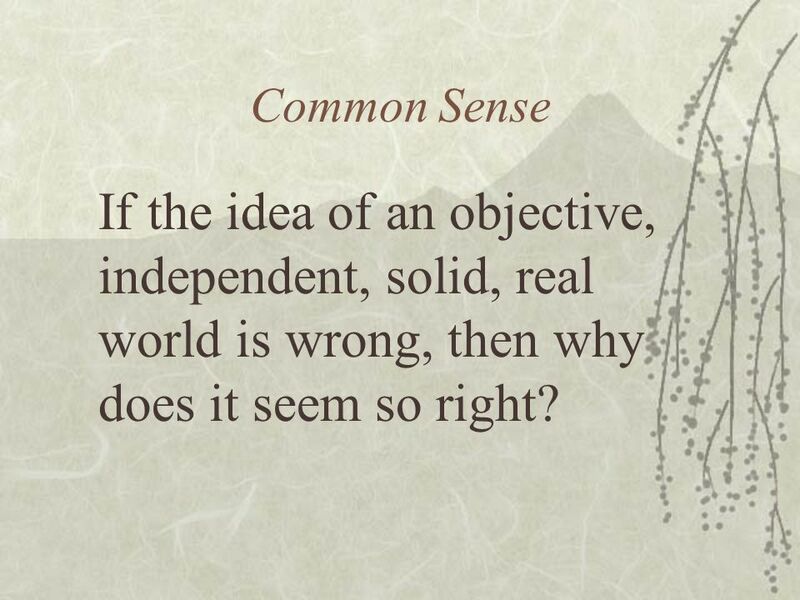 70 Common Sense If the idea of an objective, independent, solid, real world is wrong, then why does it seem so right? 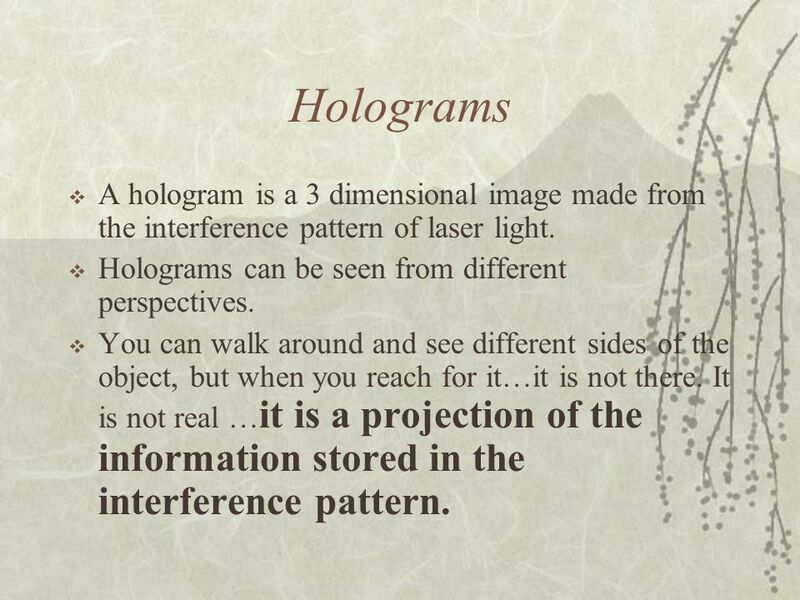 74 Holograms A hologram is a 3 dimensional image made from the interference pattern of laser light. 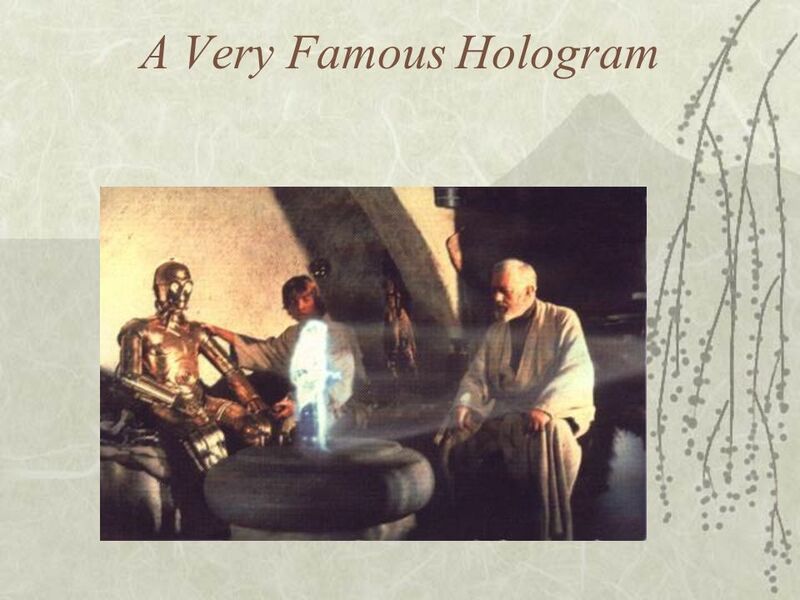 Holograms can be seen from different perspectives. 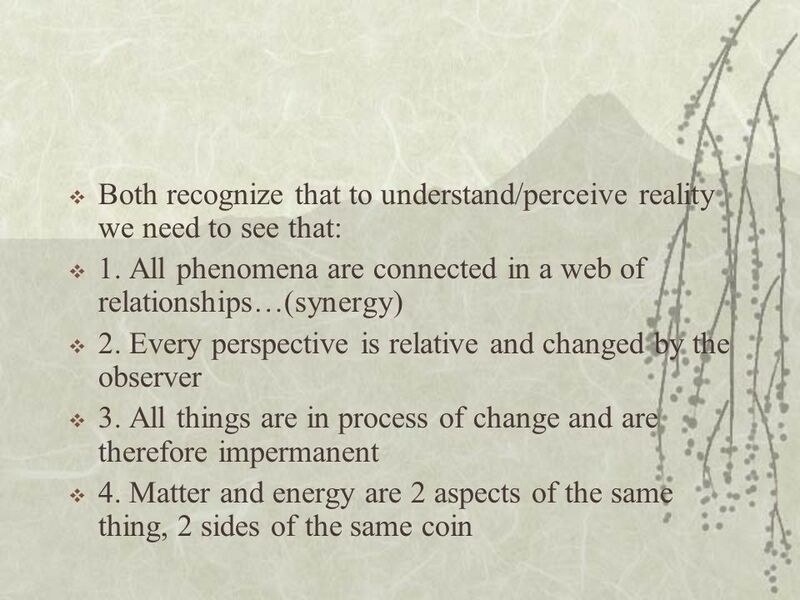 You can walk around and see different sides of the object, but when you reach for it…it is not there. 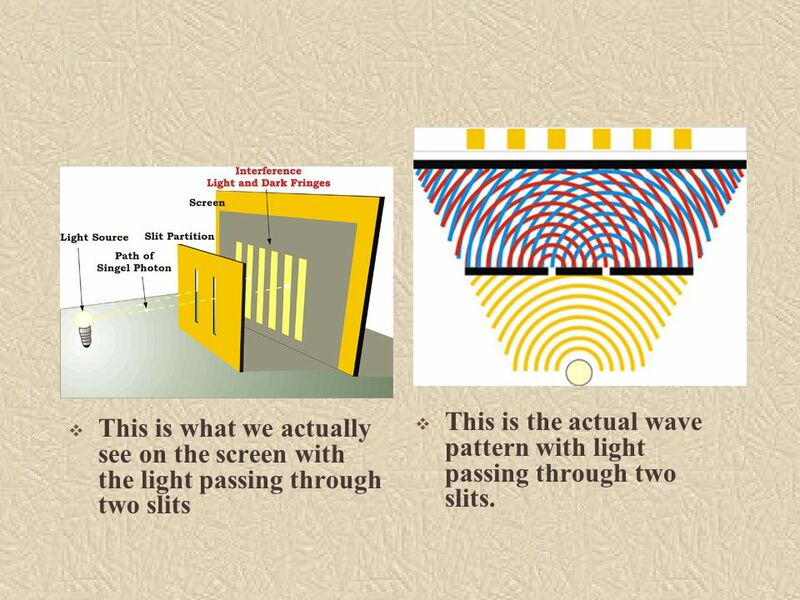 It is not real …it is a projection of the information stored in the interference pattern. 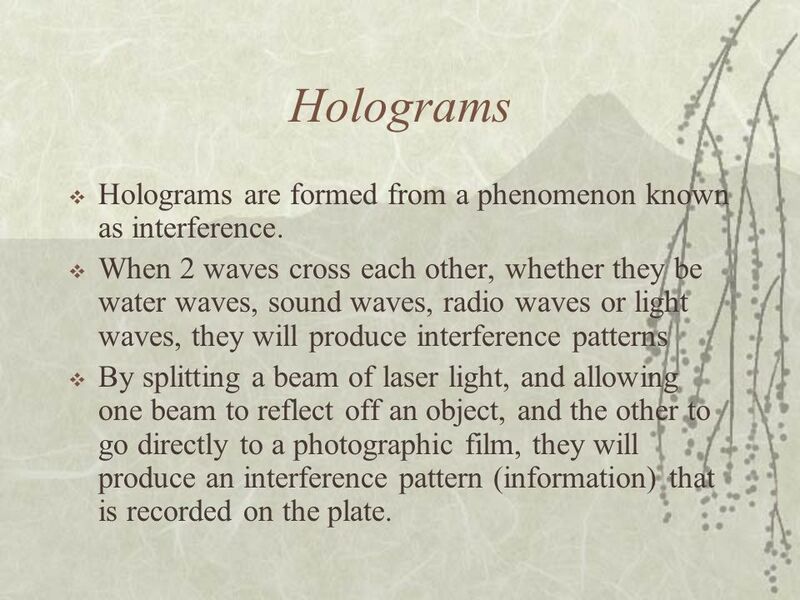 76 Holograms Holograms are formed from a phenomenon known as interference. 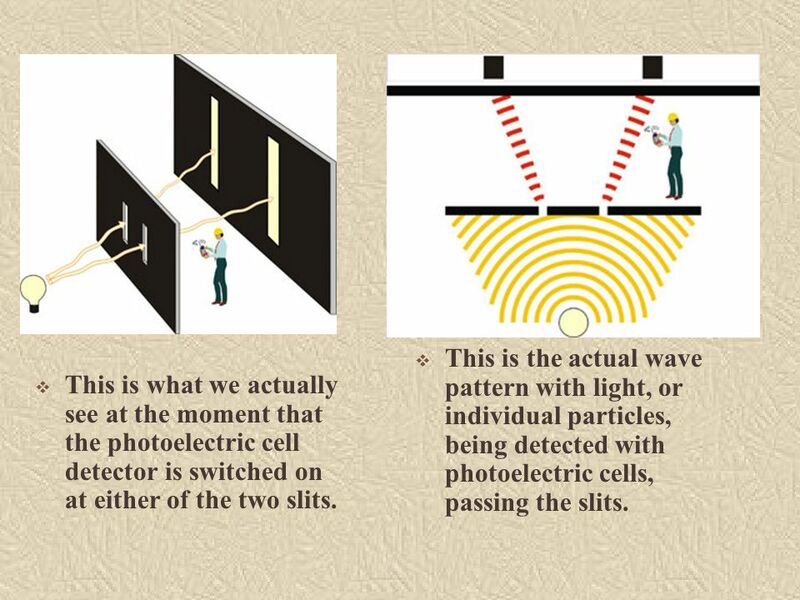 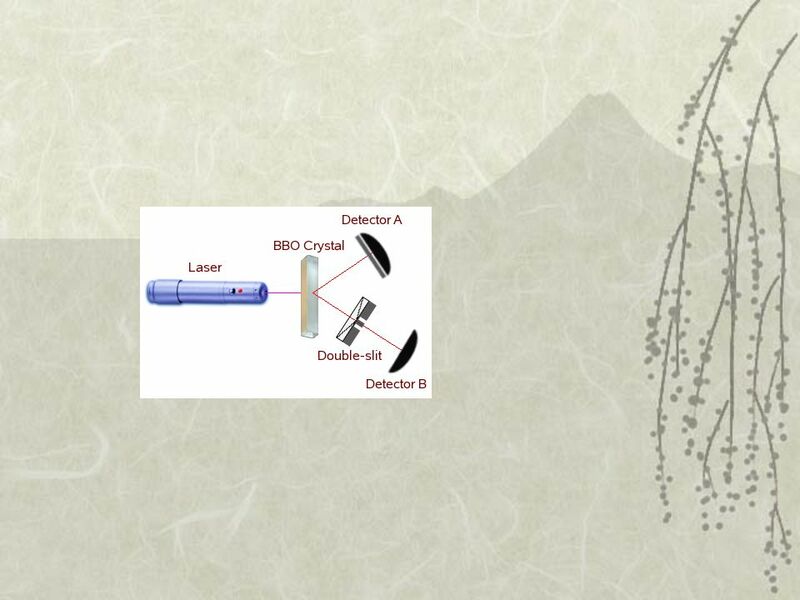 When 2 waves cross each other, whether they be water waves, sound waves, radio waves or light waves, they will produce interference patterns By splitting a beam of laser light, and allowing one beam to reflect off an object, and the other to go directly to a photographic film, they will produce an interference pattern (information) that is recorded on the plate. 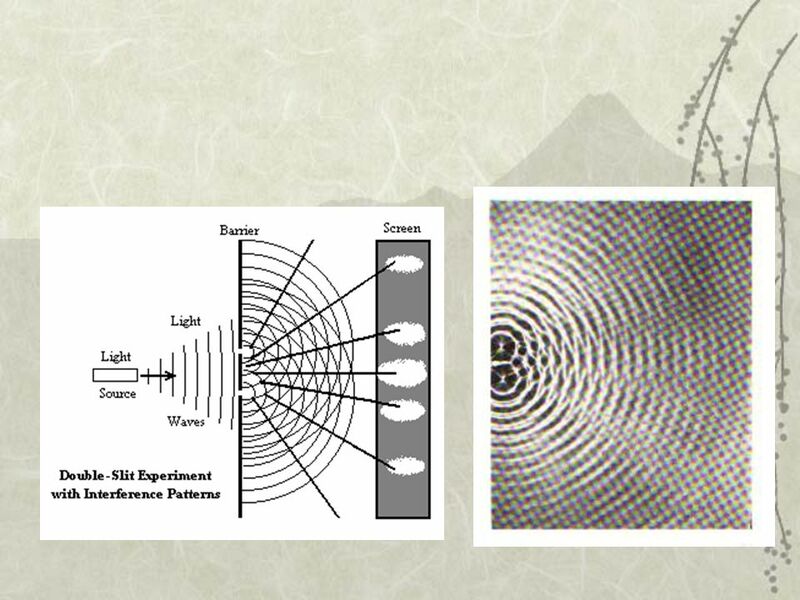 79 When you look at the plate all you see are concentric circles of alternating dark and light bands…the interference patterns as you might see in a pond after throwing in a pebble or two. 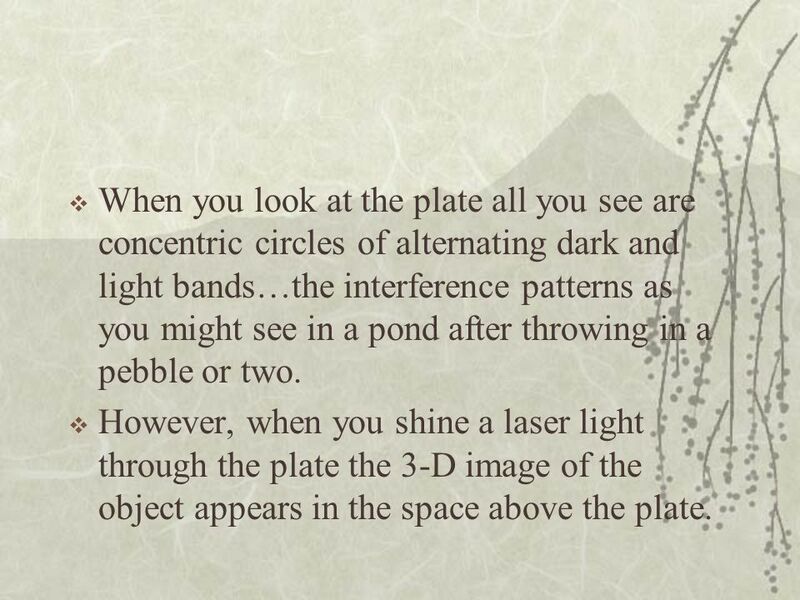 However, when you shine a laser light through the plate the 3-D image of the object appears in the space above the plate. 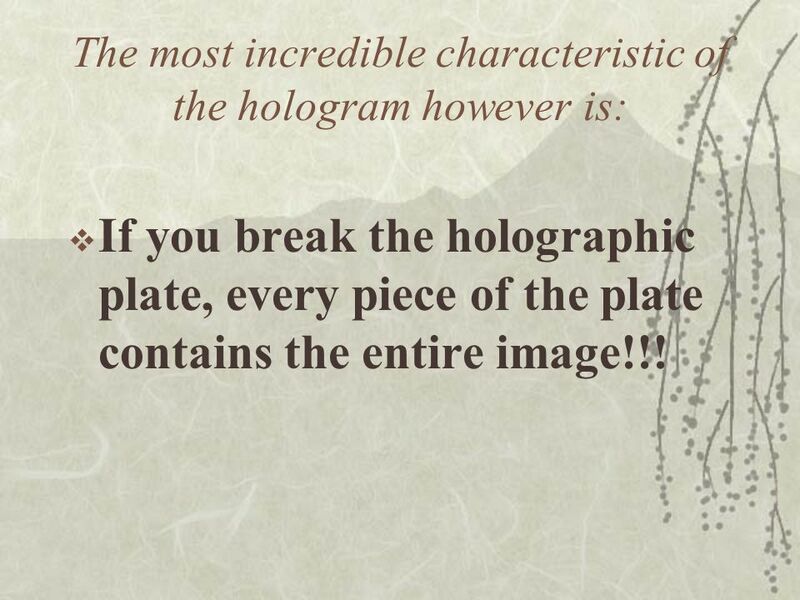 If you break the holographic plate, every piece of the plate contains the entire image!!! 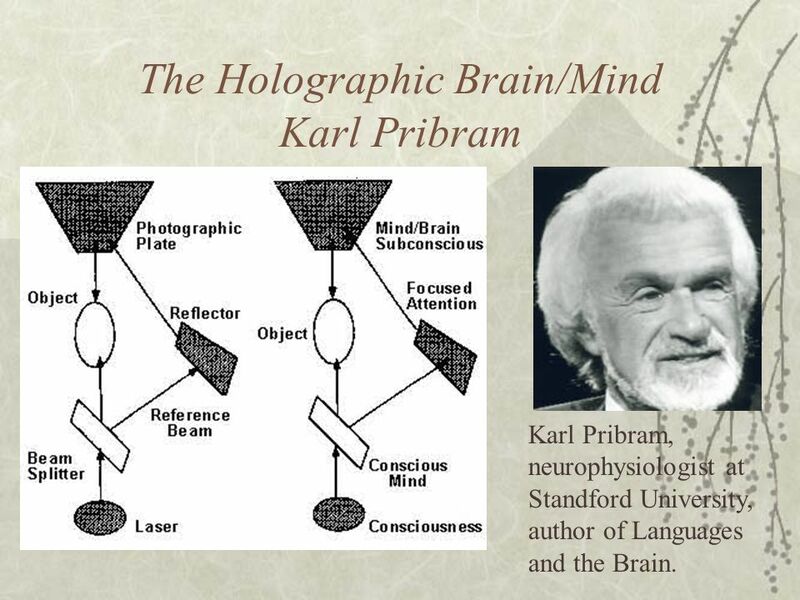 Karl Pribram, neurophysiologist at Standford University, author of Languages and the Brain. 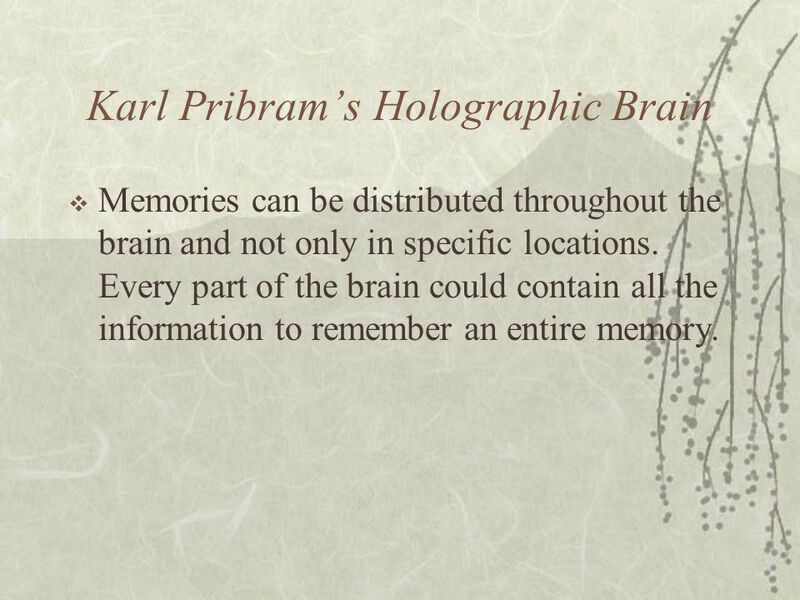 Memories can be distributed throughout the brain and not only in specific locations. 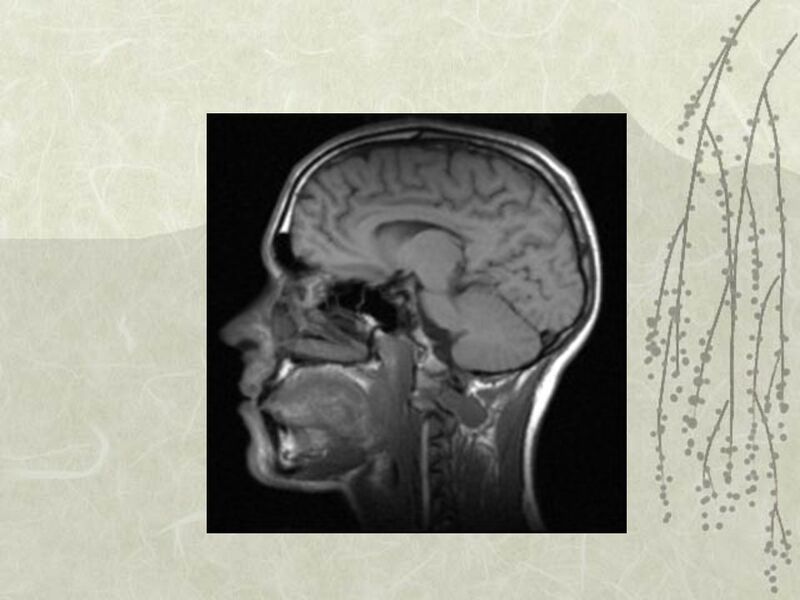 Every part of the brain could contain all the information to remember an entire memory. 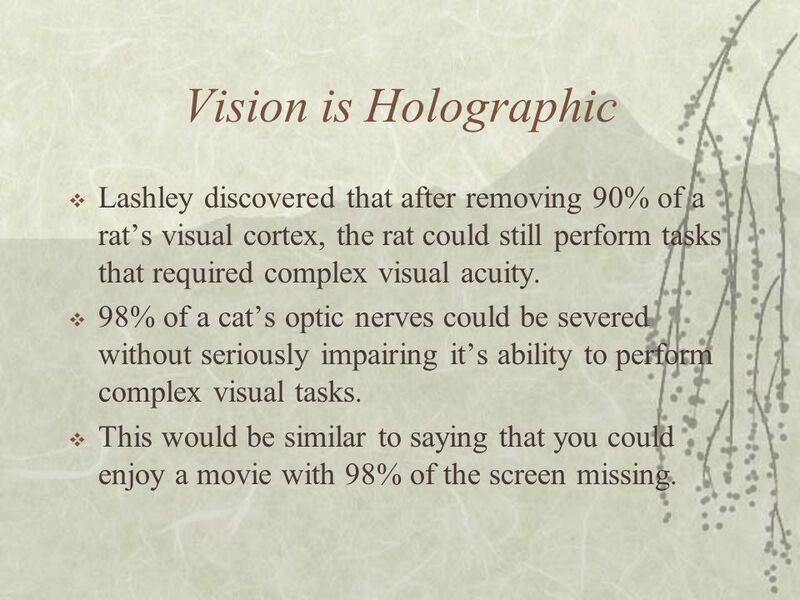 85 Vision is Holographic Lashley discovered that after removing 90% of a rat’s visual cortex, the rat could still perform tasks that required complex visual acuity. 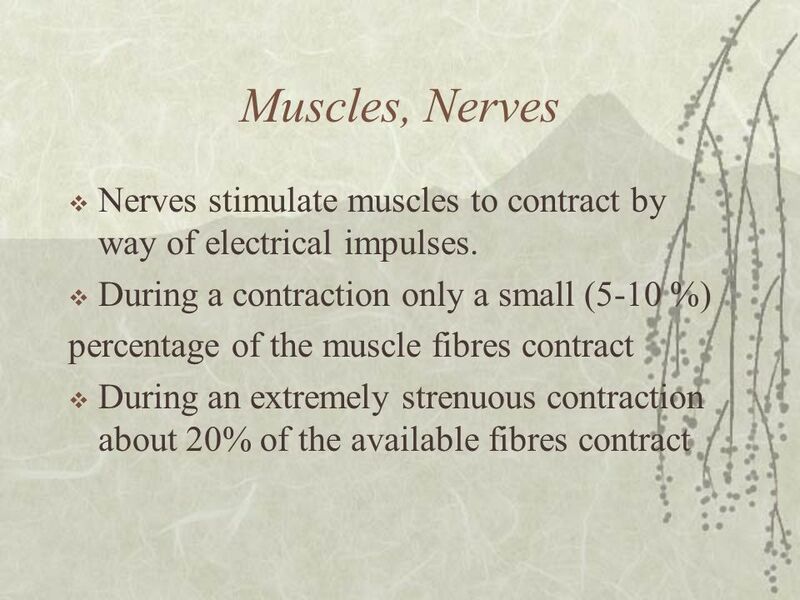 98% of a cat’s optic nerves could be severed without seriously impairing it’s ability to perform complex visual tasks. 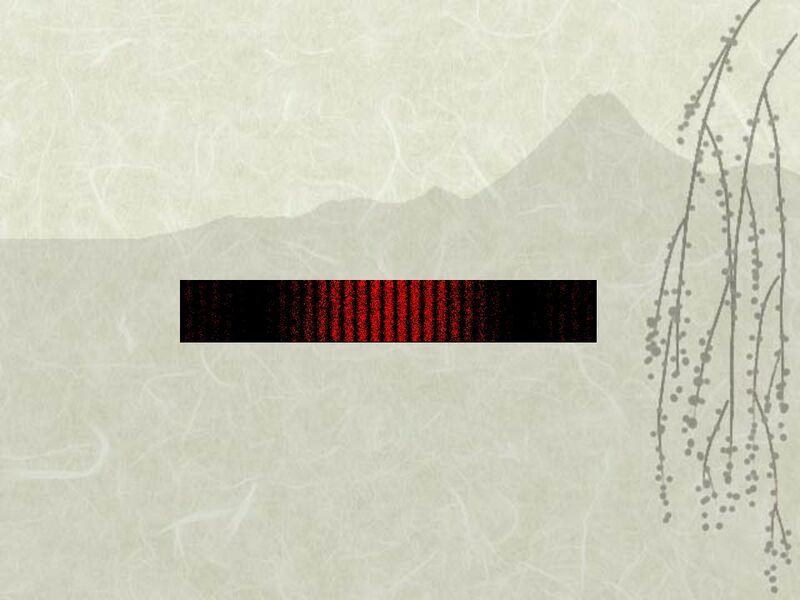 This would be similar to saying that you could enjoy a movie with 98% of the screen missing. 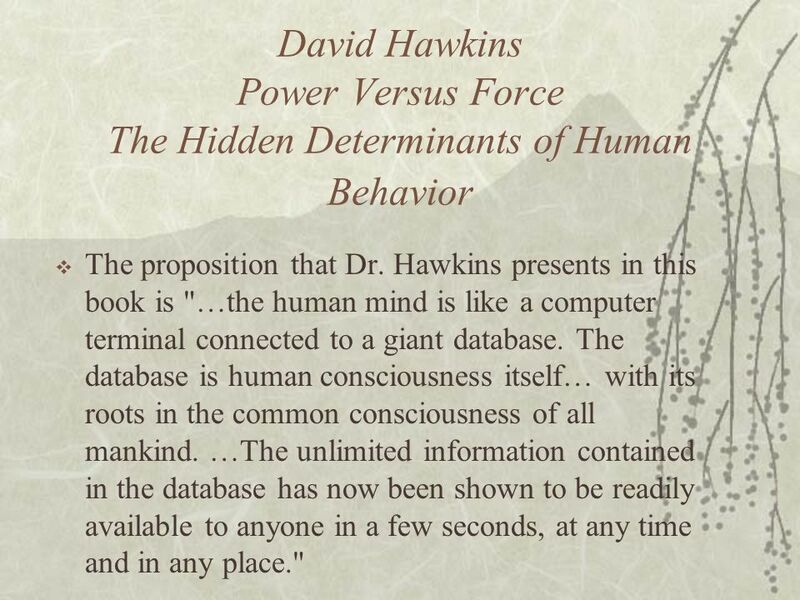 The proposition that Dr. Hawkins presents in this book is "…the human mind is like a computer terminal connected to a giant database. 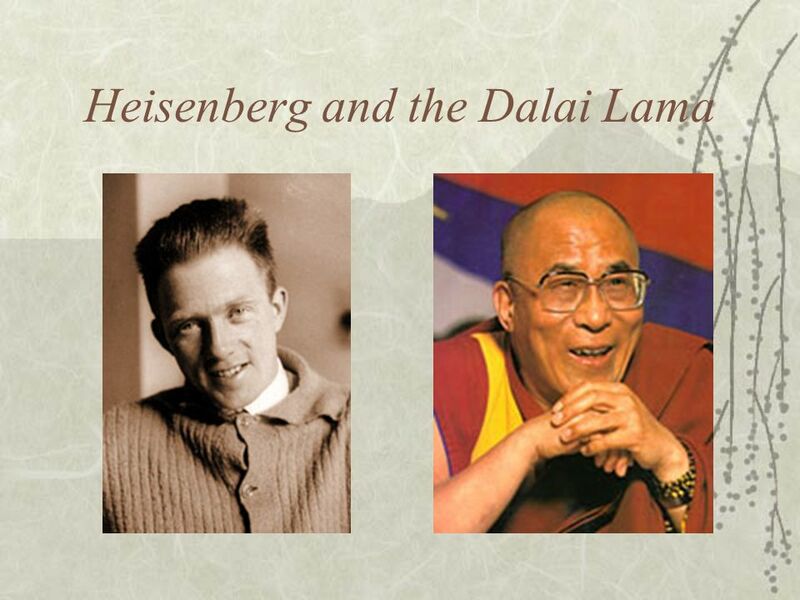 The database is human consciousness itself… with its roots in the common consciousness of all mankind. 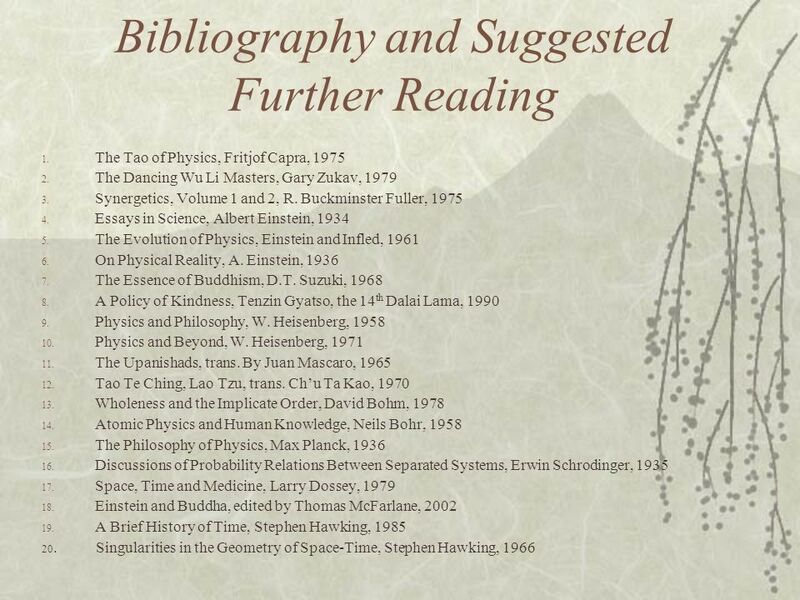 …The unlimited information contained in the database has now been shown to be readily available to anyone in a few seconds, at any time and in any place." 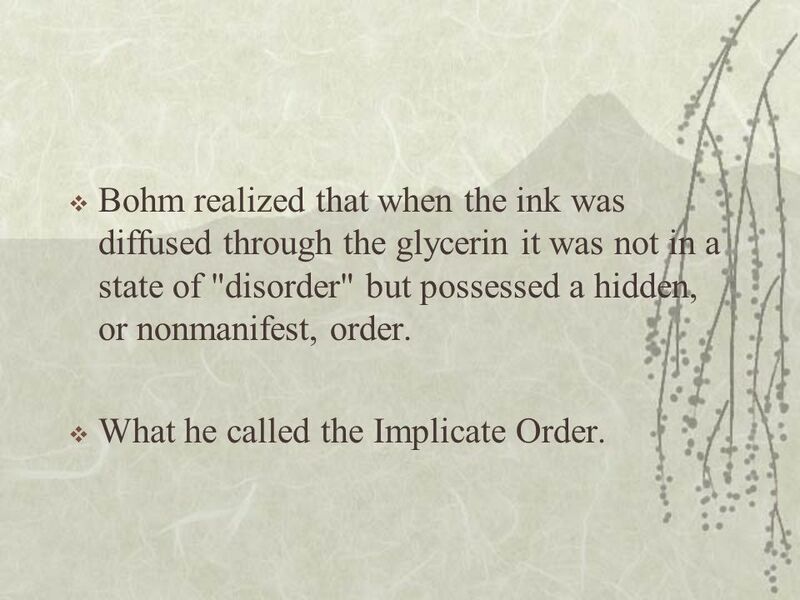 89 The ink-in-glycerine model for explicate and implicate order. 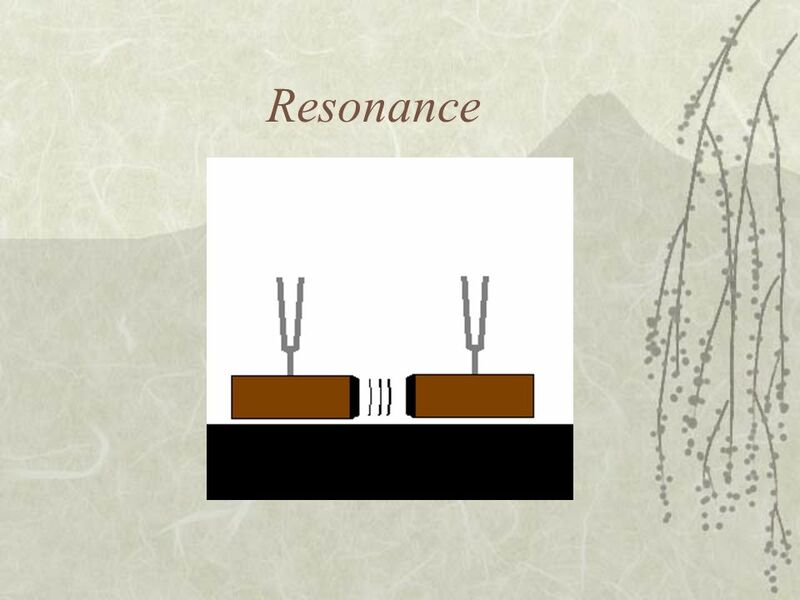 Two concentric cylinders (top view) of unequal size. 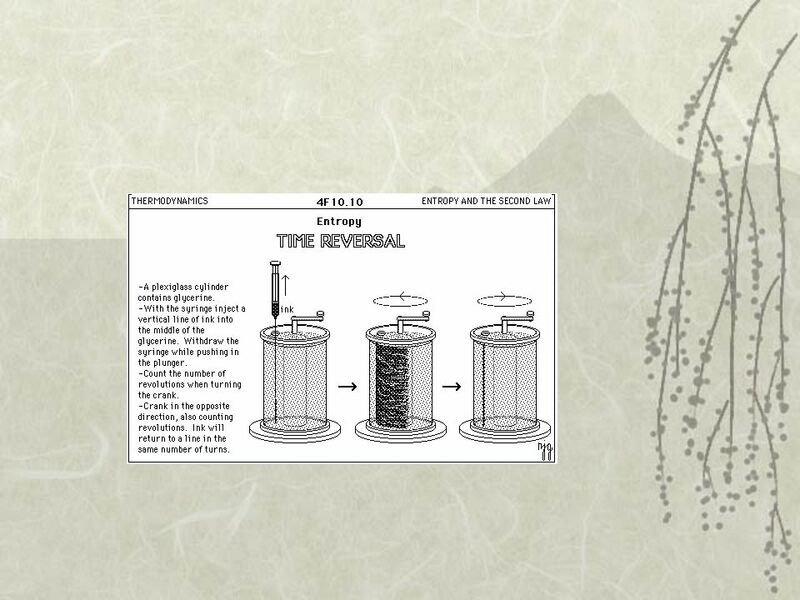 The space between the cylinders is filled with glycerine, and a droplet of insoluble ink is placed onto the fluid. 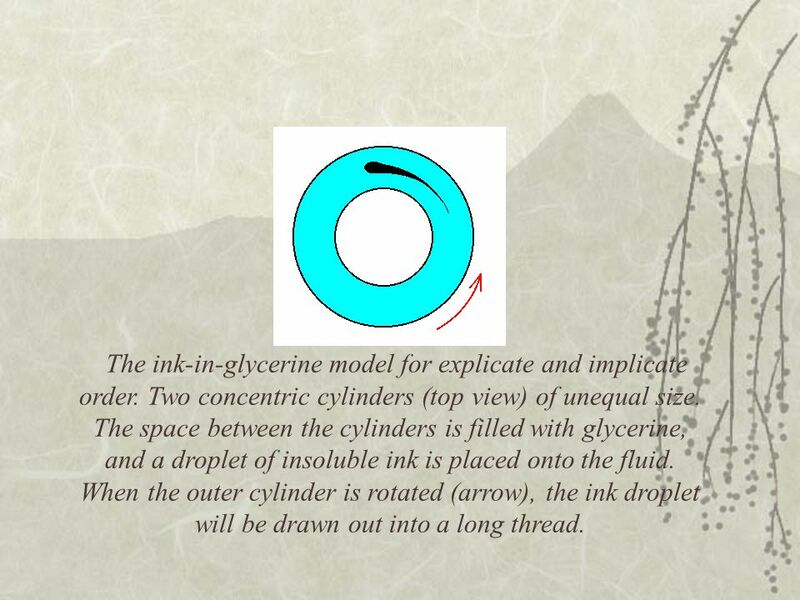 When the outer cylinder is rotated (arrow), the ink droplet will be drawn out into a long thread. 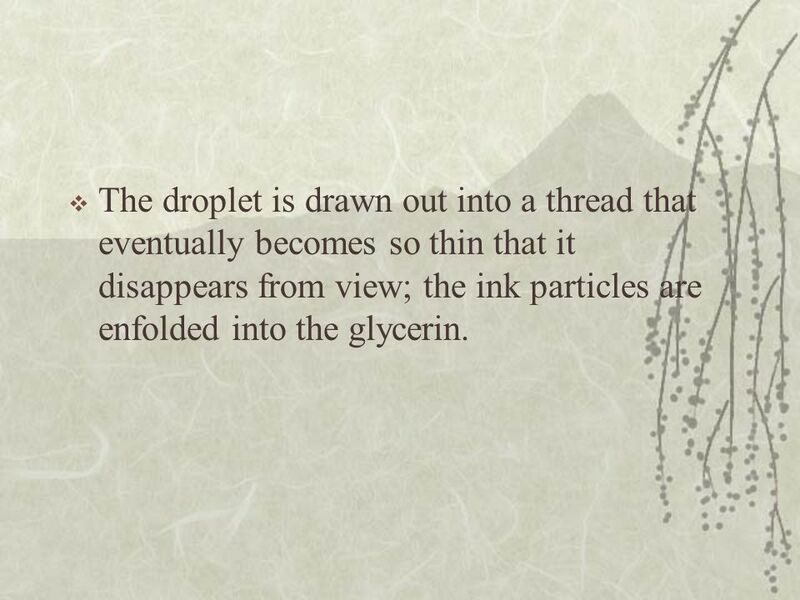 90 The droplet is drawn out into a thread that eventually becomes so thin that it disappears from view; the ink particles are enfolded into the glycerin. 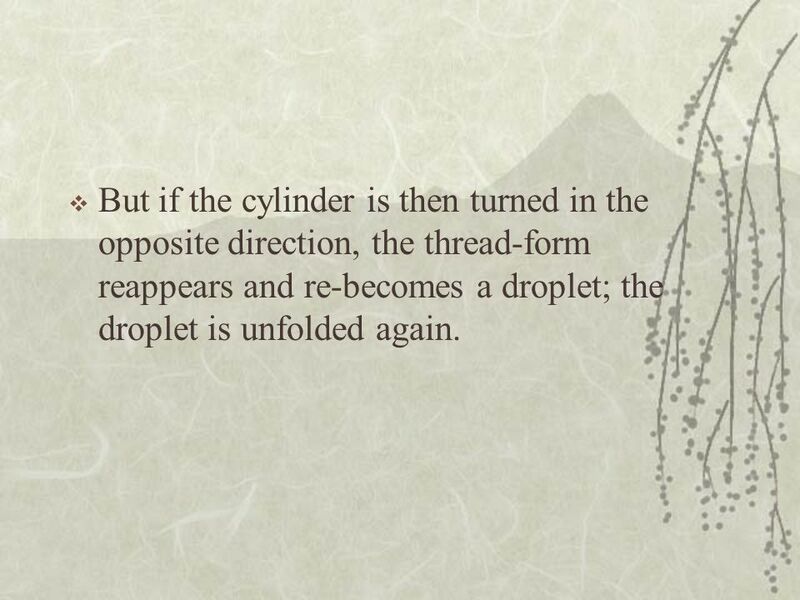 91 But if the cylinder is then turned in the opposite direction, the thread-form reappears and re-becomes a droplet; the droplet is unfolded again. 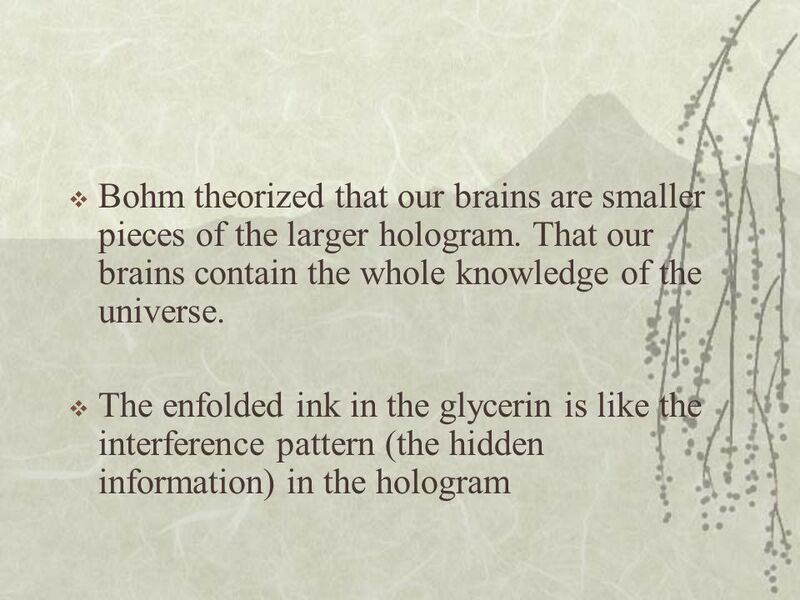 92 Bohm realized that when the ink was diffused through the glycerin it was not in a state of "disorder" but possessed a hidden, or nonmanifest, order. 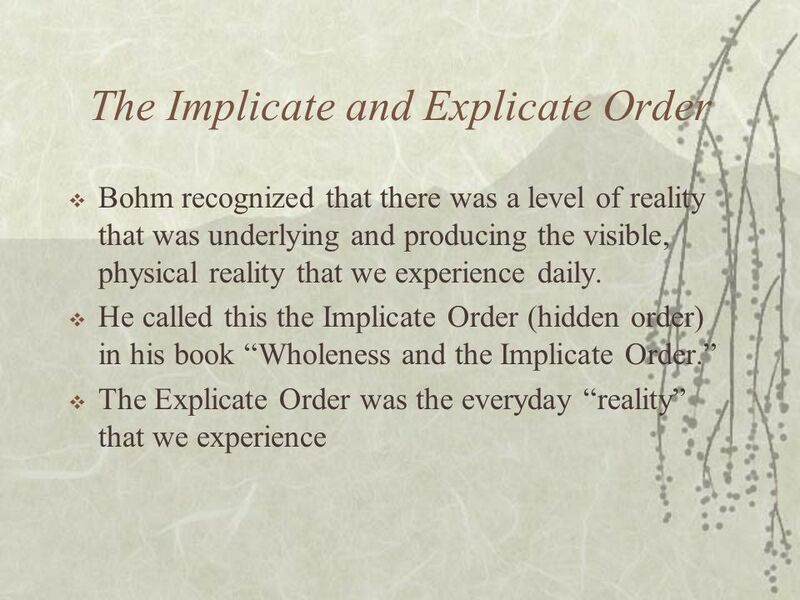 What he called the Implicate Order. 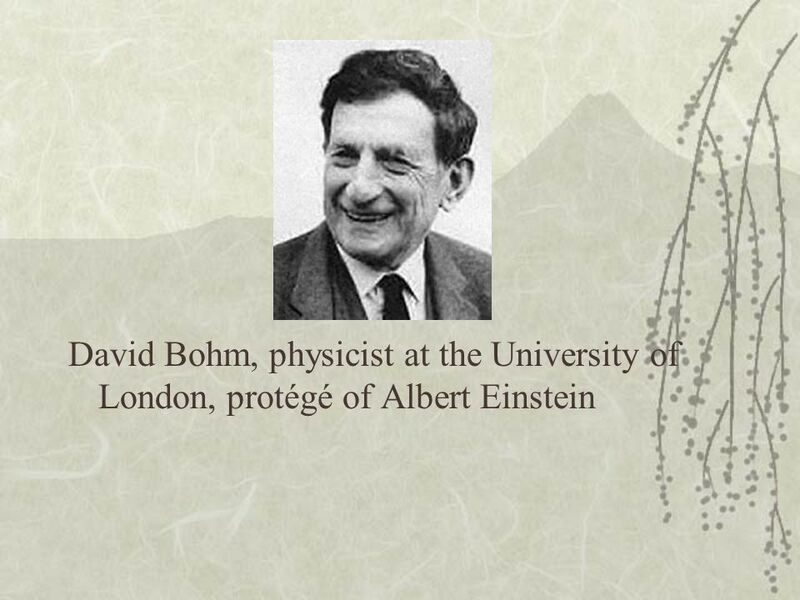 93 Bohm and the Two Truths? 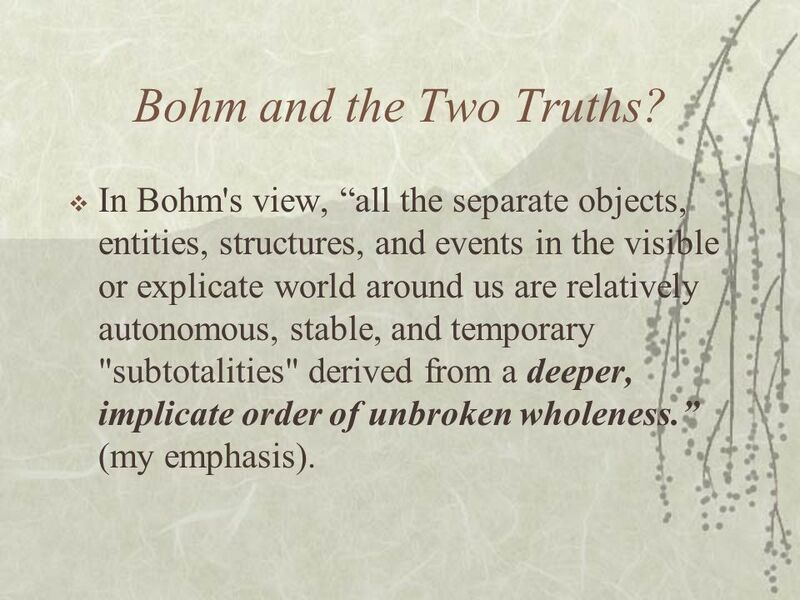 In Bohm's view, “all the separate objects, entities, structures, and events in the visible or explicate world around us are relatively autonomous, stable, and temporary "subtotalities" derived from a deeper, implicate order of unbroken wholeness.” (my emphasis). 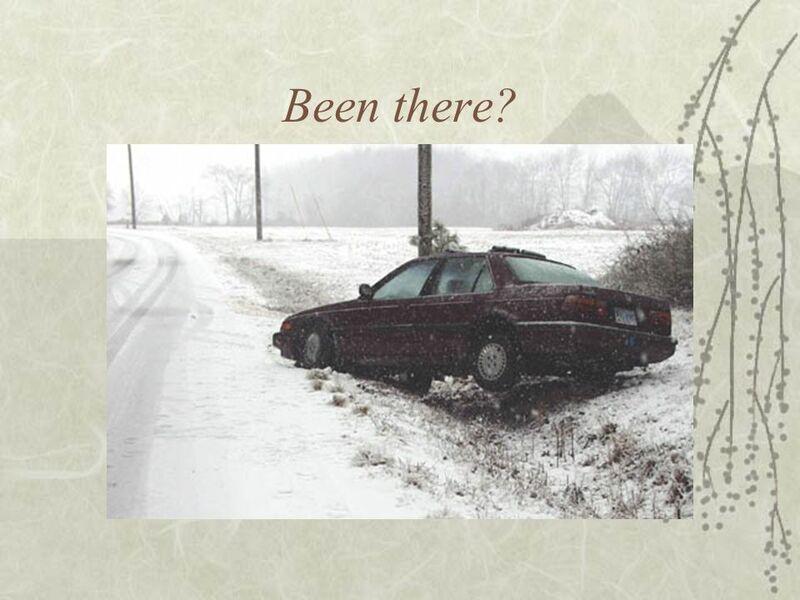 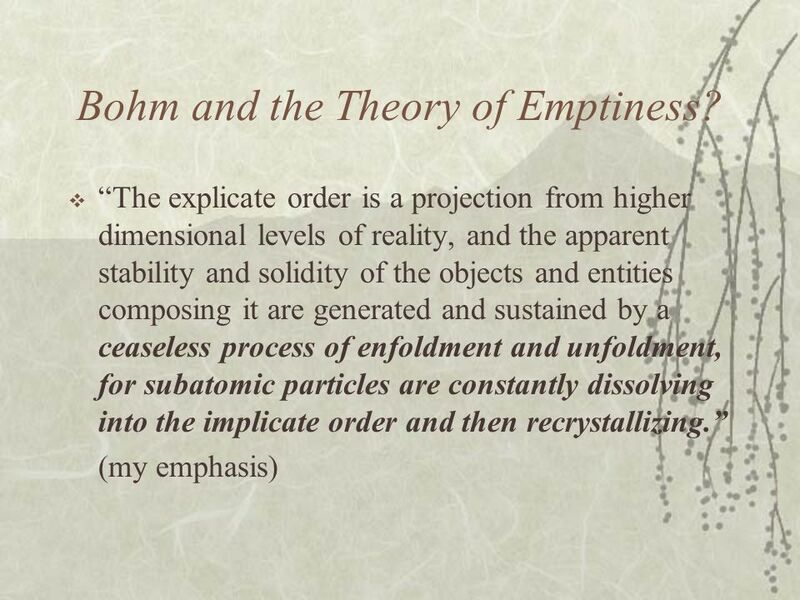 96 Bohm and the Theory of Emptiness? 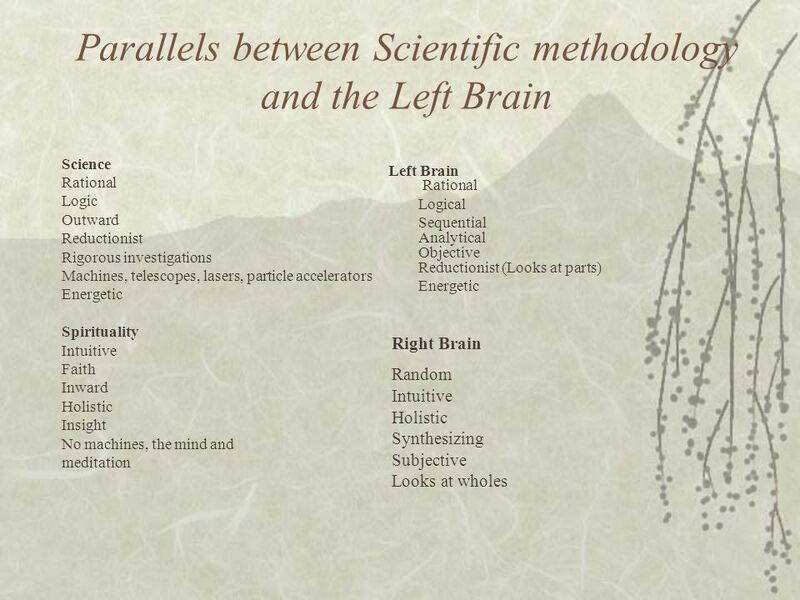 98 Our brains are our windows of perception. 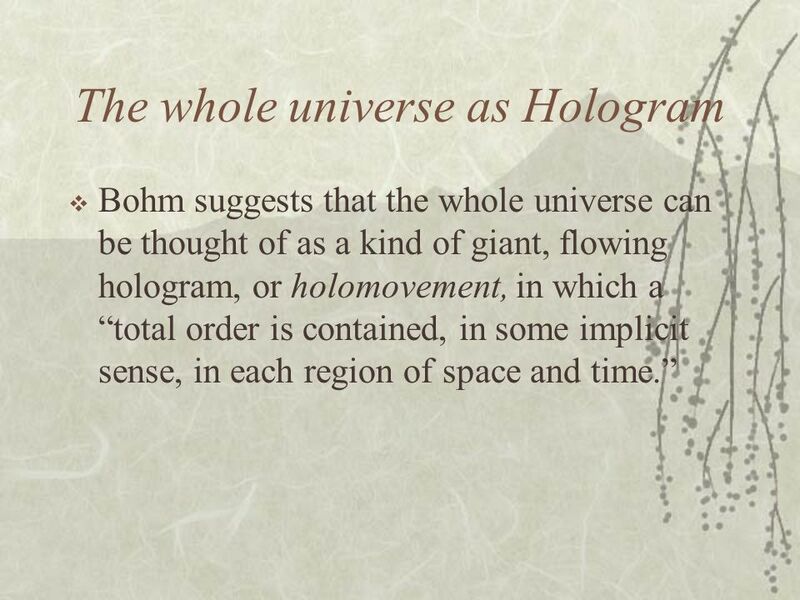 So, you can see how each mind has a limited perspective of the universal hologram. 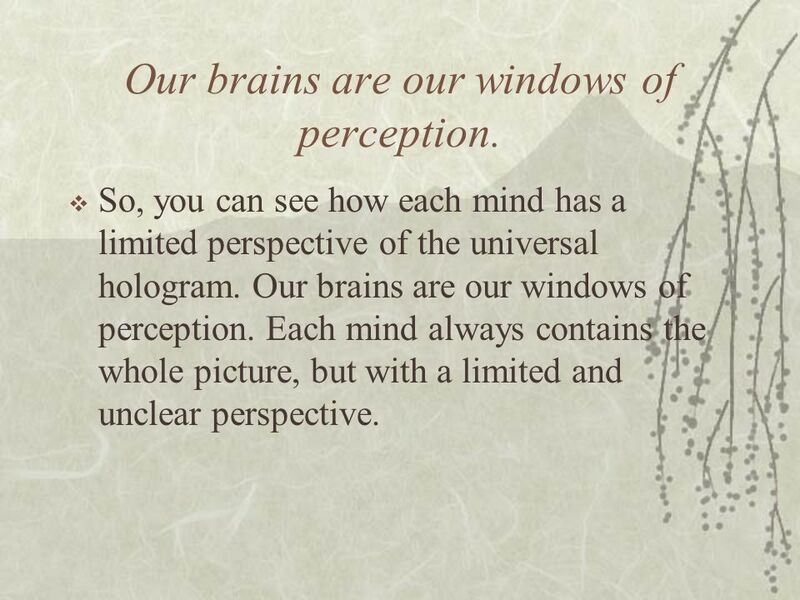 Our brains are our windows of perception. 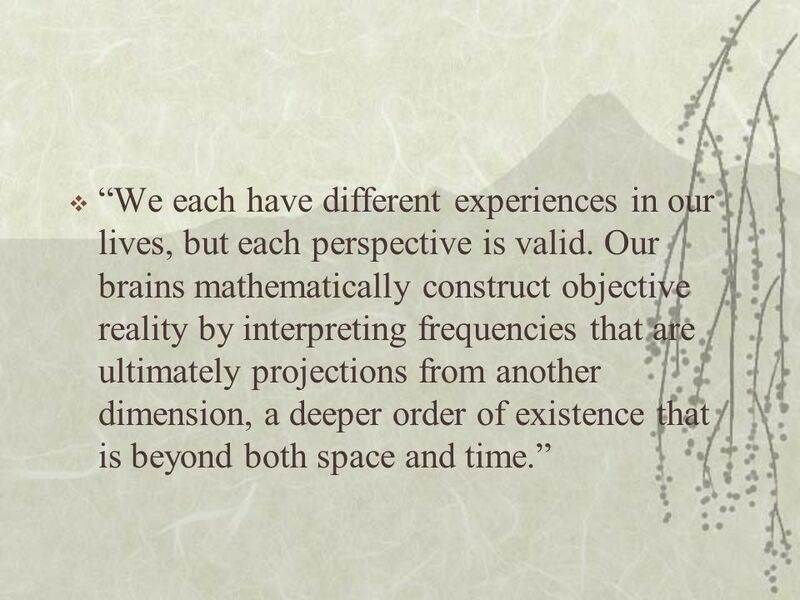 Each mind always contains the whole picture, but with a limited and unclear perspective. 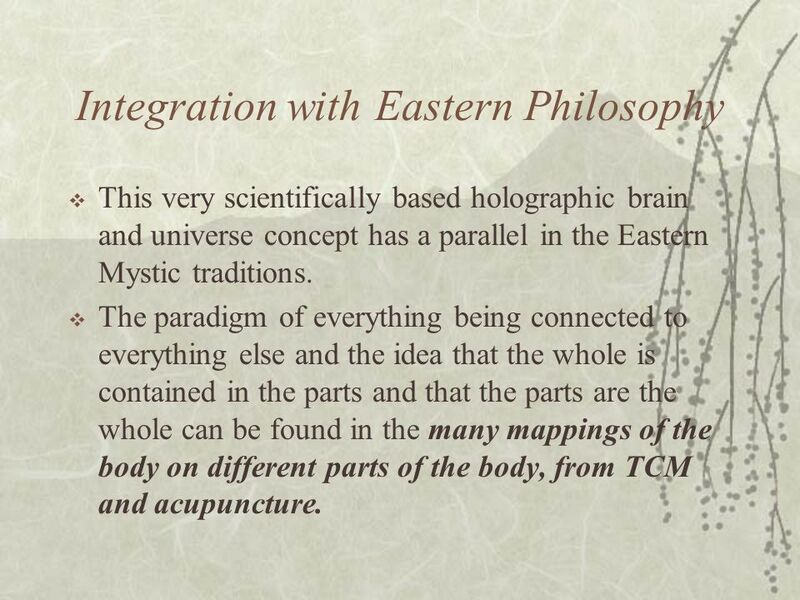 This very scientifically based holographic brain and universe concept has a parallel in the Eastern Mystic traditions. 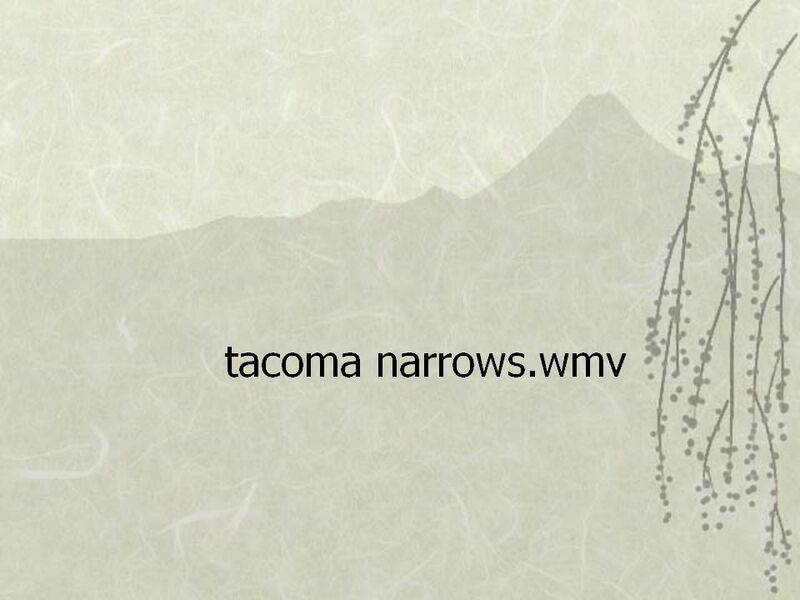 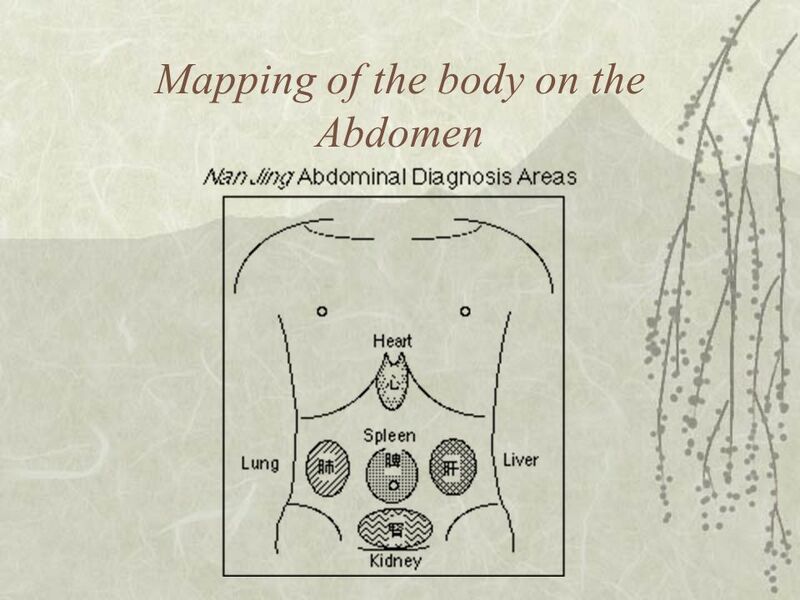 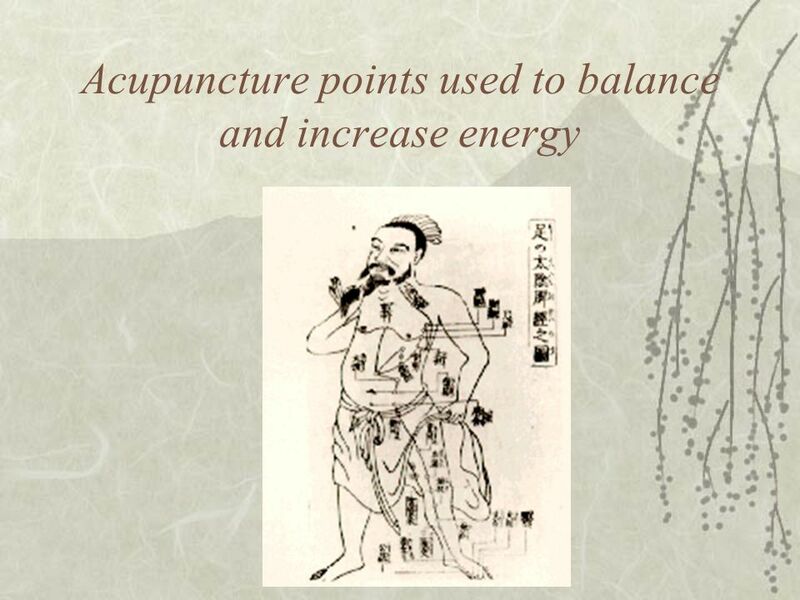 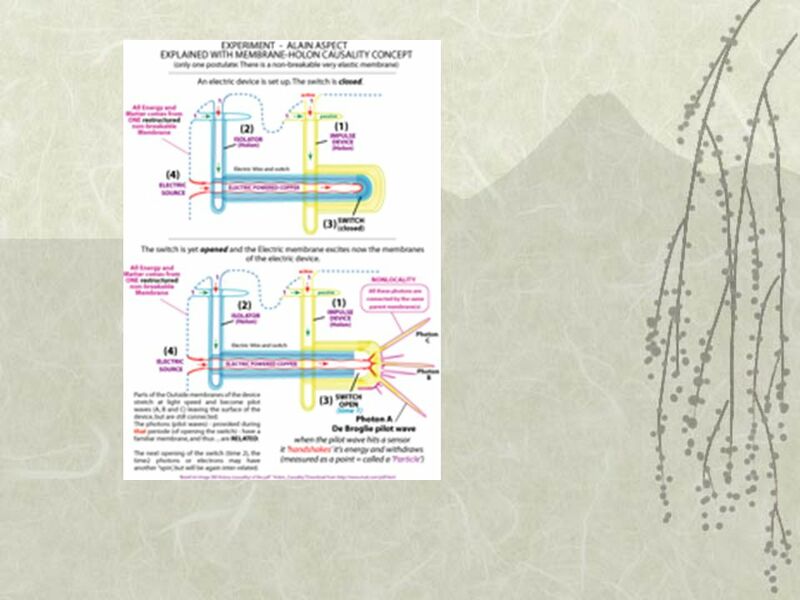 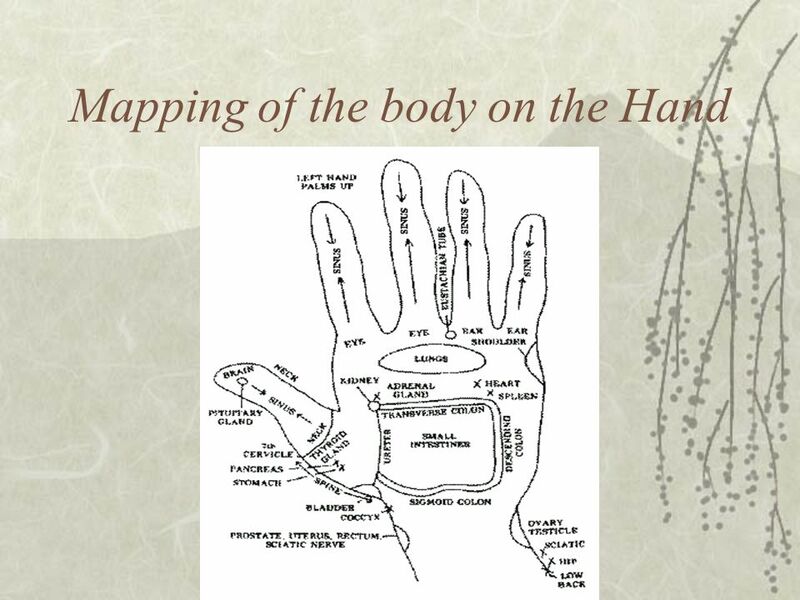 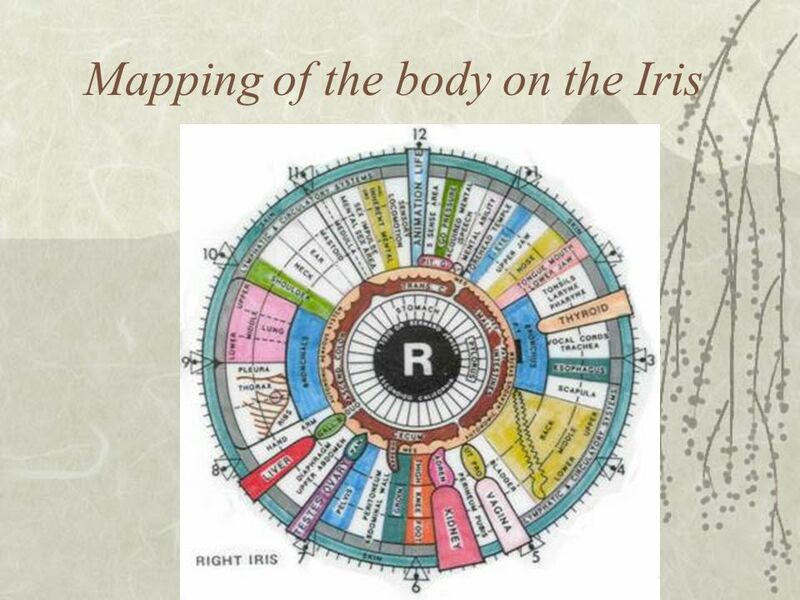 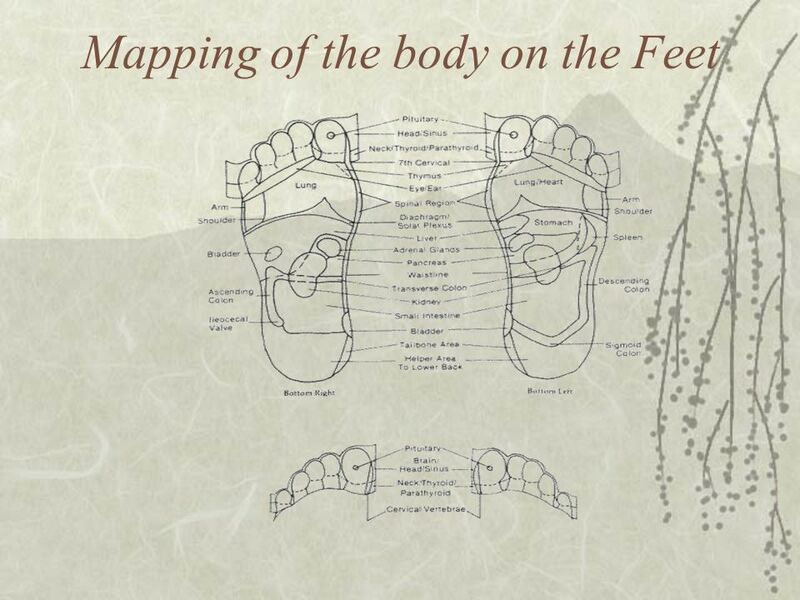 The paradigm of everything being connected to everything else and the idea that the whole is contained in the parts and that the parts are the whole can be found in the many mappings of the body on different parts of the body, from TCM and acupuncture. 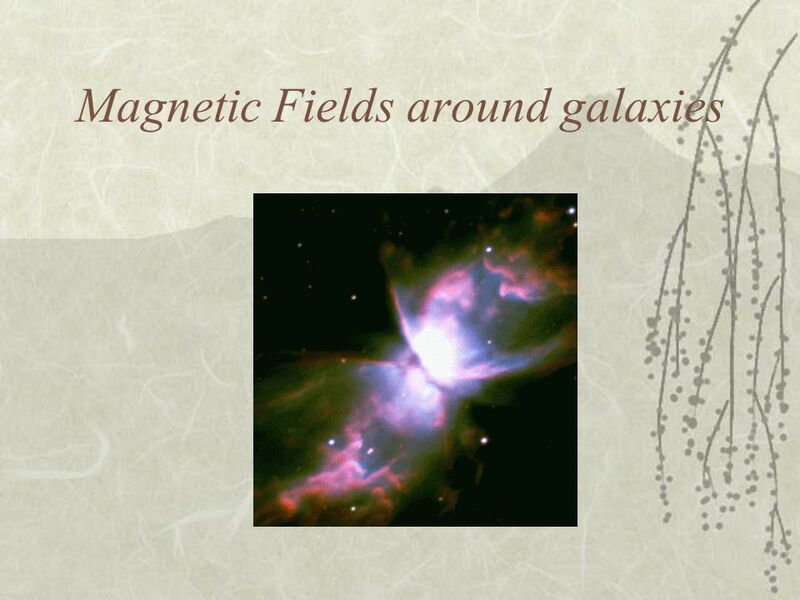 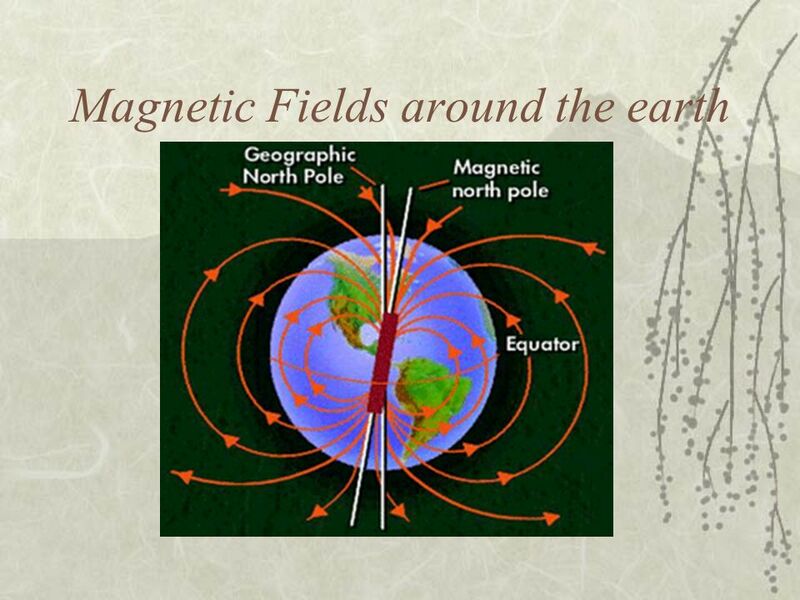 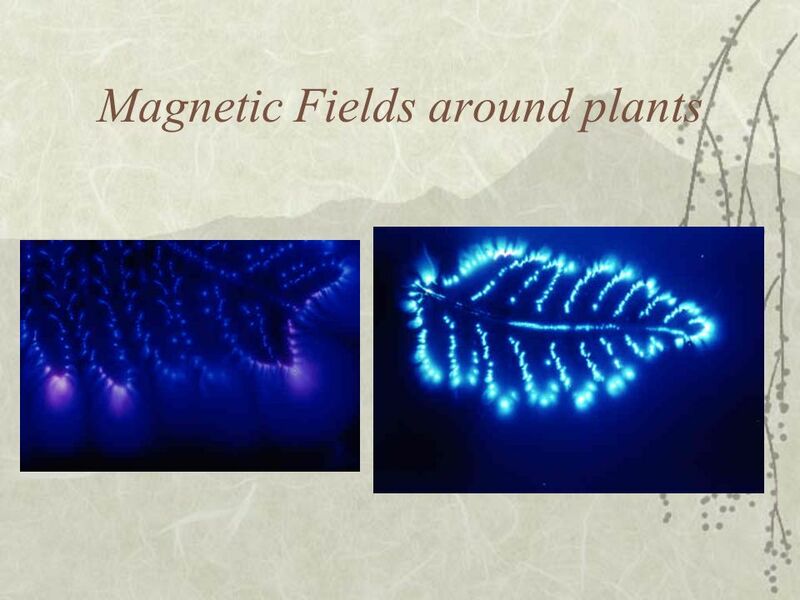 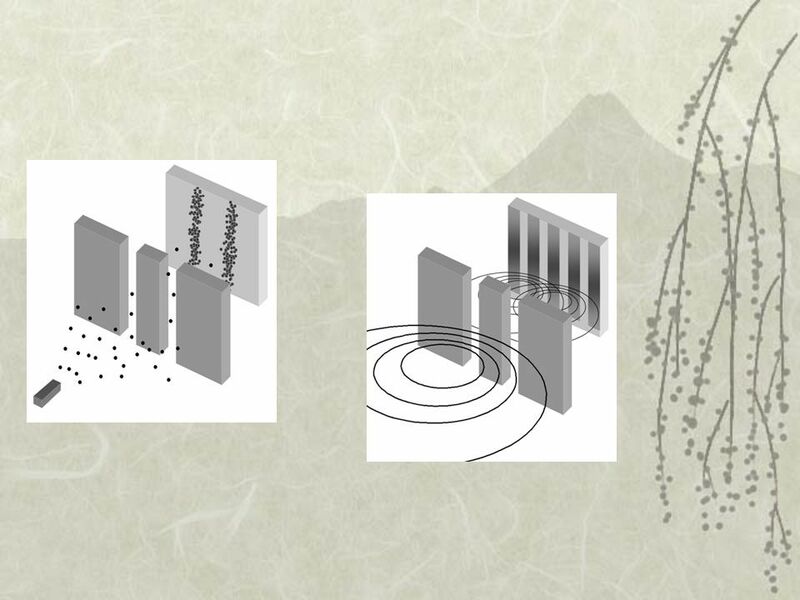 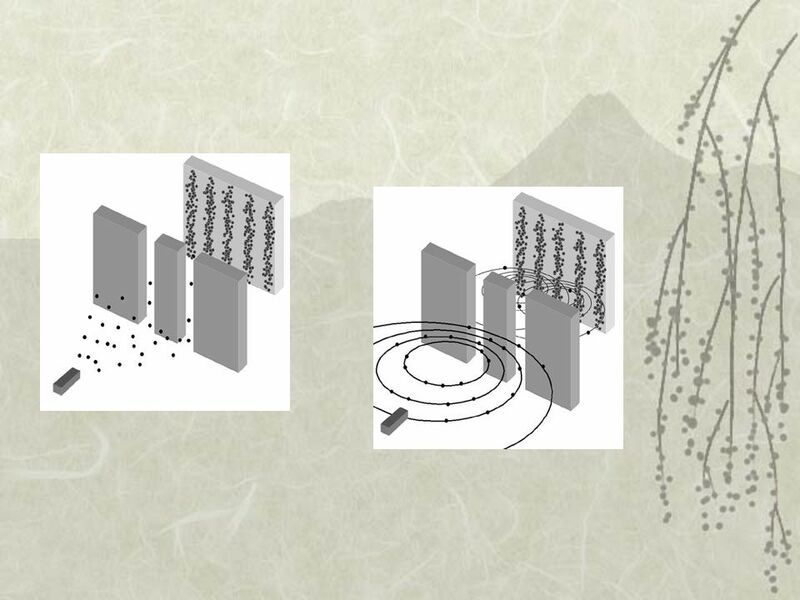 Magnetic fields (informational fields) can produce a movement of electrons. 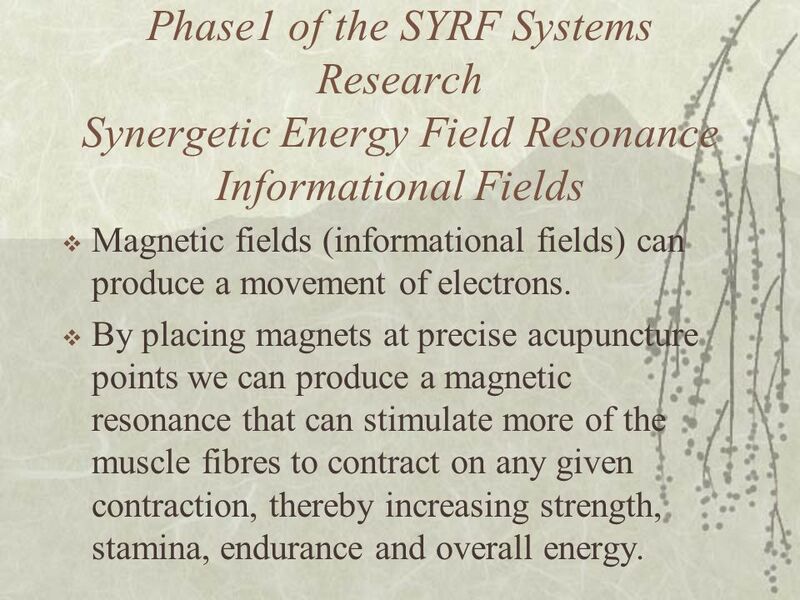 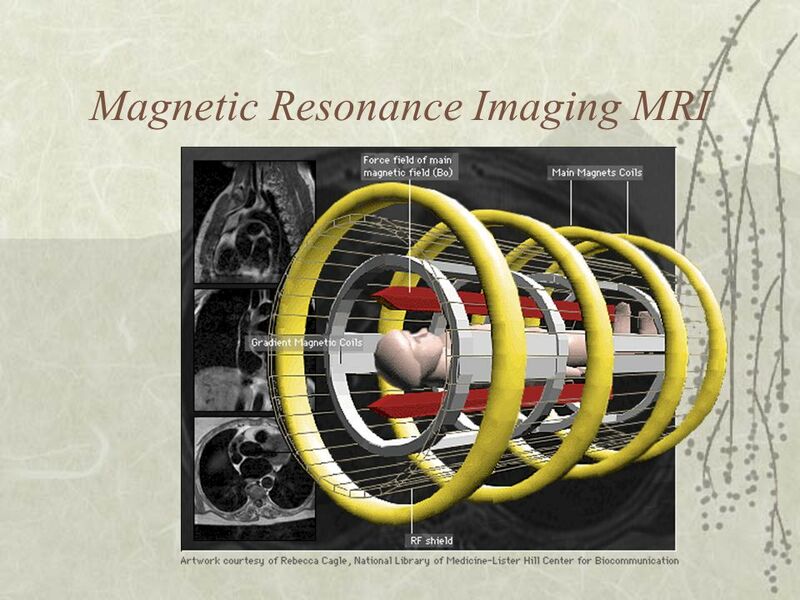 By placing magnets at precise acupuncture points we can produce a magnetic resonance that can stimulate more of the muscle fibres to contract on any given contraction, thereby increasing strength, stamina, endurance and overall energy. 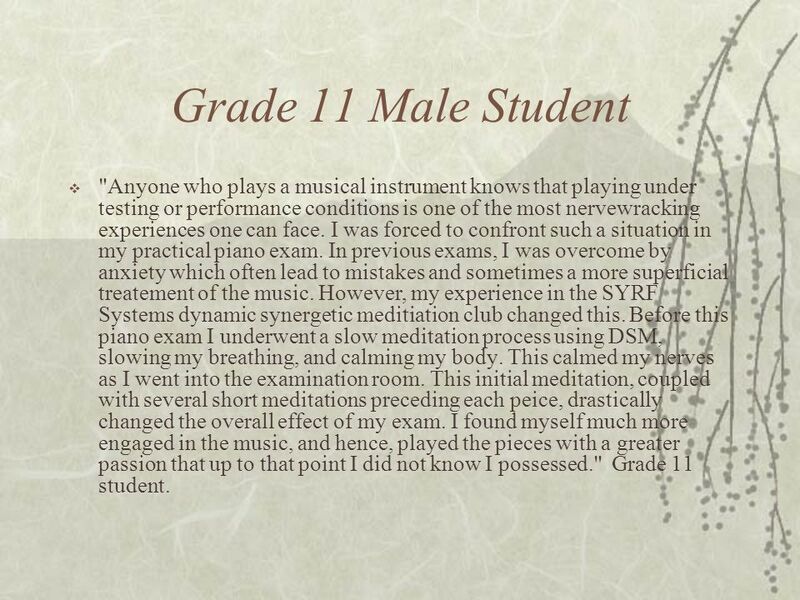 130 Grade 11 Male Student "Anyone who plays a musical instrument knows that playing under testing or performance conditions is one of the most nervewracking experiences one can face. 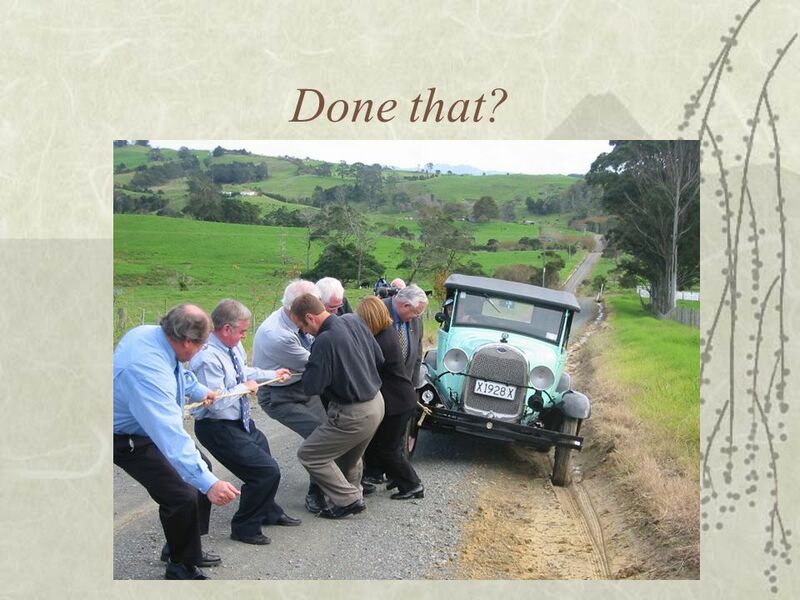 I was forced to confront such a situation in my practical piano exam. 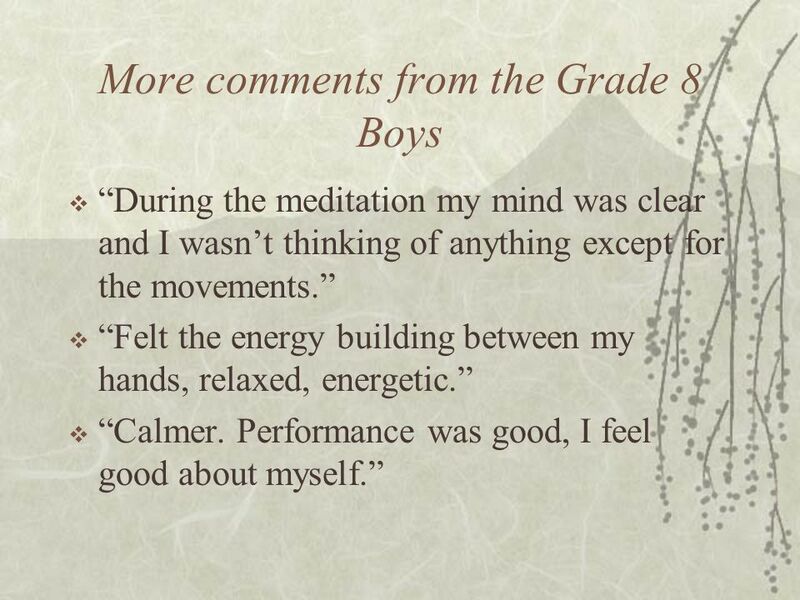 In previous exams, I was overcome by anxiety which often lead to mistakes and sometimes a more superficial treatement of the music. 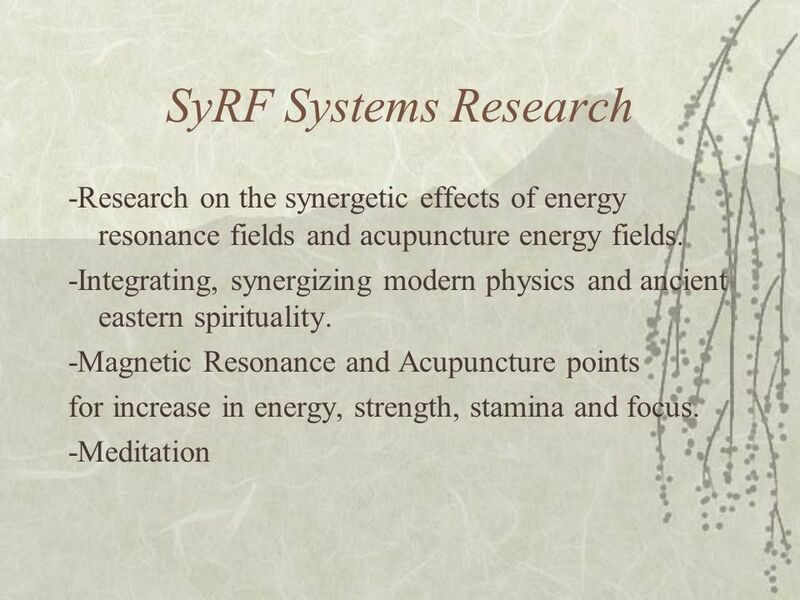 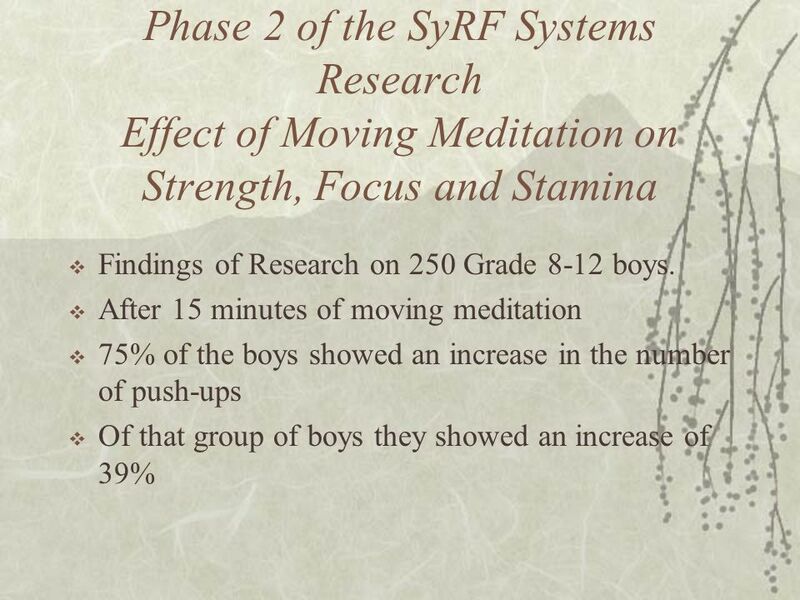 However, my experience in the SYRF Systems dynamic synergetic meditiation club changed this. 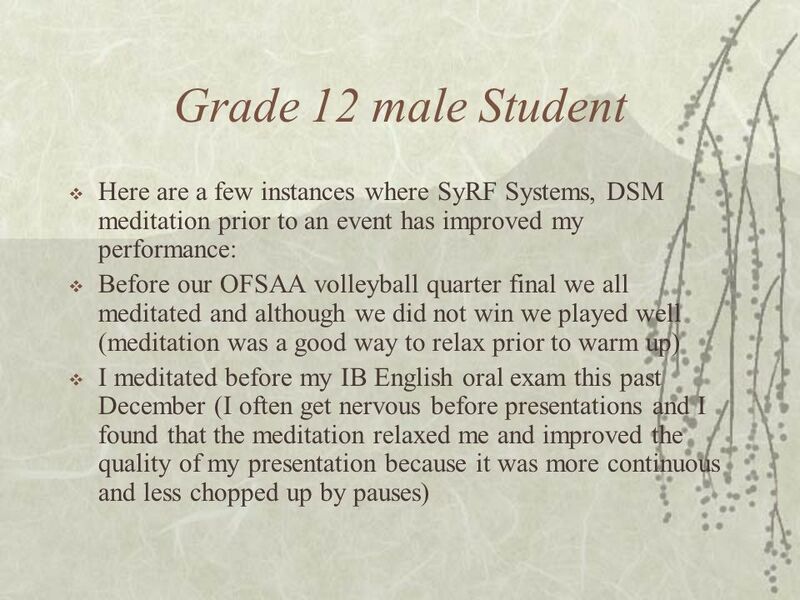 Before this piano exam I underwent a slow meditation process using DSM, slowing my breathing, and calming my body. 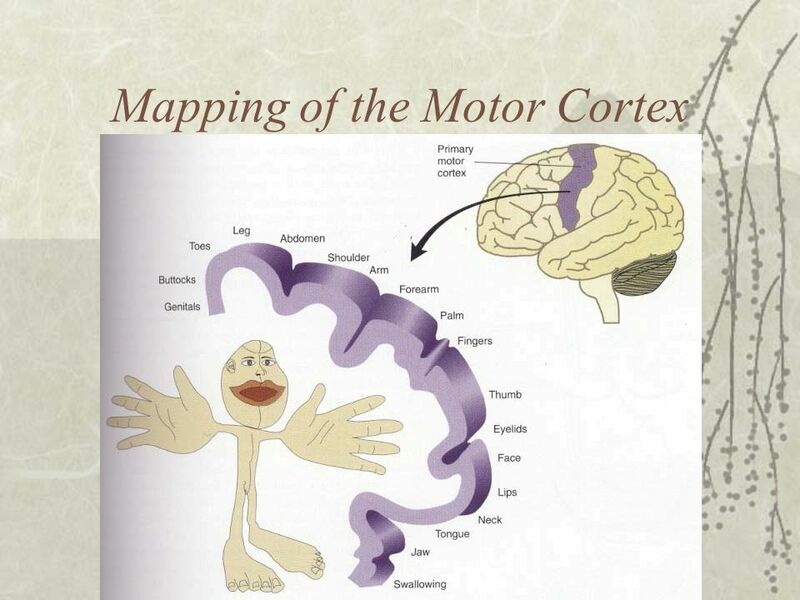 This calmed my nerves as I went into the examination room. 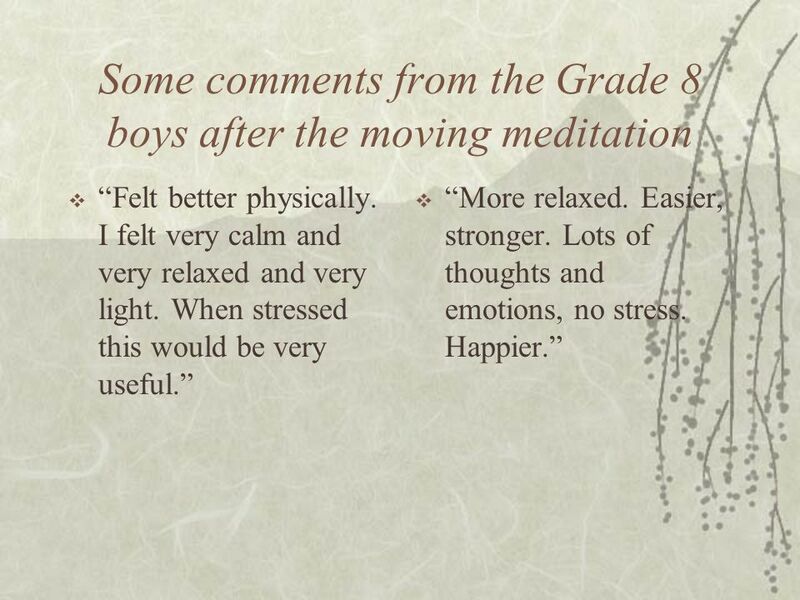 This initial meditation, coupled with several short meditations preceding each peice, drastically changed the overall effect of my exam. 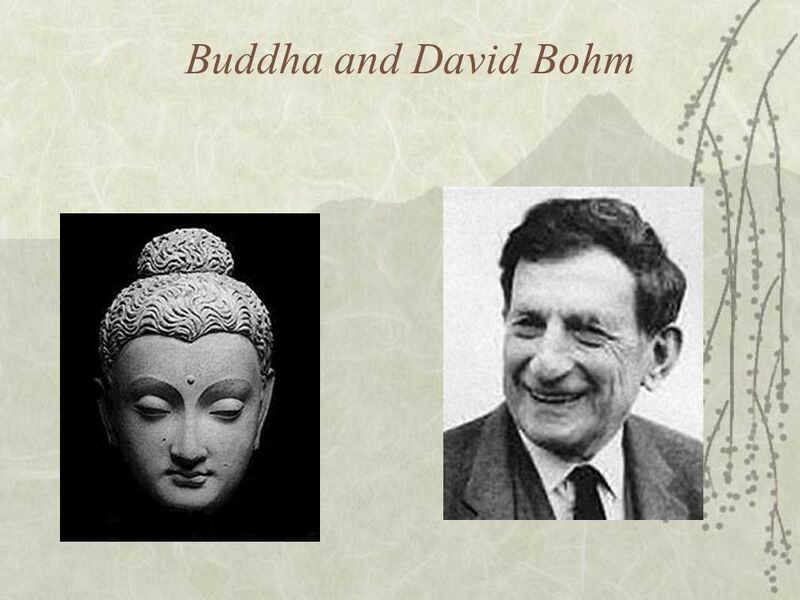 I found myself much more engaged in the music, and hence, played the pieces with a greater passion that up to that point I did not know I possessed." 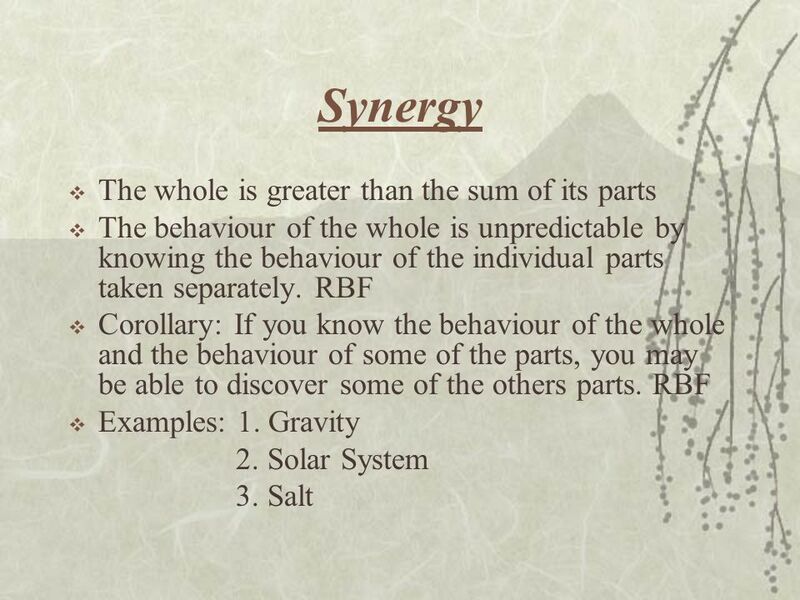 Grade 11 student. 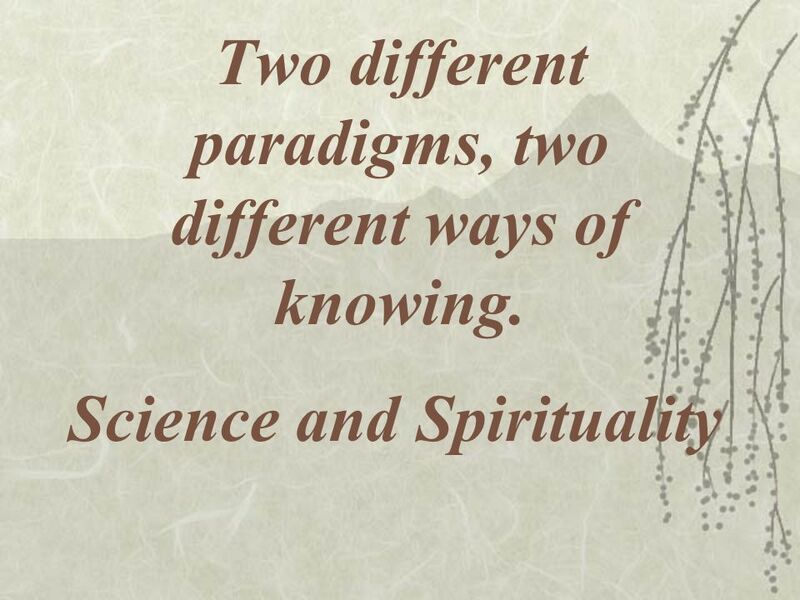 Observe and experience, for yourself, Nature and the Universe to find out “What is going on. 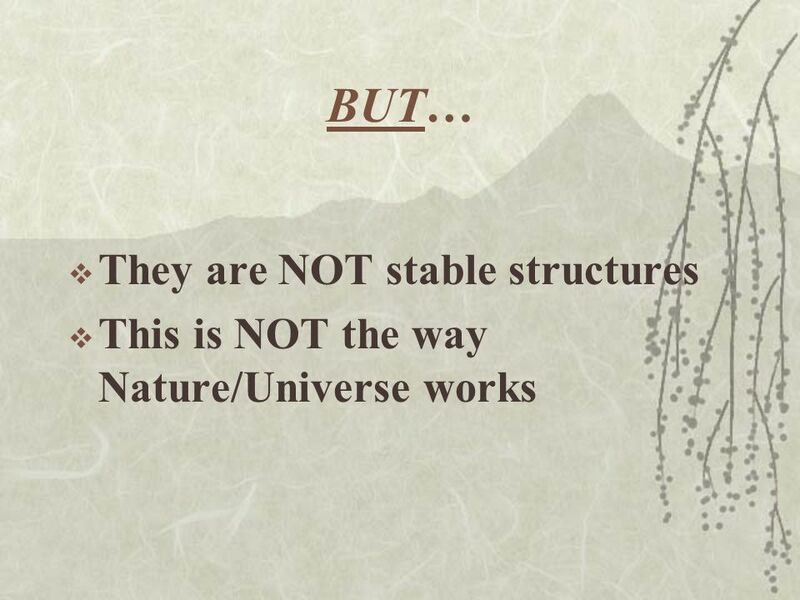 How does Nature work? 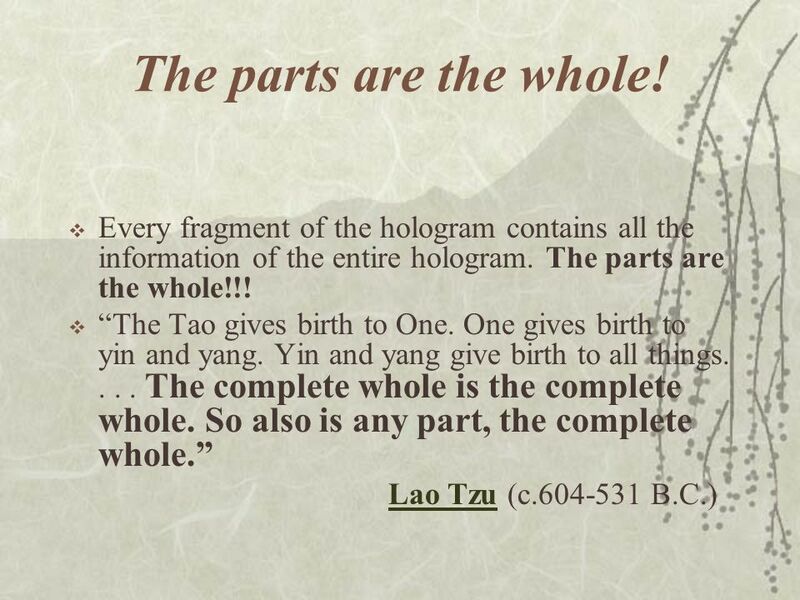 What is the truth?” 2. 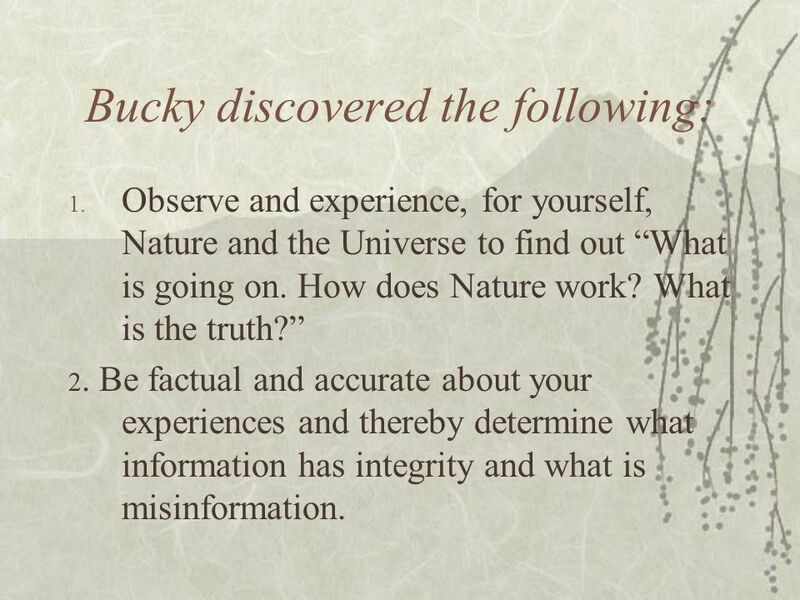 Be factual and accurate about your experiences and thereby determine what information has integrity and what is misinformation. 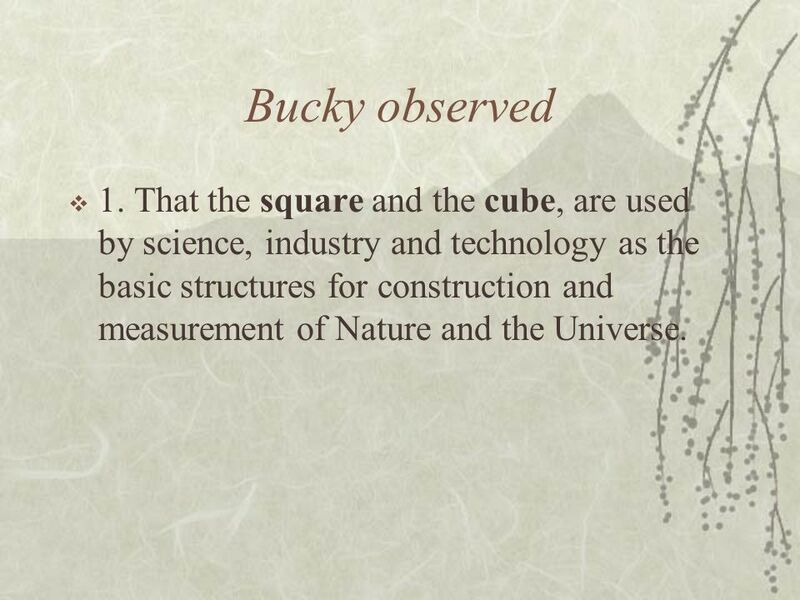 143 Bucky observed 1. 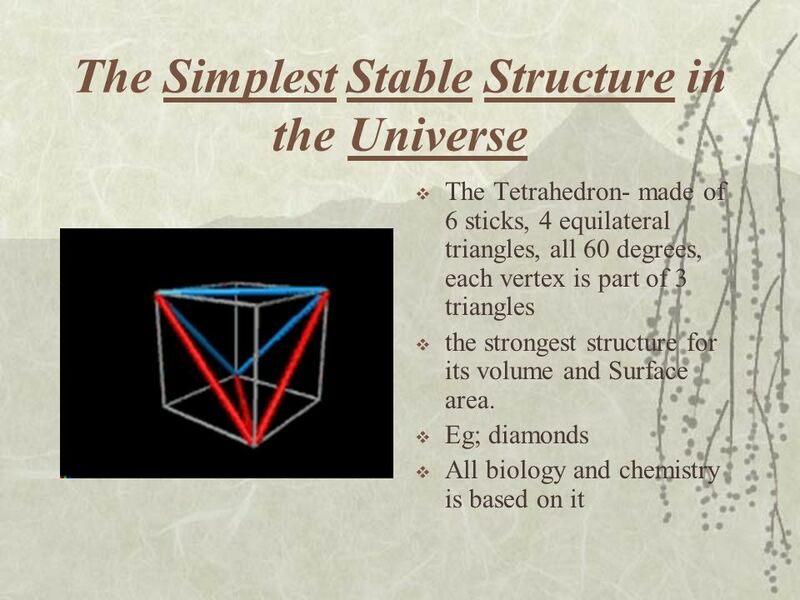 That the square and the cube, are used by science, industry and technology as the basic structures for construction and measurement of Nature and the Universe. 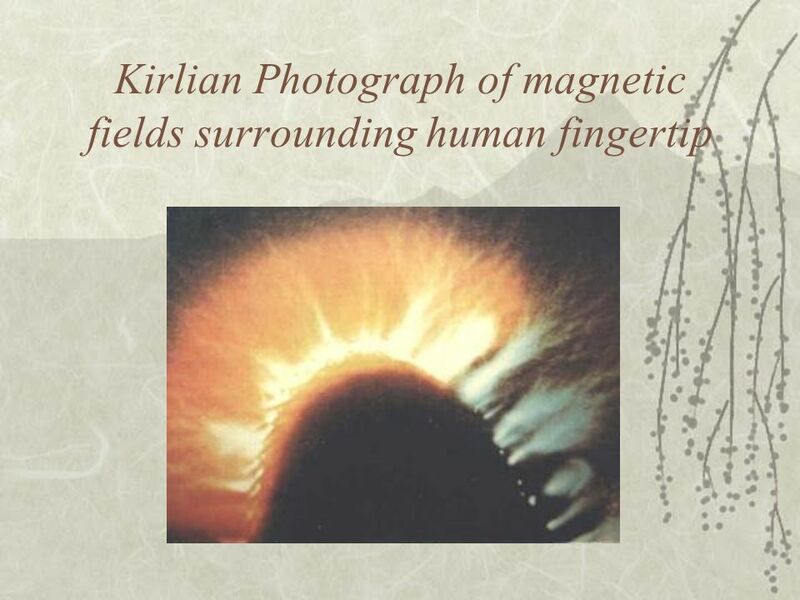 148 From the observation of Nature, from experience, new discoveries can arise. 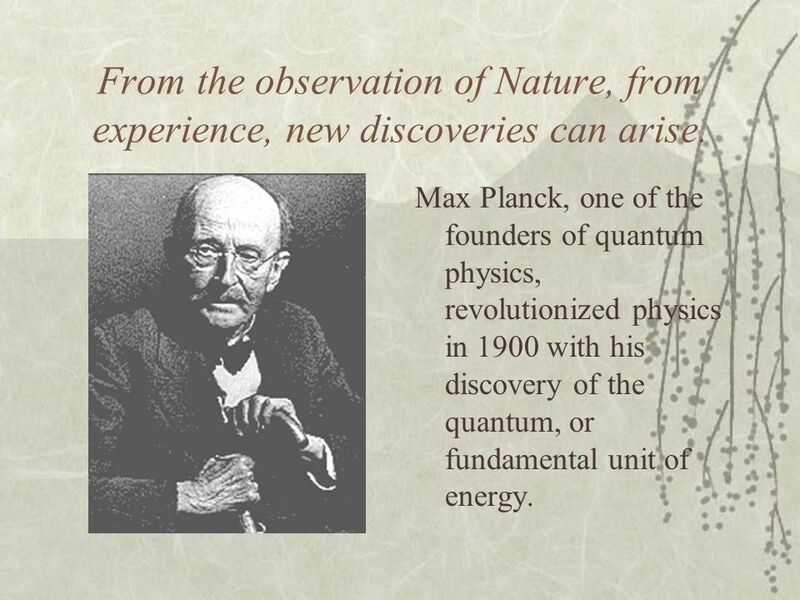 Max Planck, one of the founders of quantum physics, revolutionized physics in 1900 with his discovery of the quantum, or fundamental unit of energy. 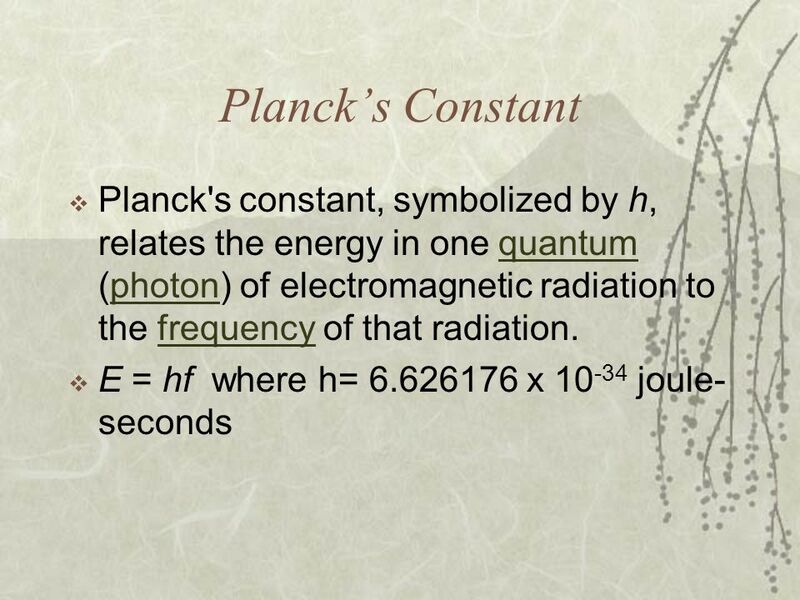 150 Consider this Why would the smallest package of energy in the universe NOT be a whole number??? 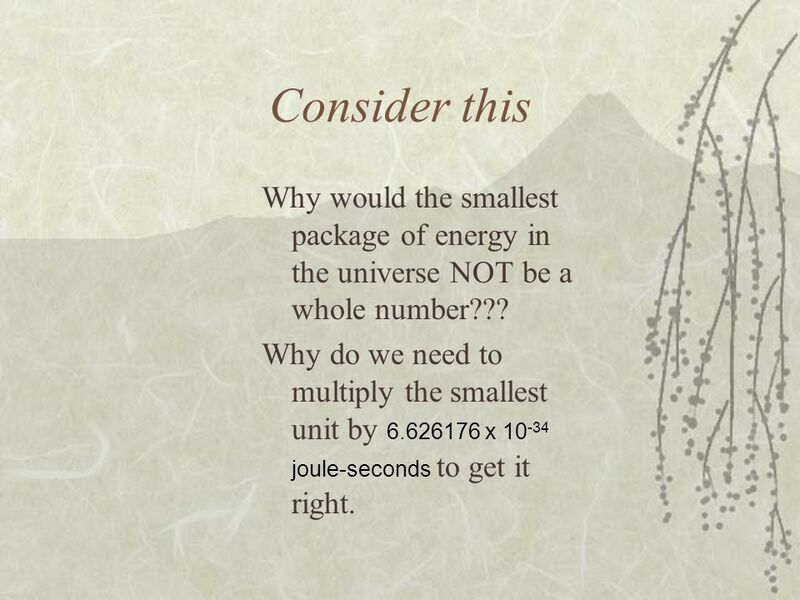 Why do we need to multiply the smallest unit by x joule-seconds to get it right. 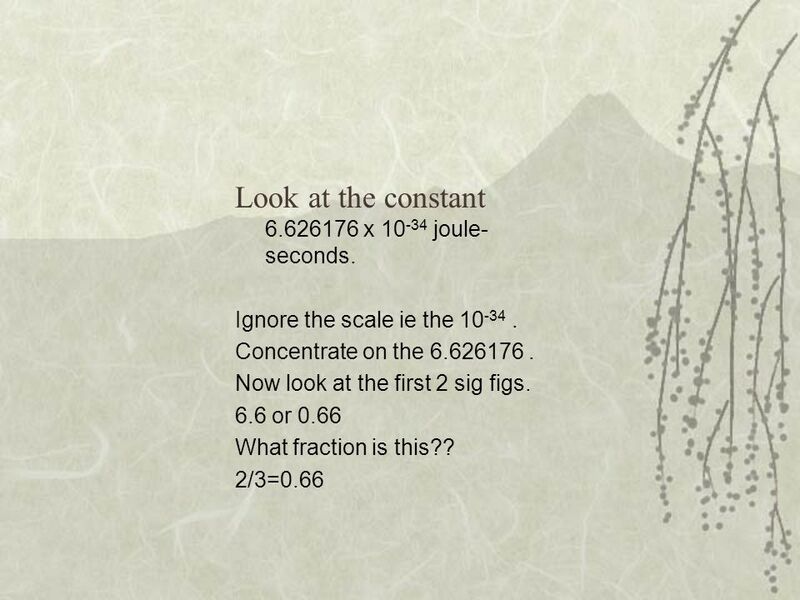 151 Look at the constant 6.626176 x 10-34 joule-seconds. 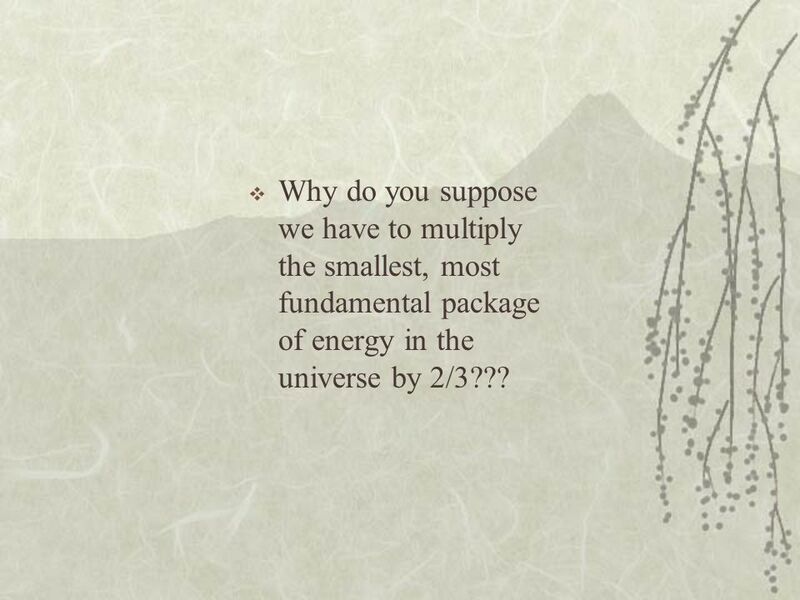 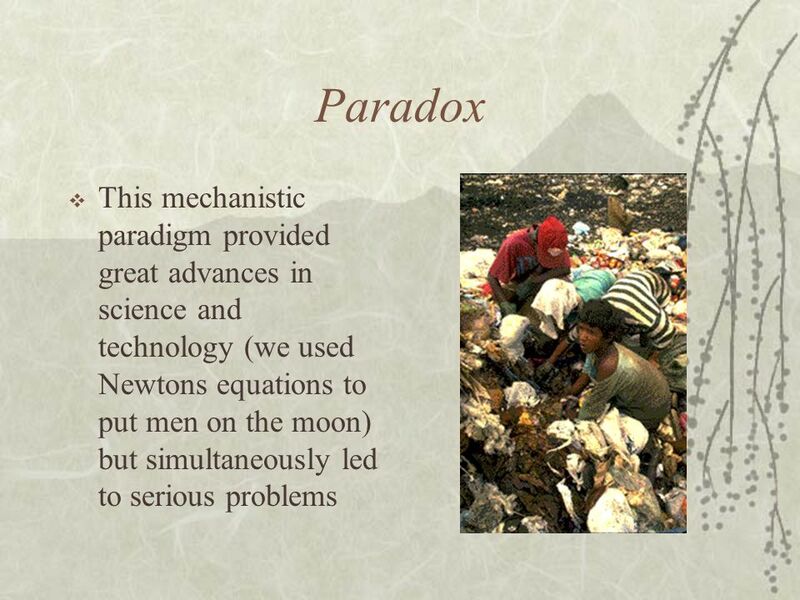 152 Why do you suppose we have to multiply the smallest, most fundamental package of energy in the universe by 2/3??? 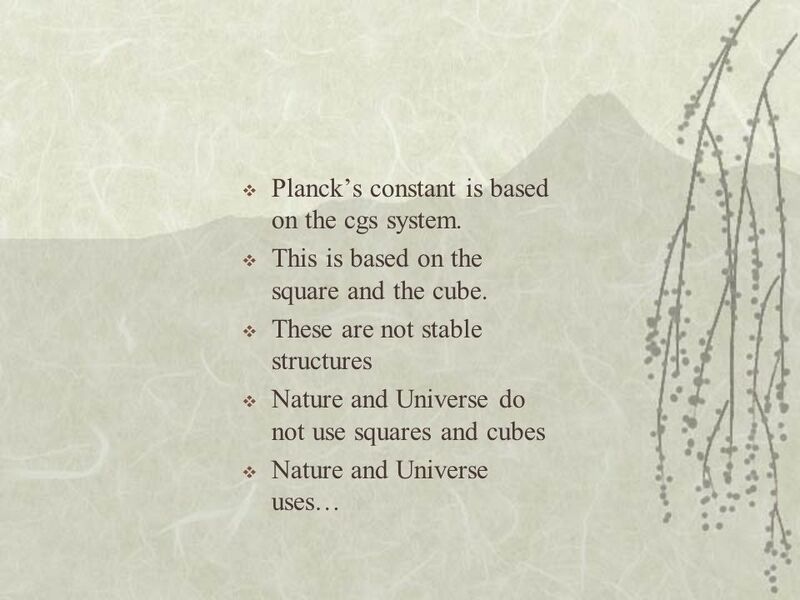 153 Planck’s constant is based on the cgs system. 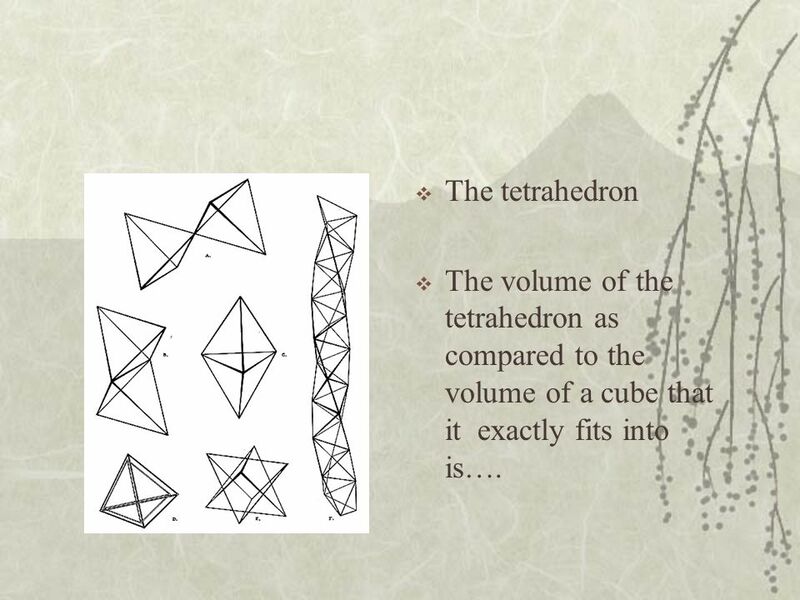 154 The tetrahedron The volume of the tetrahedron as compared to the volume of a cube that it exactly fits into is…. 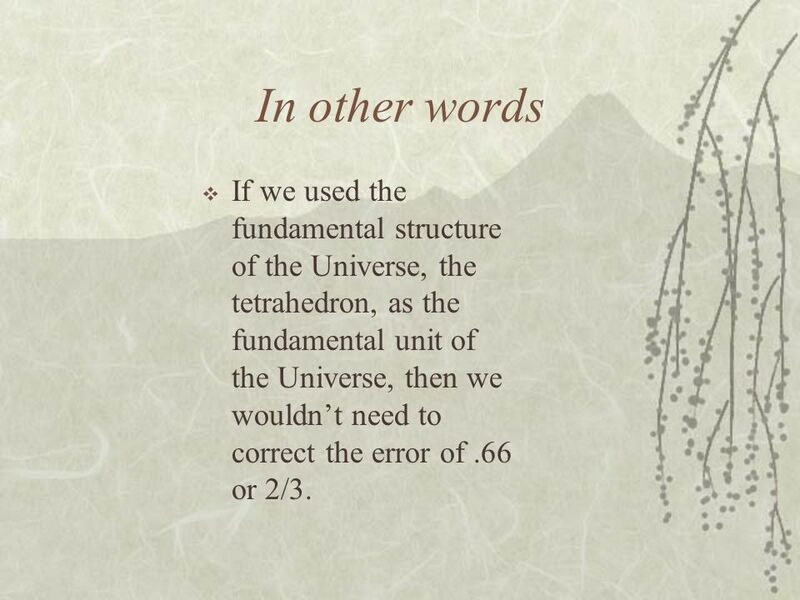 156 In other words If we used the fundamental structure of the Universe, the tetrahedron, as the fundamental unit of the Universe, then we wouldn’t need to correct the error of .66 or 2/3. 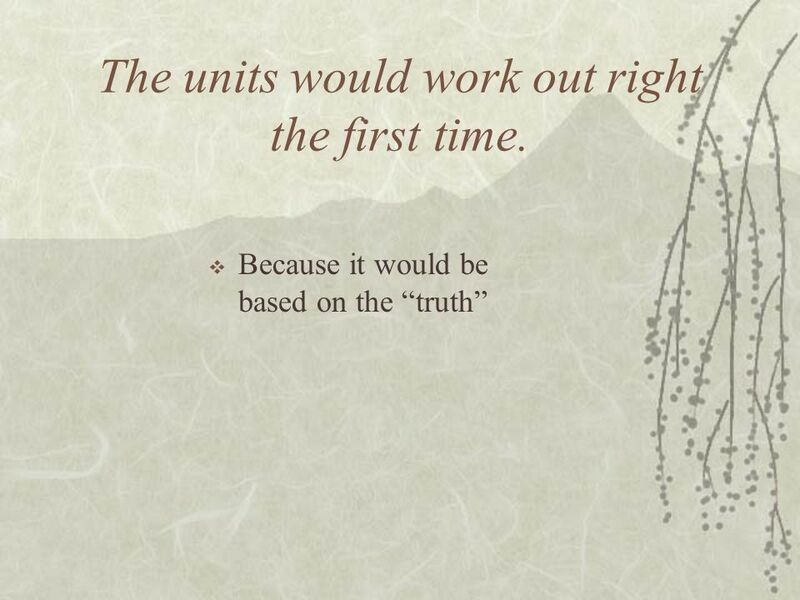 157 The units would work out right the first time. 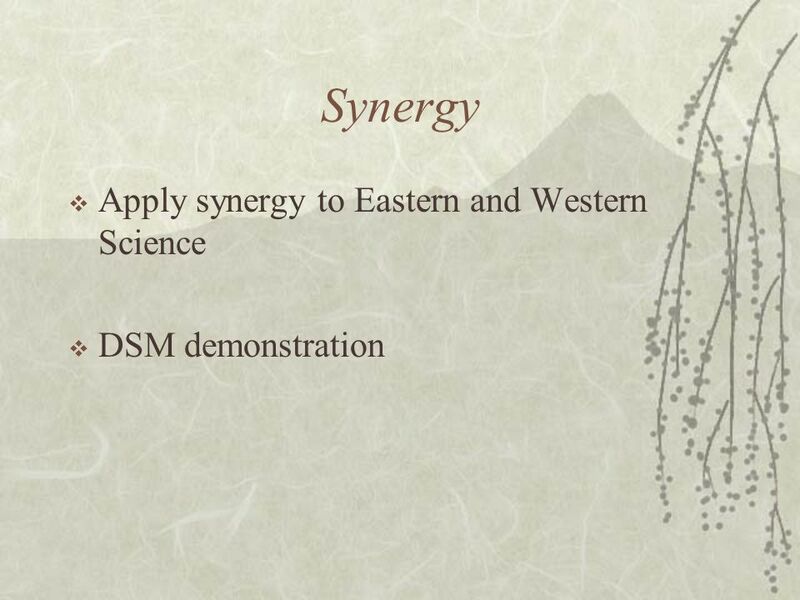 Download ppt "The Synergetics of Science and Spirituality: Action Research in the Practical Integration of TOK and Group Four Presented by Lorne Young to VRA April." 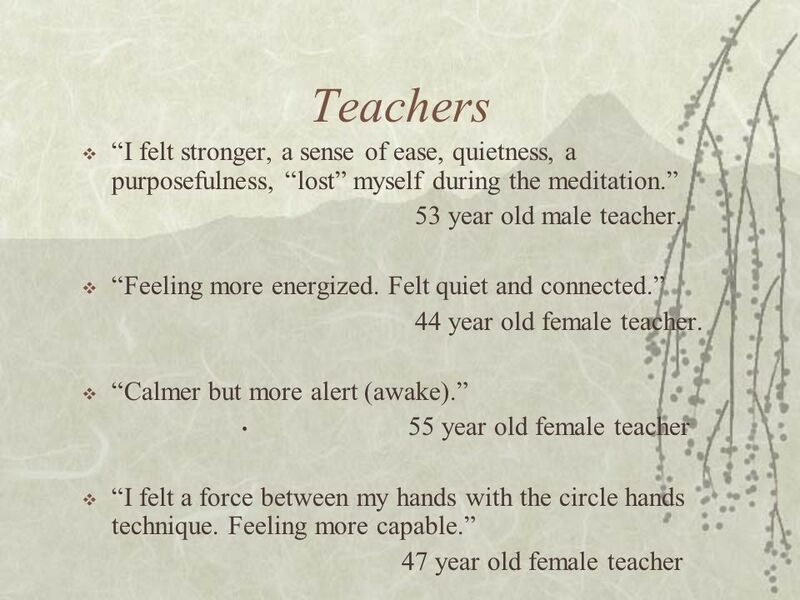 What is it like to be me? 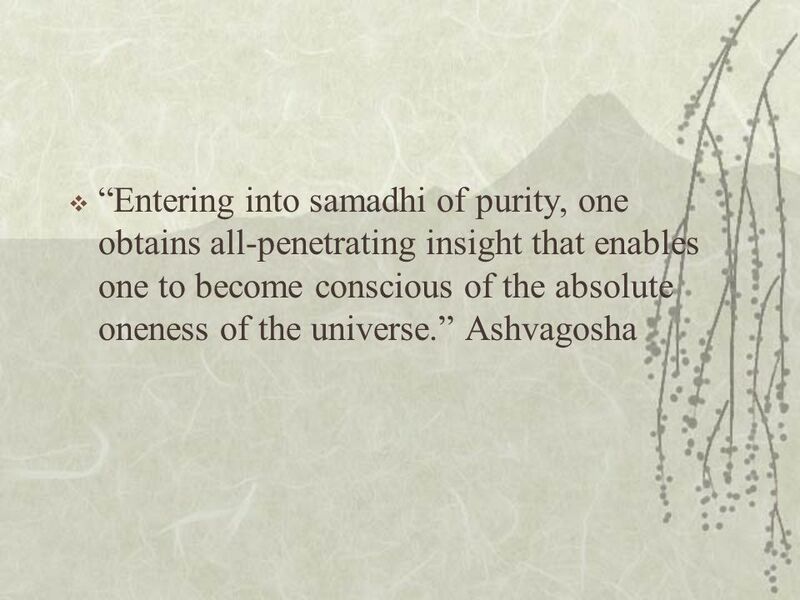 Trying to understand consciousness. 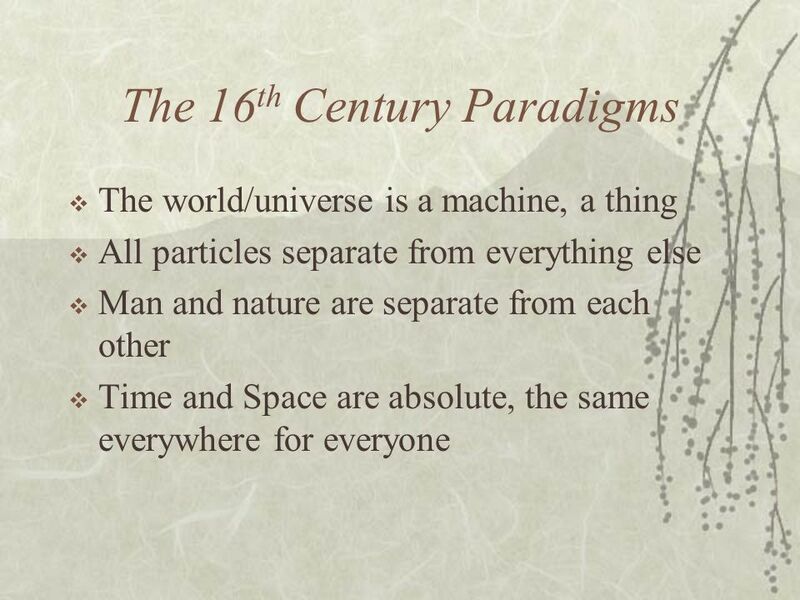 Actually, we need not speak of particles at all. 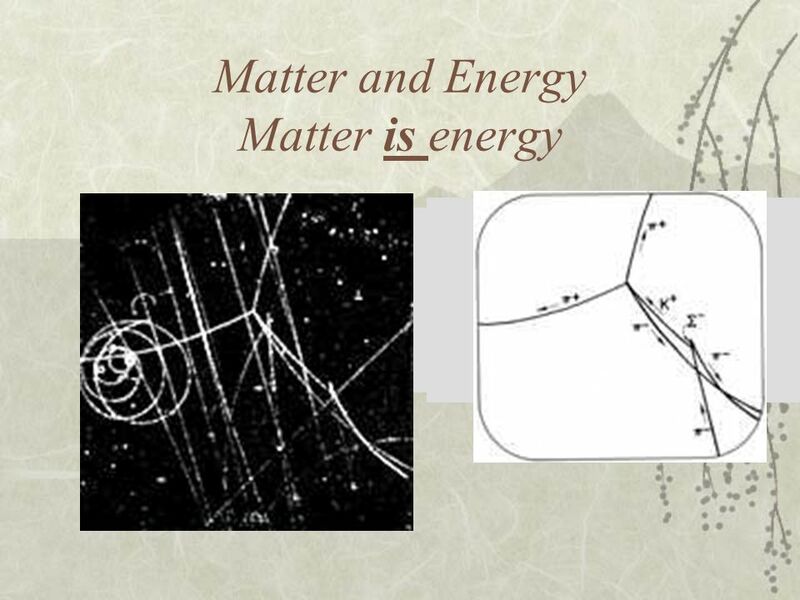 For many experiments it is more convenient to speak of matter waves... 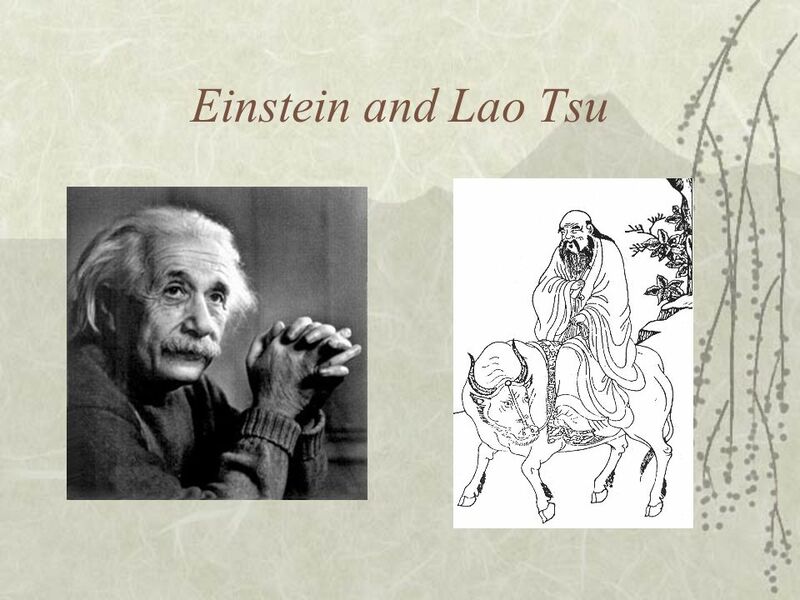 The two pictures are of course. 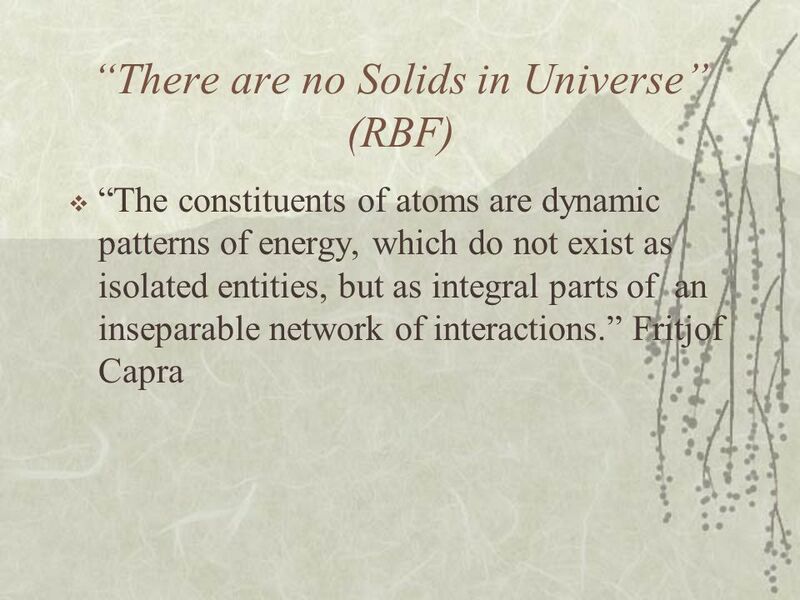 The world of Atoms. 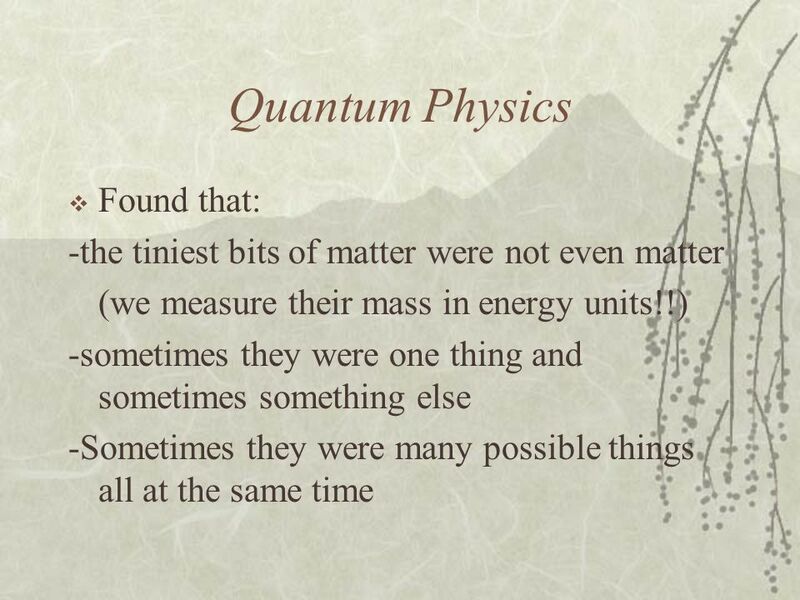 Quantum Mechanics Theory that describes the physical properties of smallest particles (atoms, protons, electrons, photons) "A scientific. 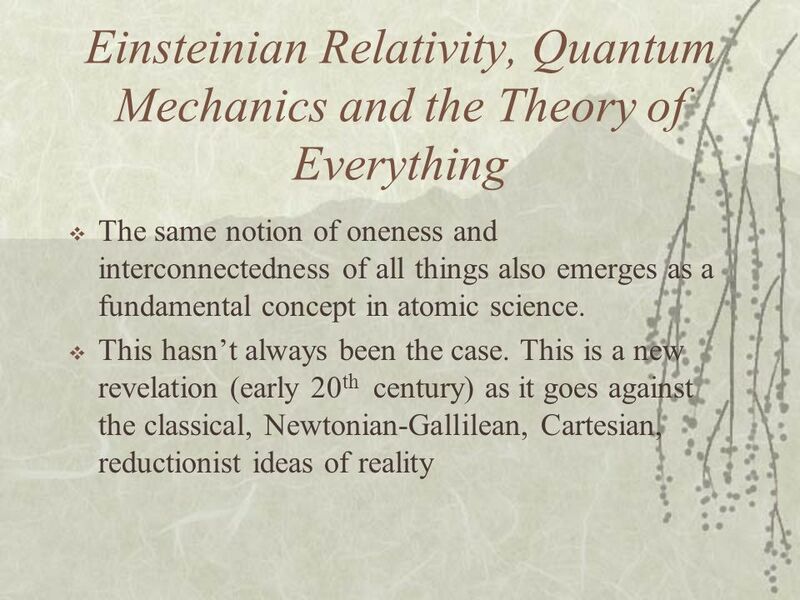 Quantum Theory of the Atom Chapter 7 Dr. Victor Vilchiz. 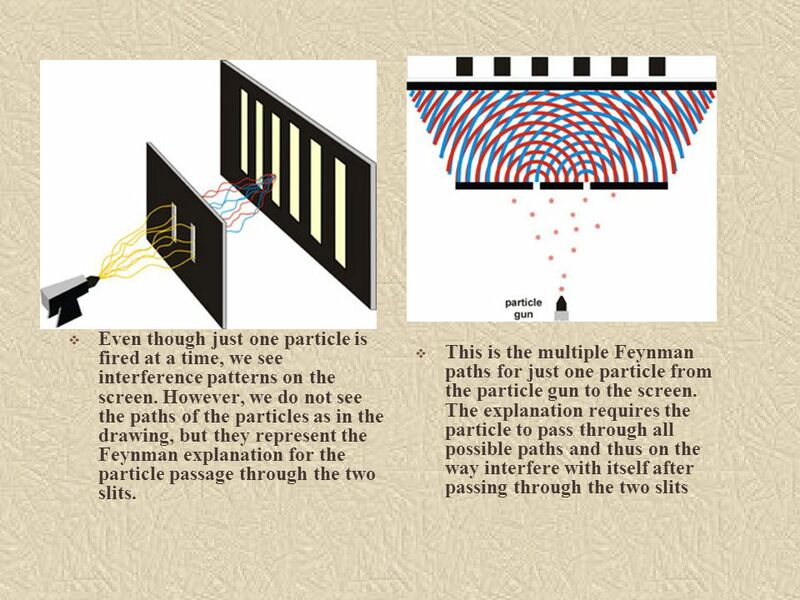 Lecture 4 - Feynmans thought experiments Things on a very small scale behave like nothing we have direct experience about. 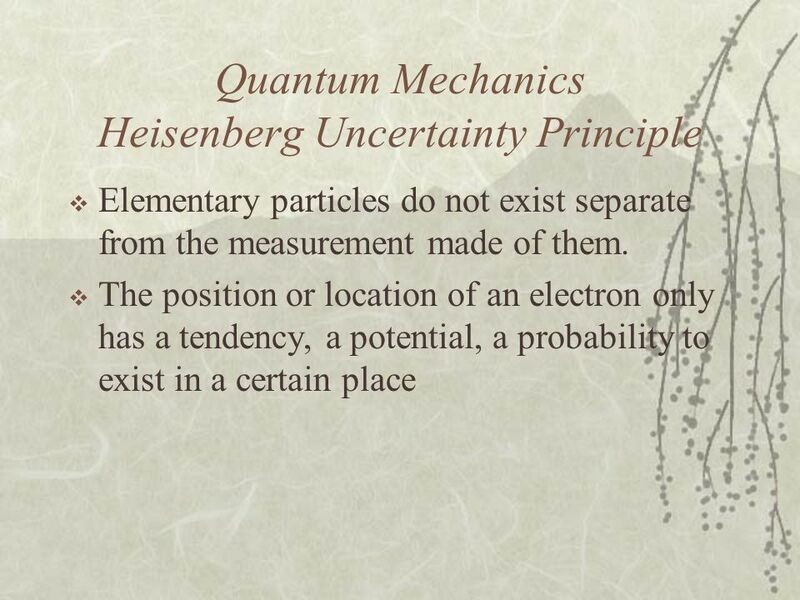 Even the experts do not uderstand. 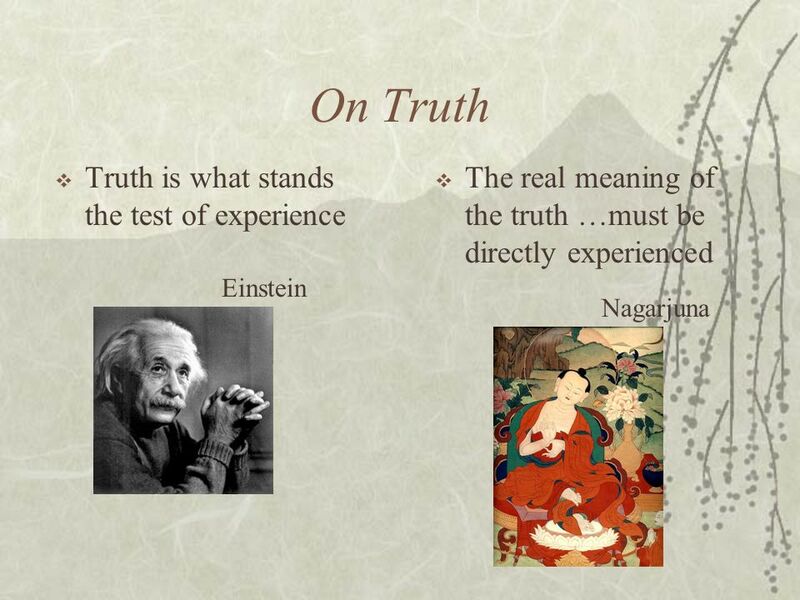 How do we know what we think we know is true? 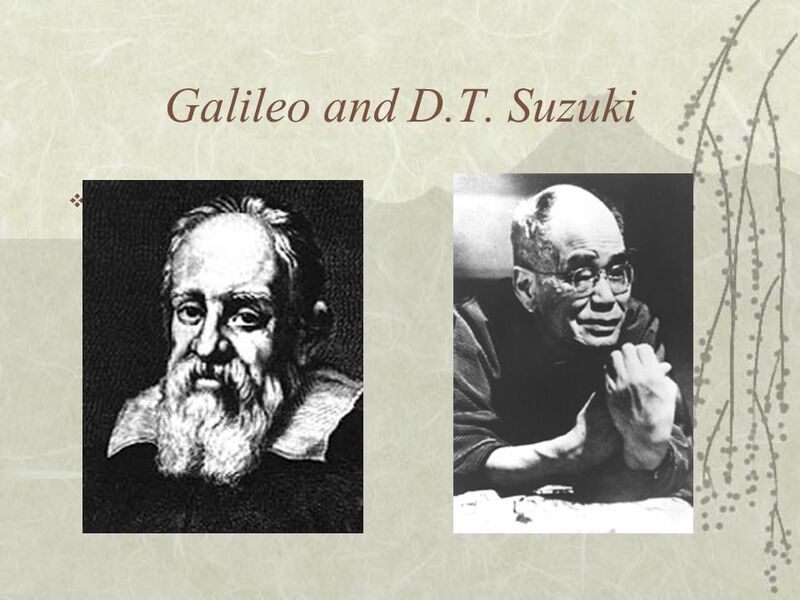 Einstein, revolutionised Physics with his thought experiments Galileo, father of experimental physics. 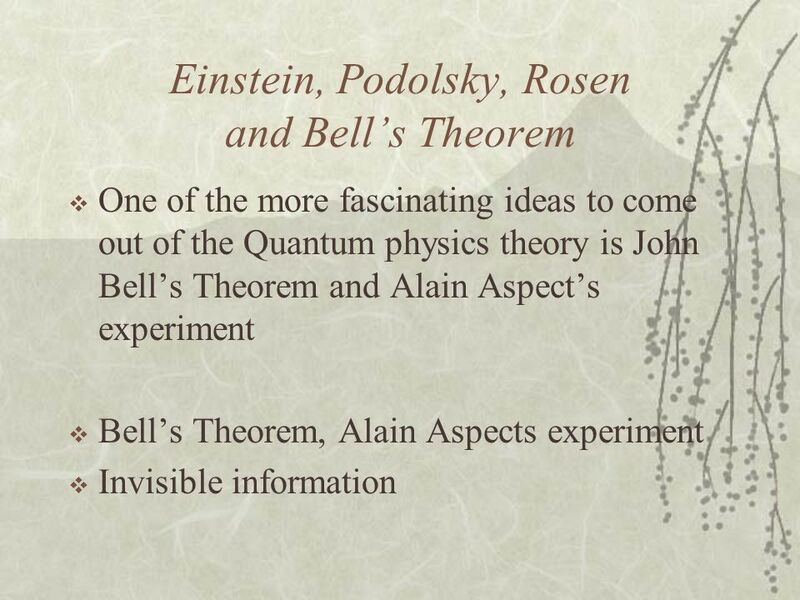 Physicists. 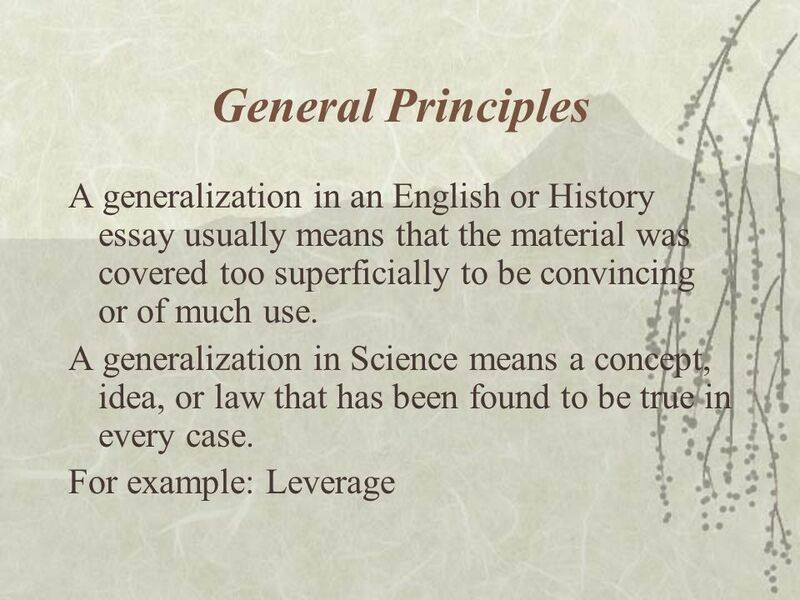 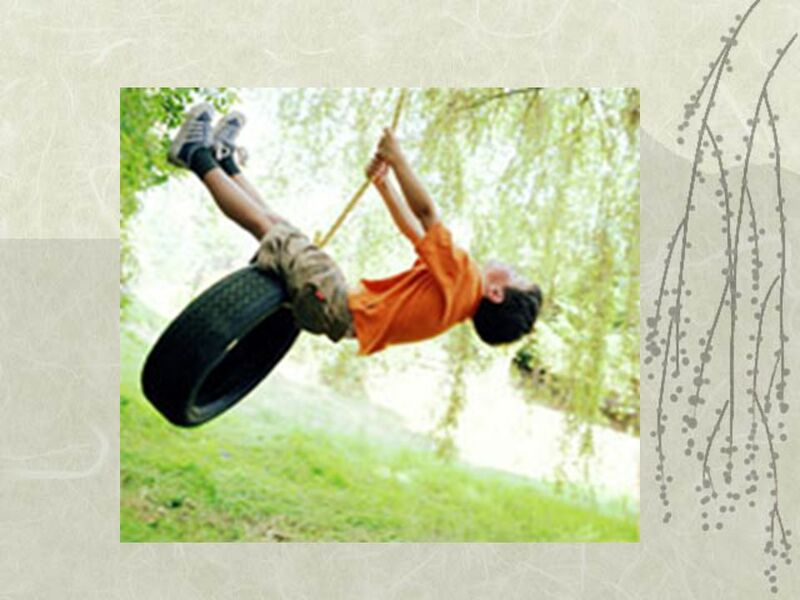 The Uncertain Nature of Gravity An Illustration of Science as a Process of Investigating Nature.